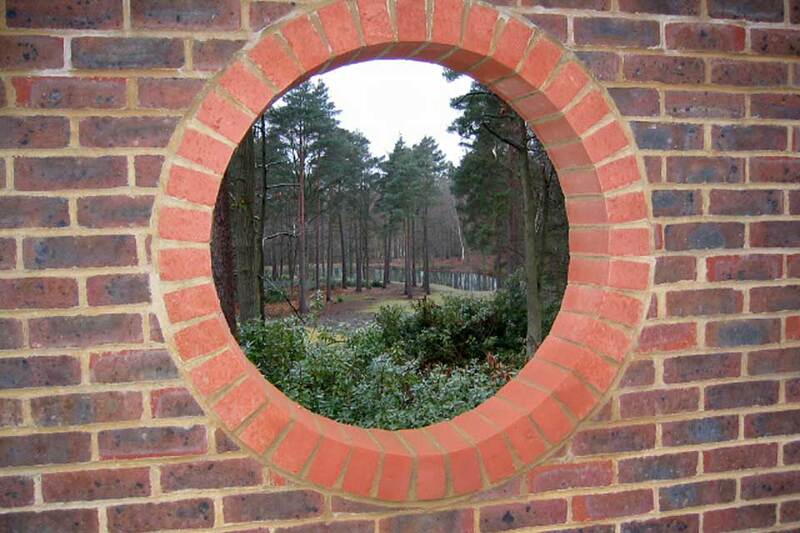 Because each of these projects is unique, due the location, style, resources and requirements of the clients and/or their designers, the photographs in this Project Gallery can only show their flavour. 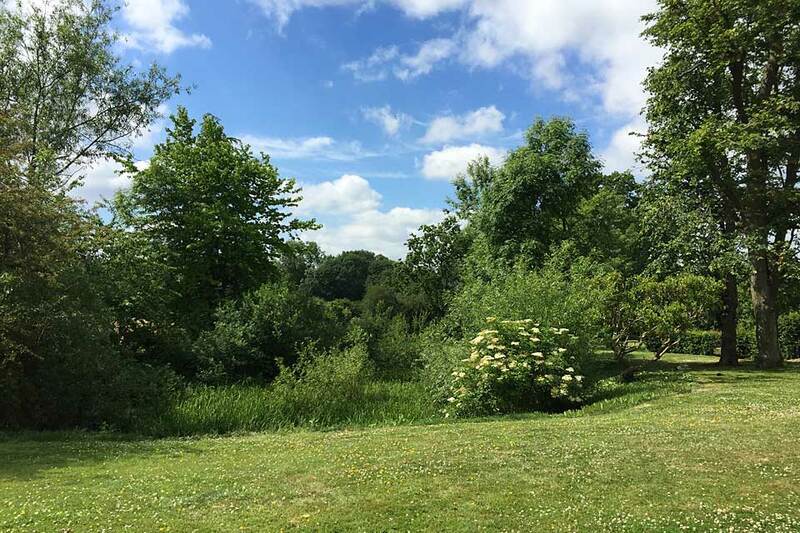 None will be exactly what you may have in mind, however there may be features in some of them which can stimulate a discussion as to what would be appropriate for your location. 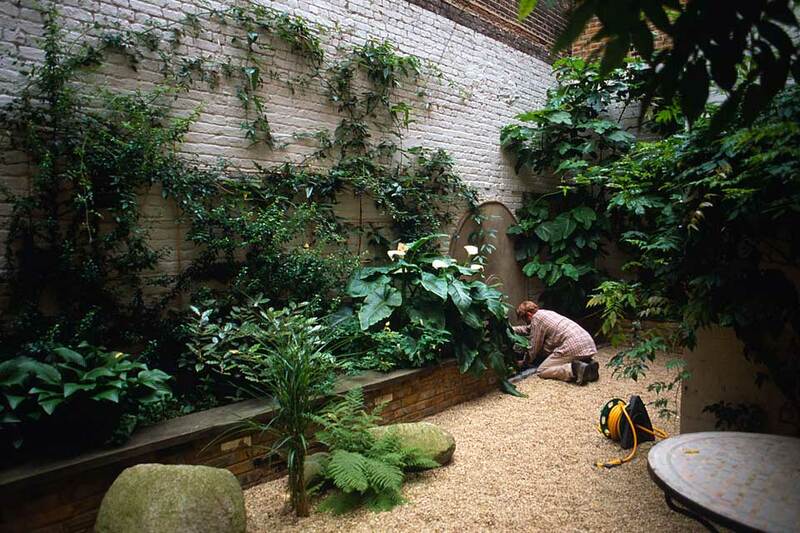 The still photograph cannot reproduce the sound, scent or feel of a living water feature. 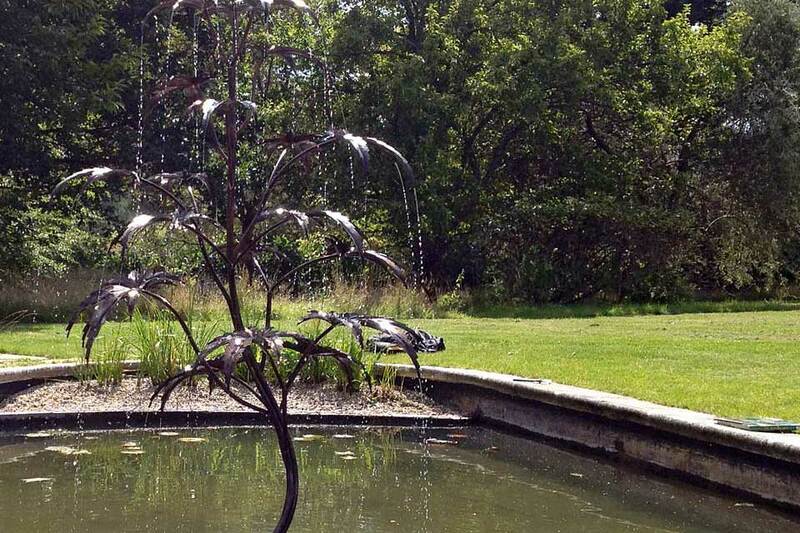 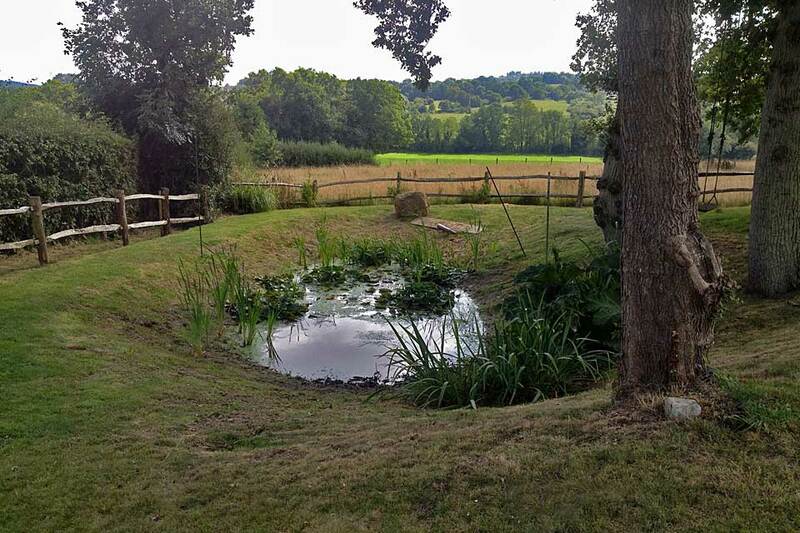 Mr and Mrs Vernon asked us to redesign and rebuild an existing pond in their grounds. 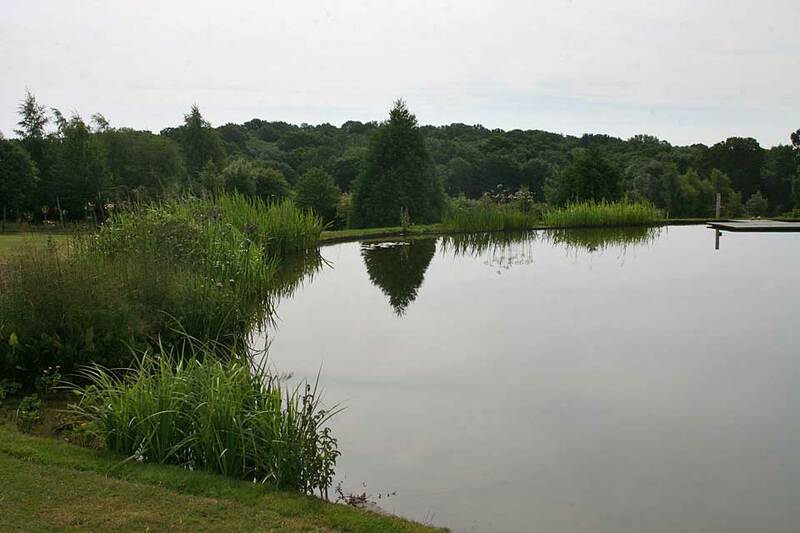 The pond had been affected by the varying water table and was unsatisfactory. 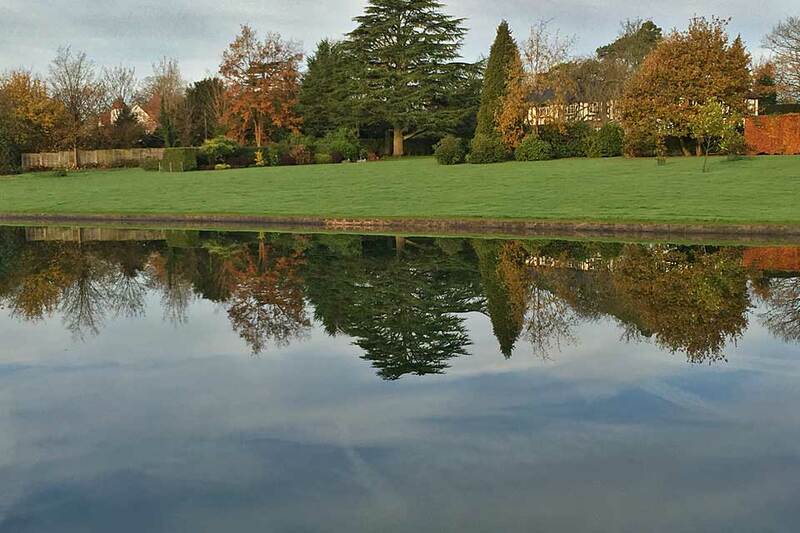 We agreed a new shape and the use of a suitable liner as well as a firm edge which allowed a precise water level and lawn to the water’s edge. 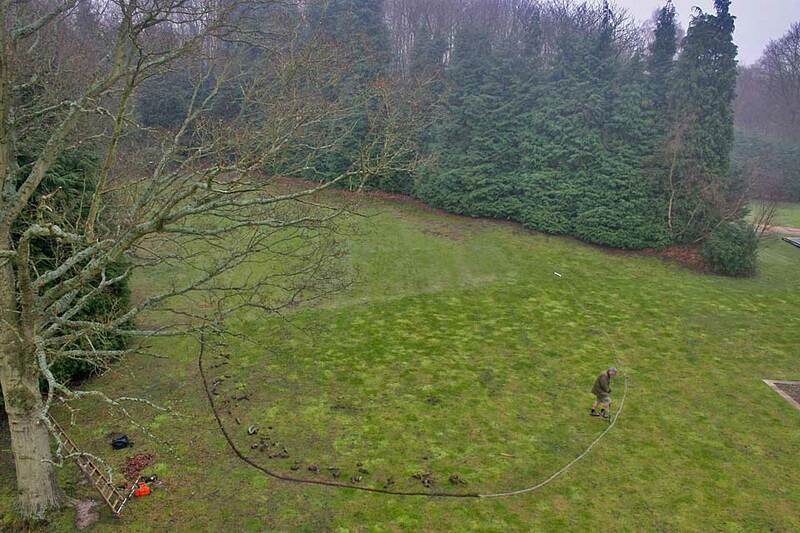 At the same time we buried water, power and lighting cables to various parts of the property. 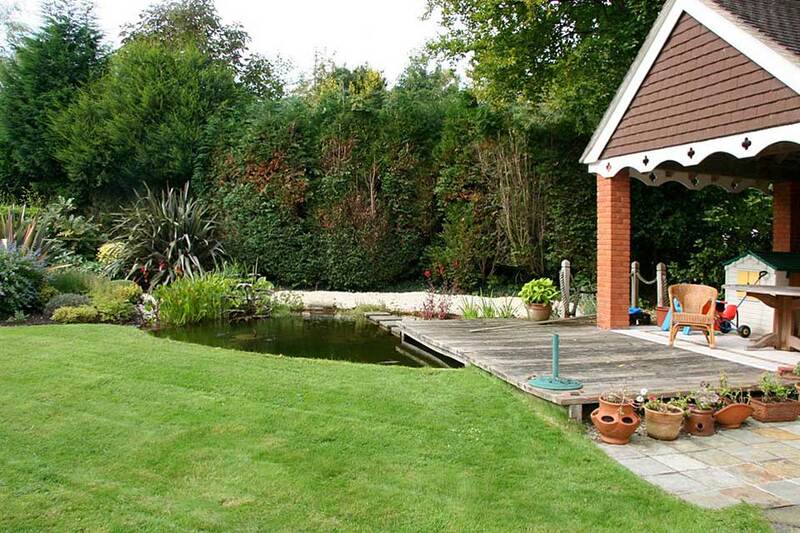 In addition, the clients wanted some decking to allow them to sit on the water during the summer months. 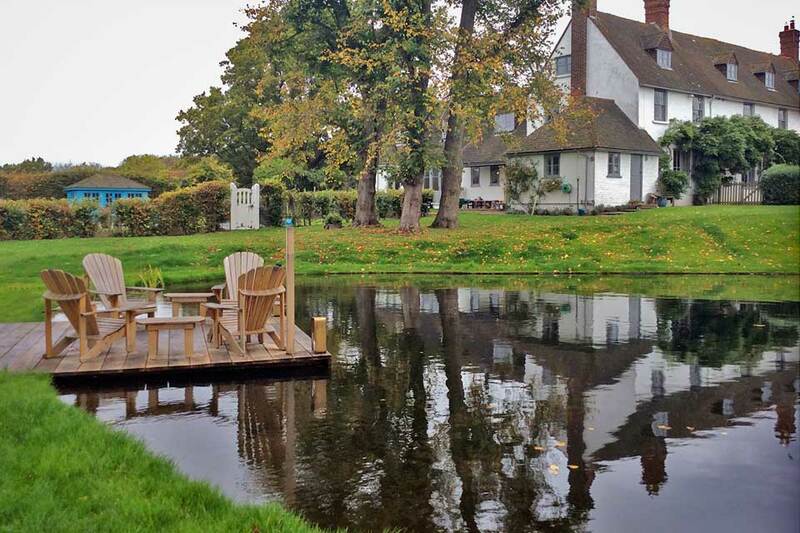 We designed and built a hexagonal deck using oak, which allowed for 2 Adirondack chairs and a table, to be able to sit comfortably. 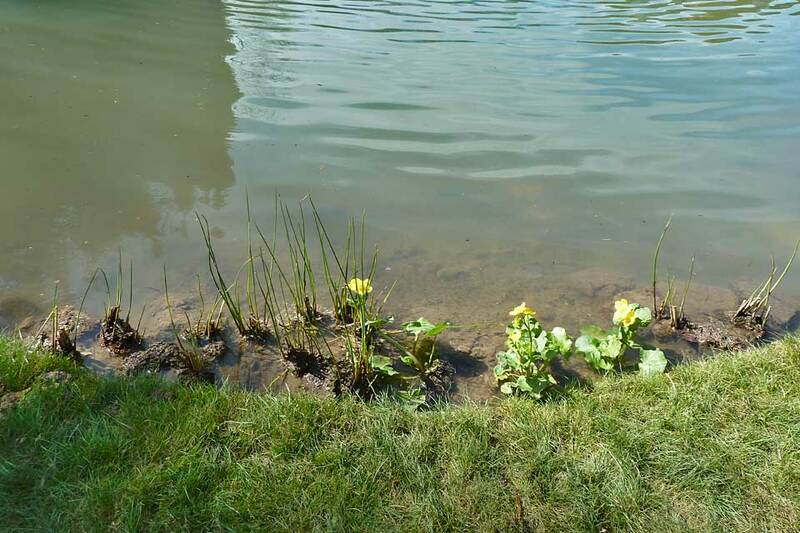 We also built edge planting pockets, placing waterlilies and sub-aquatic plants. 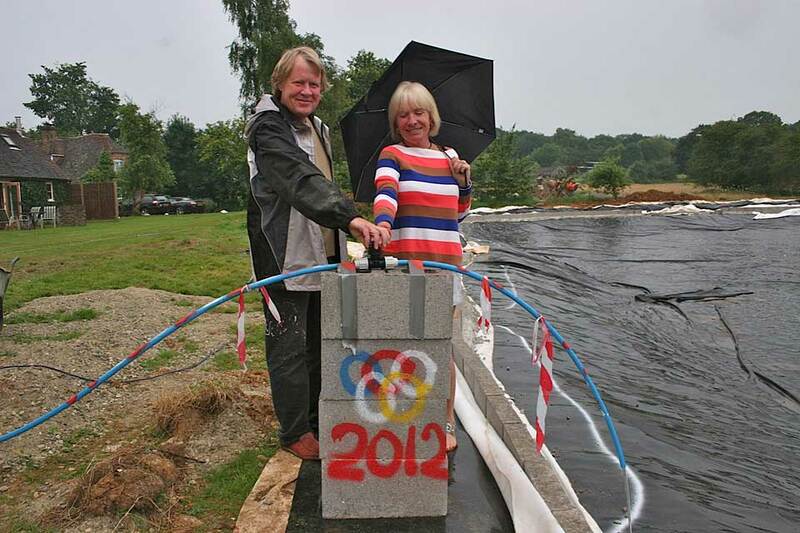 Mr and Mrs Vernon are delighted with the project. 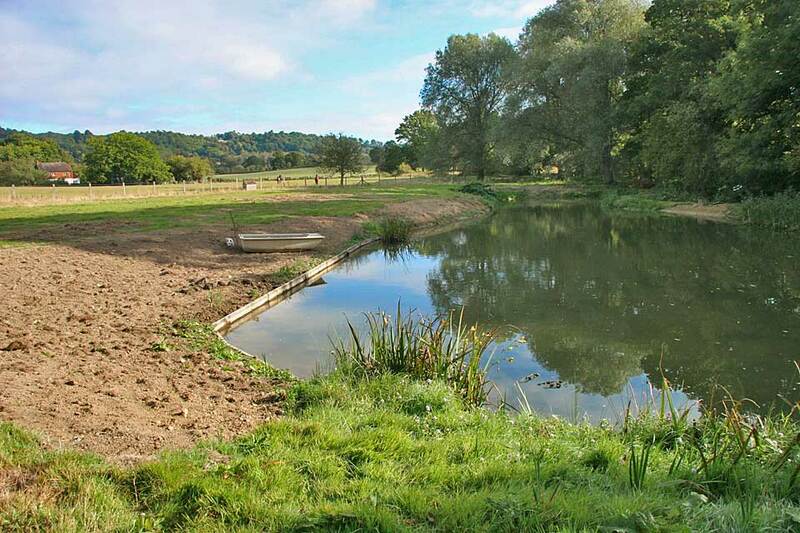 A landowner asked us to look at a large pond in which the water level had radically fallen. 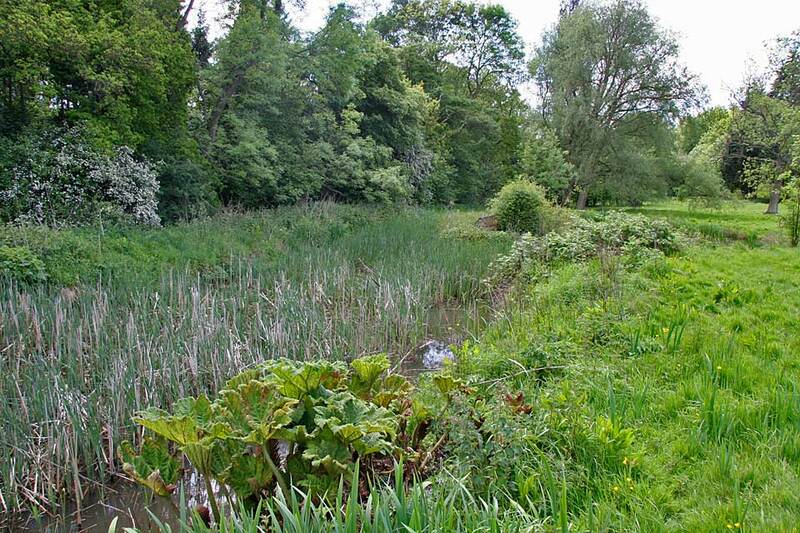 It was overgrown and full of detritus. 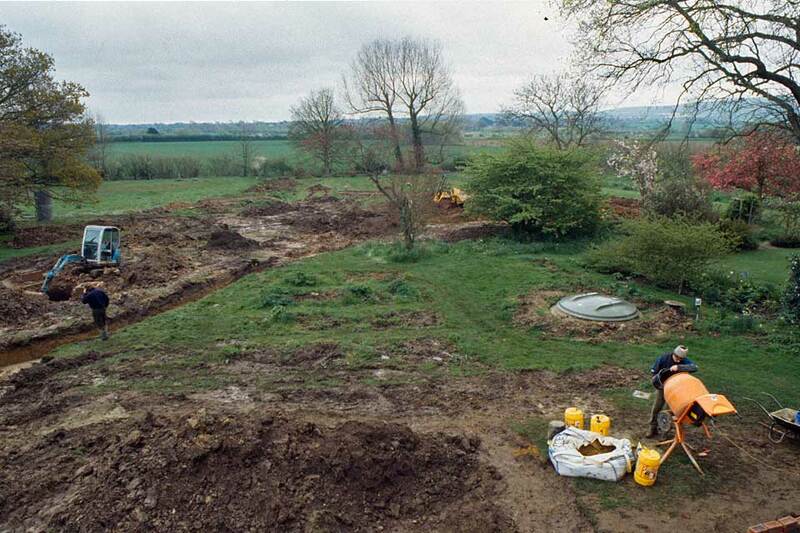 The subsoil was clay. 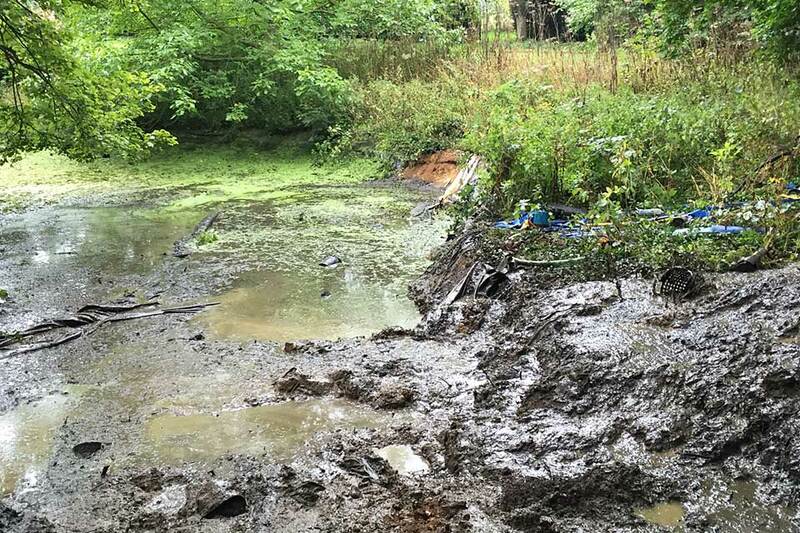 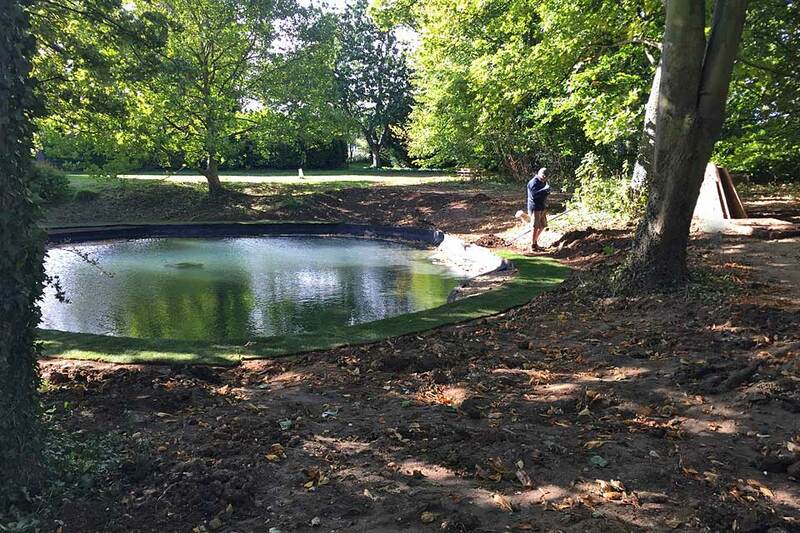 The pond was easily approached with a large (14 ton) excavator and we were able to pump it out, placing the detritus in a nearby field. 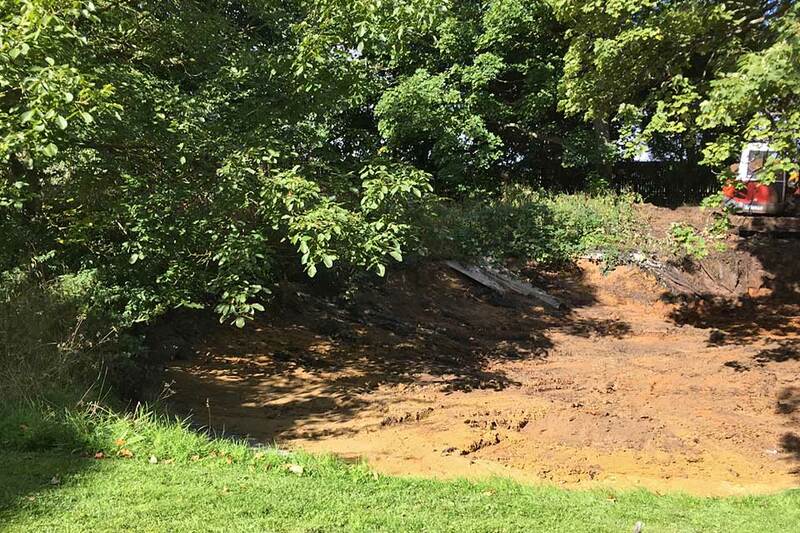 This revealed erosion in the bank, alongside the stream which accounted for the loss of water. 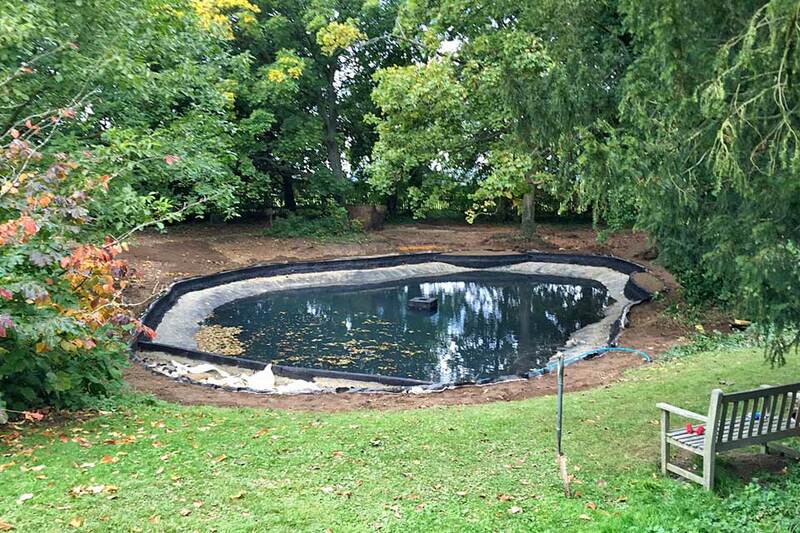 We were able to address this by taking good clay from another section of the pond and built it up, compacting it with a gentle batter as well as restoring the old overflow system. 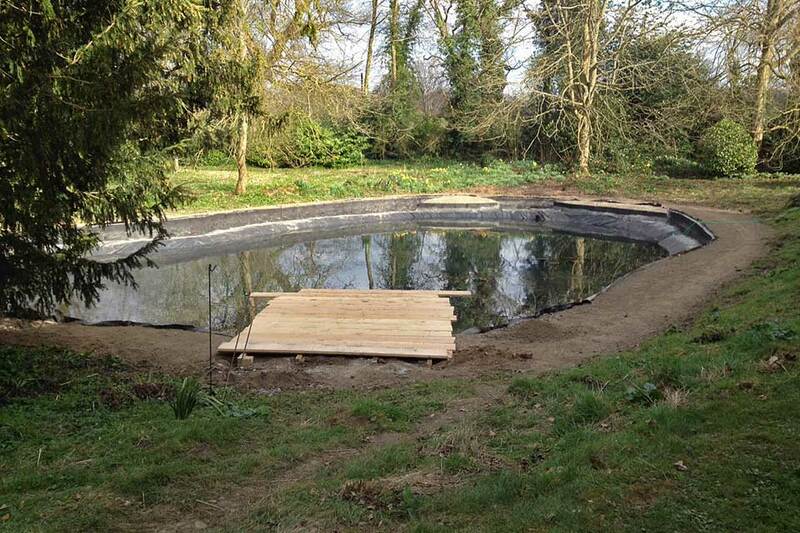 After discussion with the client, we build a hard edge on the side where the pond is approached using 8 by 2 inch oak boards and 4 inch by 4 inch uprights. 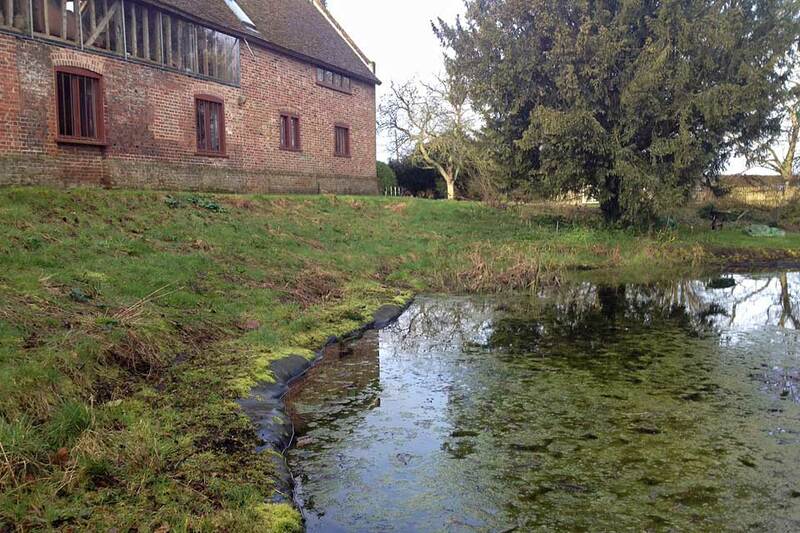 We also allowed for planting pockets at appropriate intervals and re- profiled the land near the pond. 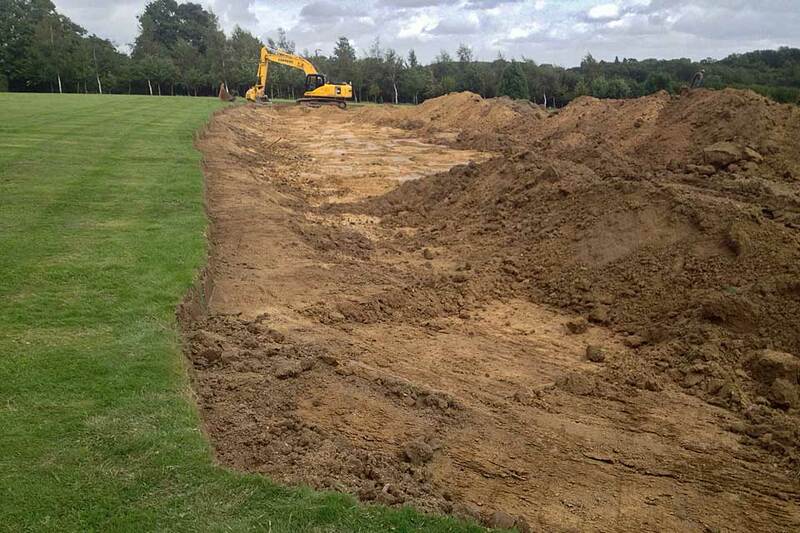 The clearing and repairing operation took four days and further works another two. 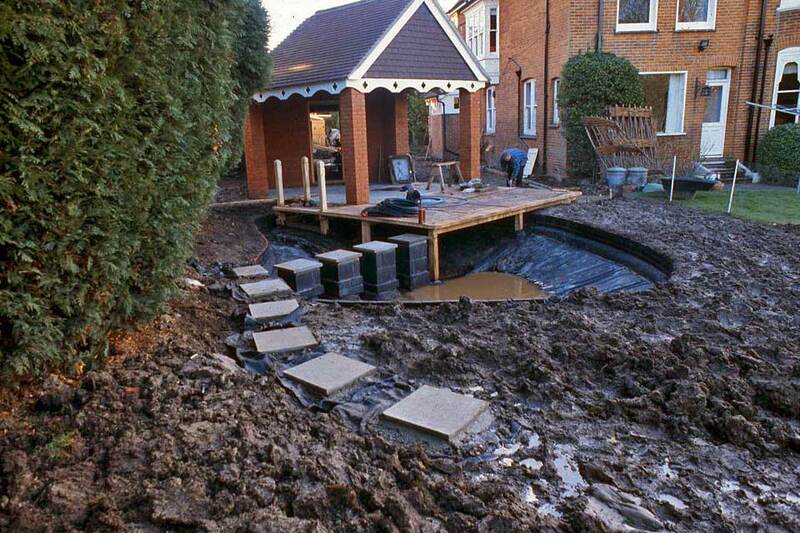 All were delighted with the result.. 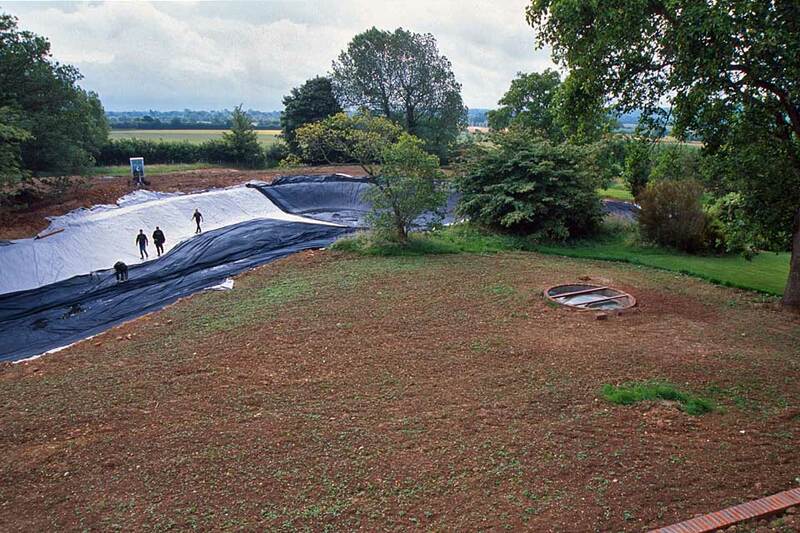 I n the year 2000, on a flood plain by the river Dart in Devon, we built a lake using the supply from the Dart to fill it. 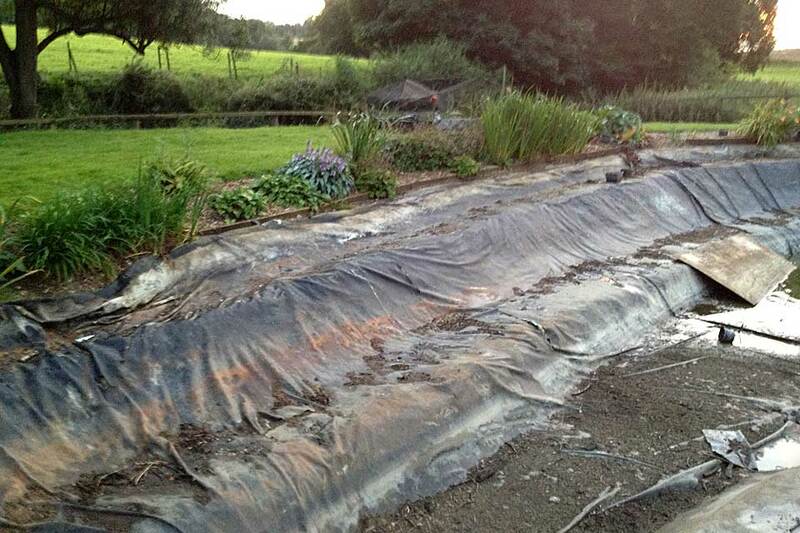 The overflow used 36 inch double skin pipe and is hidden under decking. 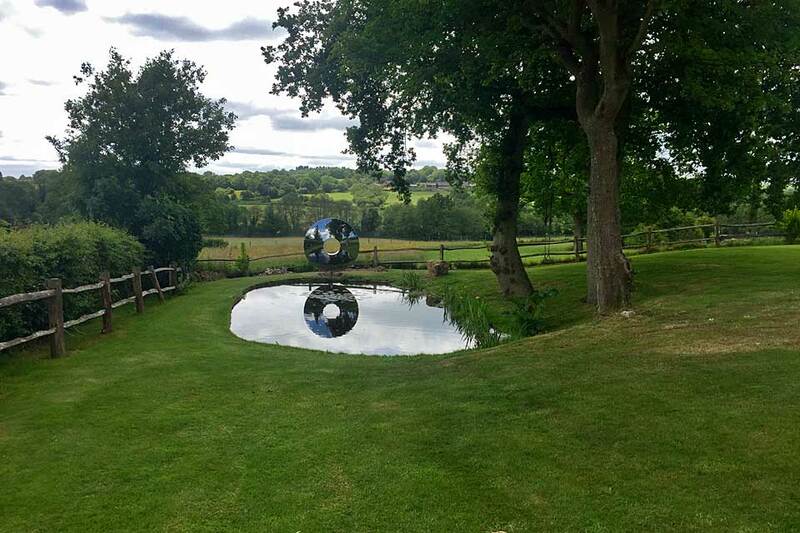 We revisited in the summer of 2015. 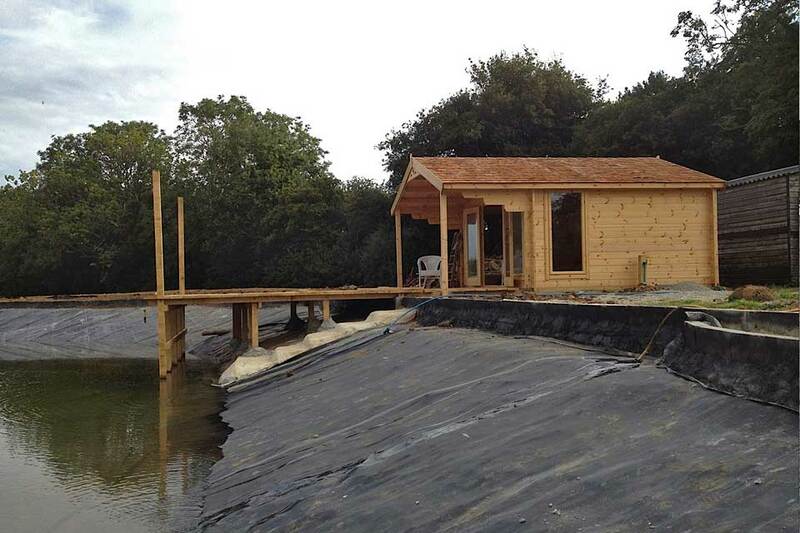 The present owners had built holiday cottages for fishermen beside it and said “ it could not have been better”. 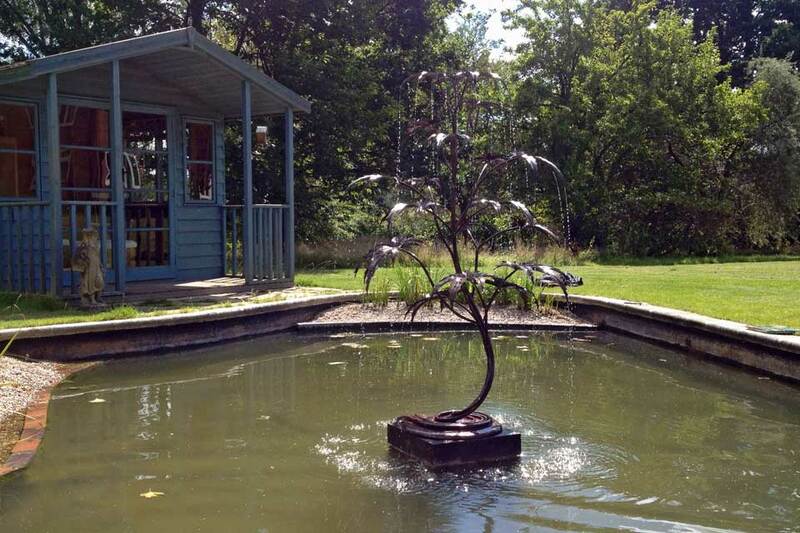 It has matured nicely and the trees we planted beside it had grown into an arboretum. 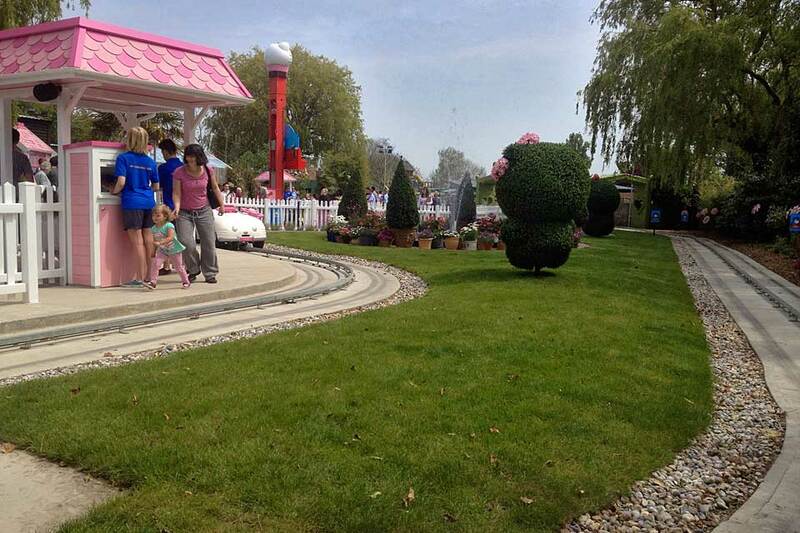 As part of a new feature at the zoo a fountain was required for the Hello Kitty ride. 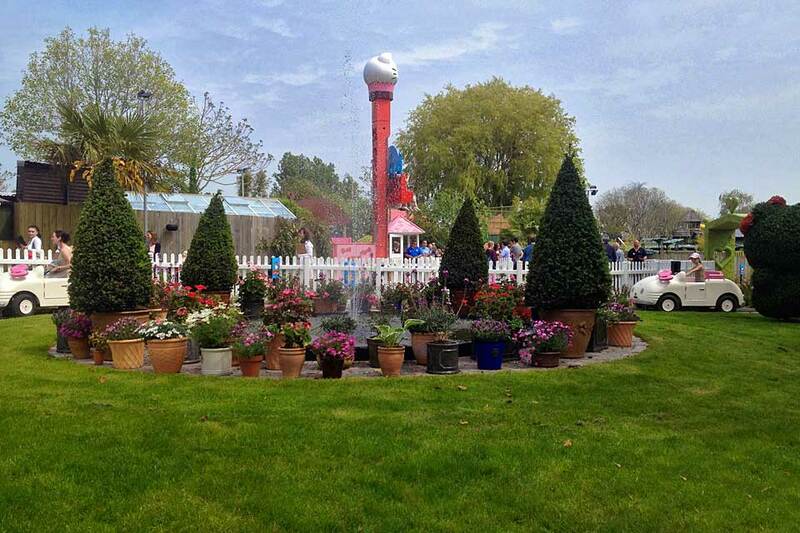 This we built in the depth of winter for a spring opening working inside the track for a car ride. 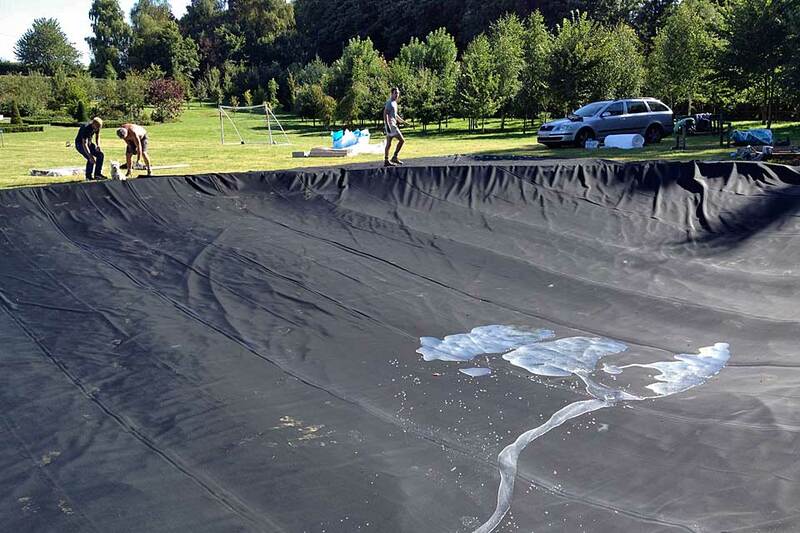 Sealed with fibreglass, the shallow pool adds sparkle to the delightful project. 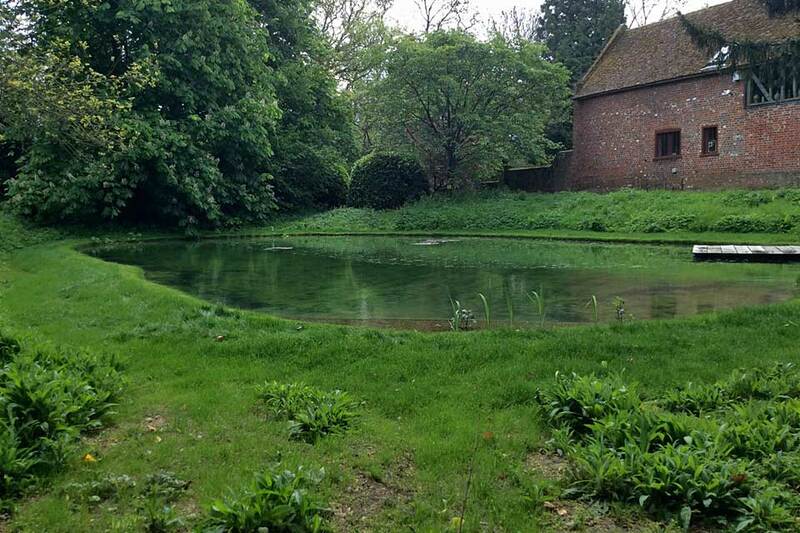 Mrs Borthwick had a small green pond with fluctuating water level which could be seen from the house. 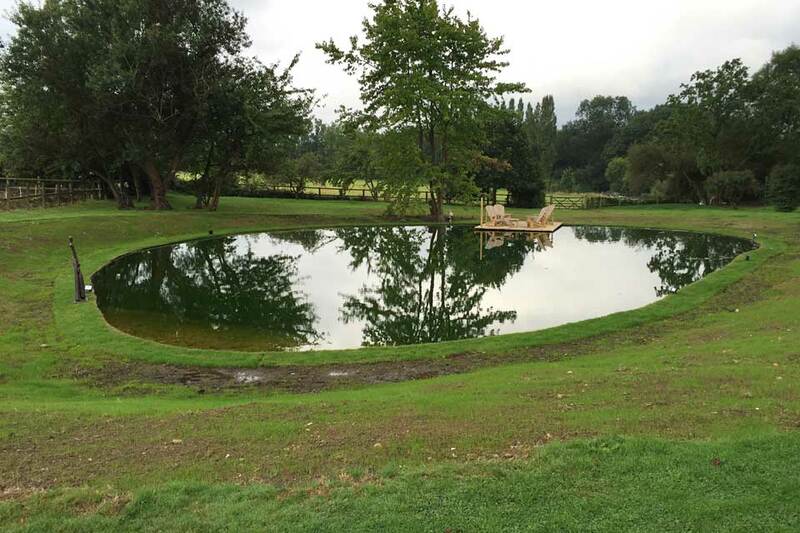 We cleared out the detritus by hand, established an underliner drainage system, lined and edged it, raising the water level as high as practical in preparation for a sculpture placed to make the most of its reflection. 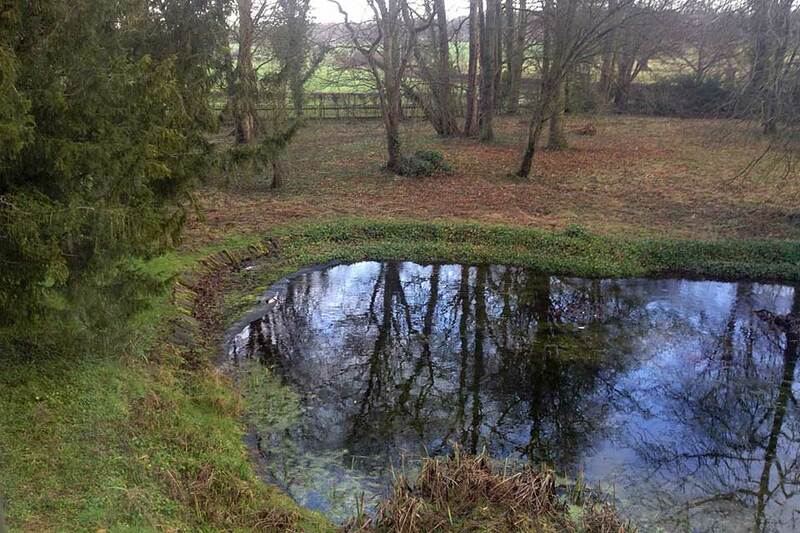 John Sell, a conservation architect, asked us to improve his ponds, this we did in two parts with a year in between. 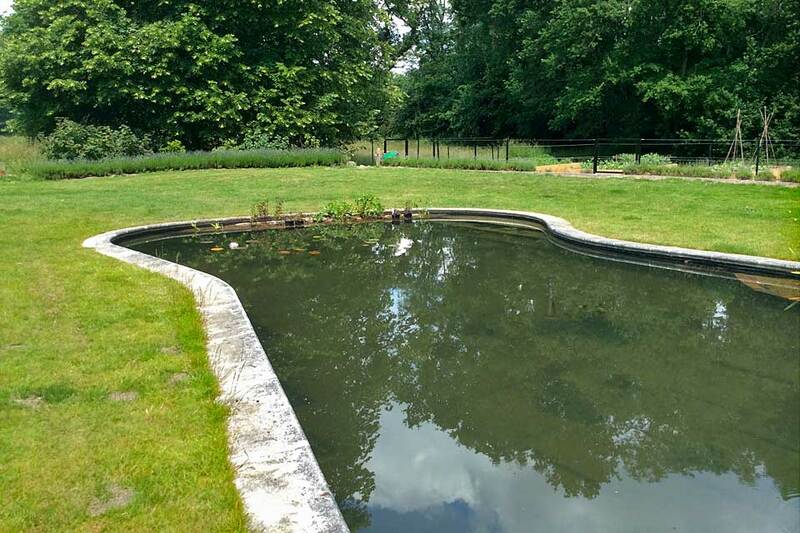 The principal challenges were in removing the detritus which had built up without damaging the ornamental garden which surround the pond. 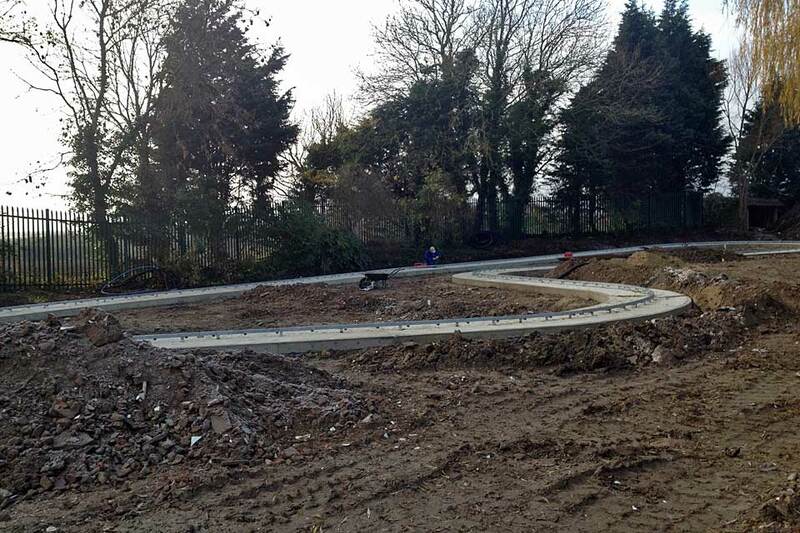 This we achieved using barrow, boards, and a roundabout route. 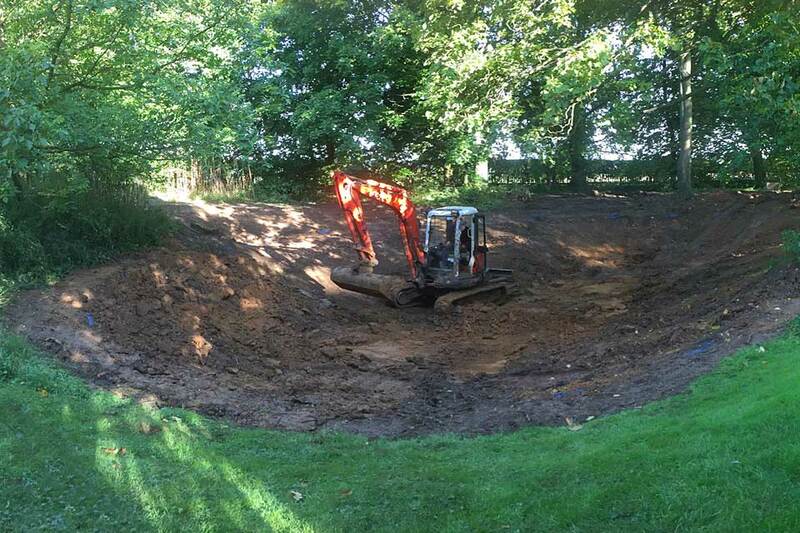 We also had to dig a long and deep soakaway drain for the lower pond, as it was below the surrounding landscape. 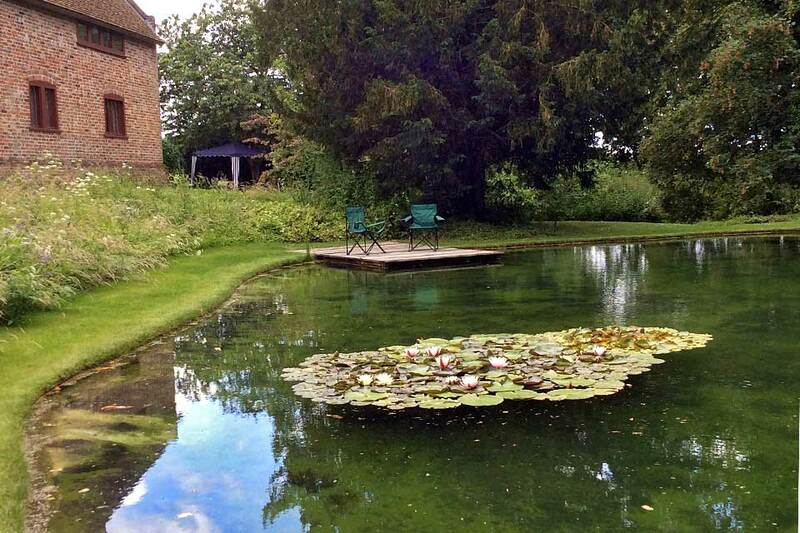 The following spring we planted the large planting pockets and spread underwater plants and water lilies in the shallow parts. 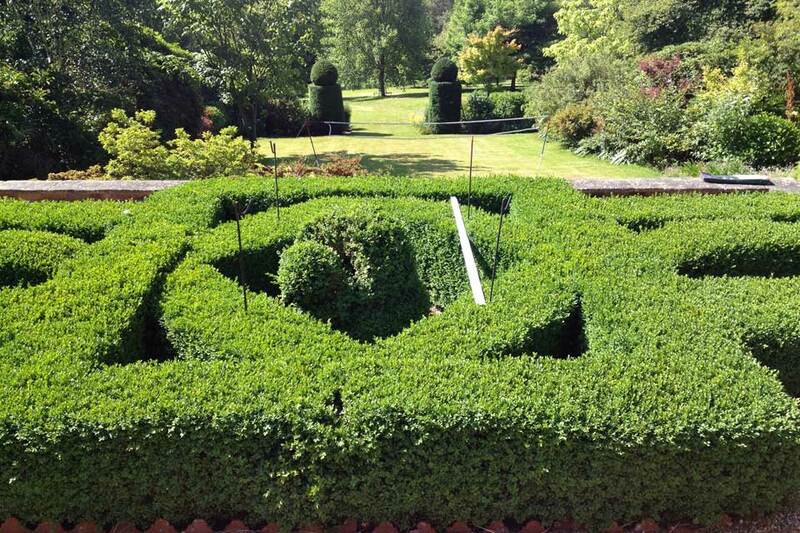 Both we and Mr West are delighted with the result. 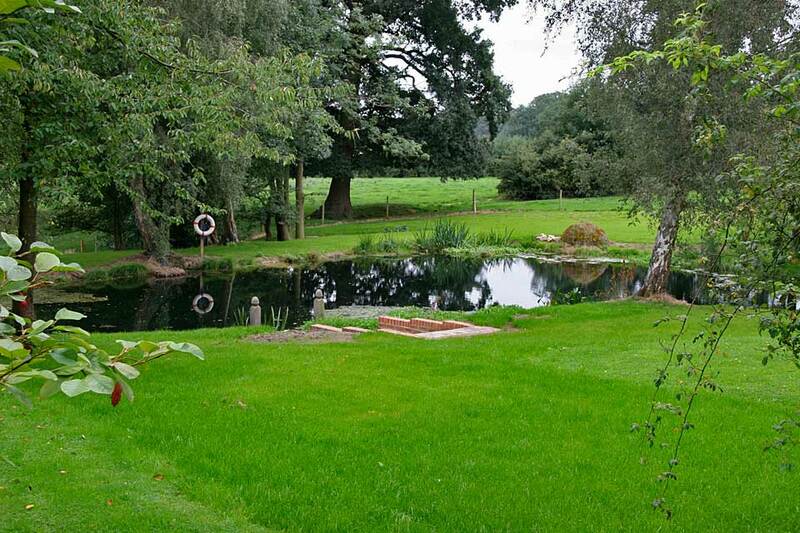 Mr and Mrs Symes had a swimming pool that they wanted converted into a natural pond. 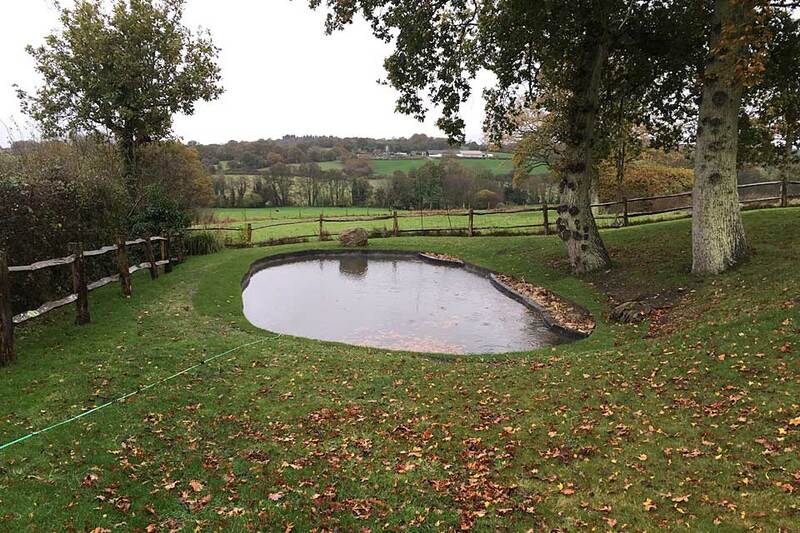 We removed several outbuildings in preparation for a new greenhouse, broke up the reinforced concrete surround and built a false- bottom bore, followed by a plinth for a Humphry Bowden copper water feature. 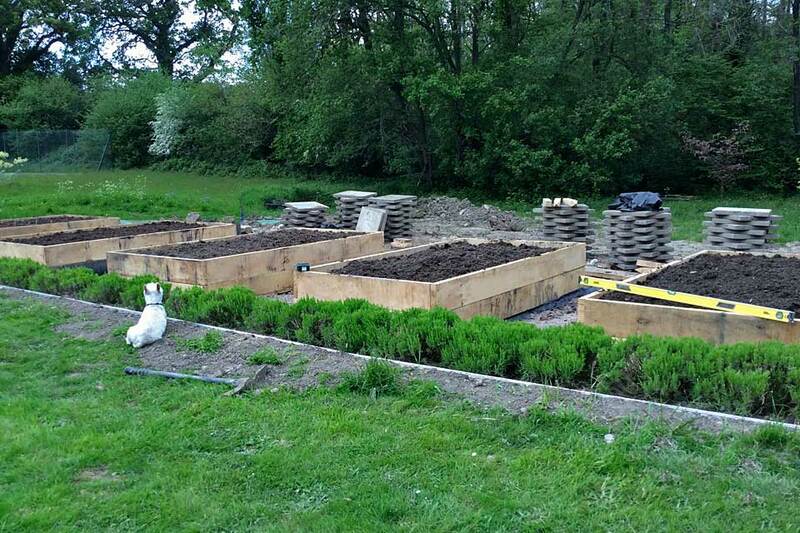 We then built then a new raised bed vegetable garden with stainless steel wires to keep out the deer. 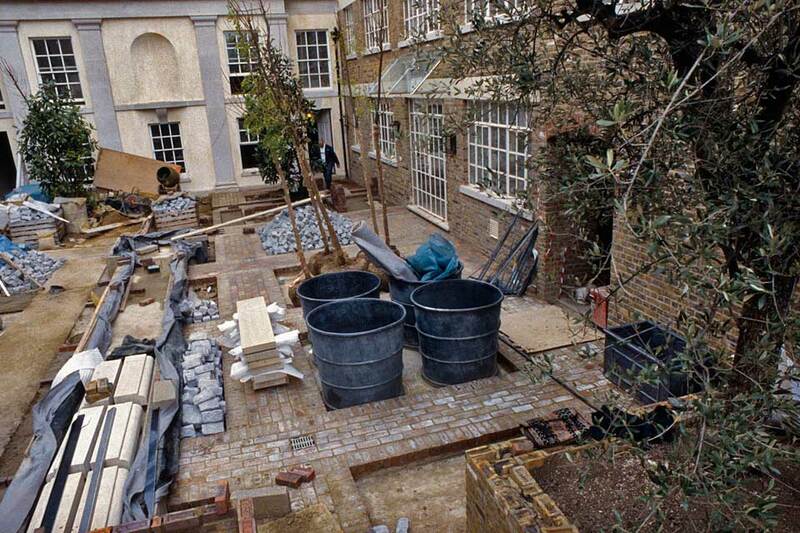 The house was undergoing a major refit when we were called in. 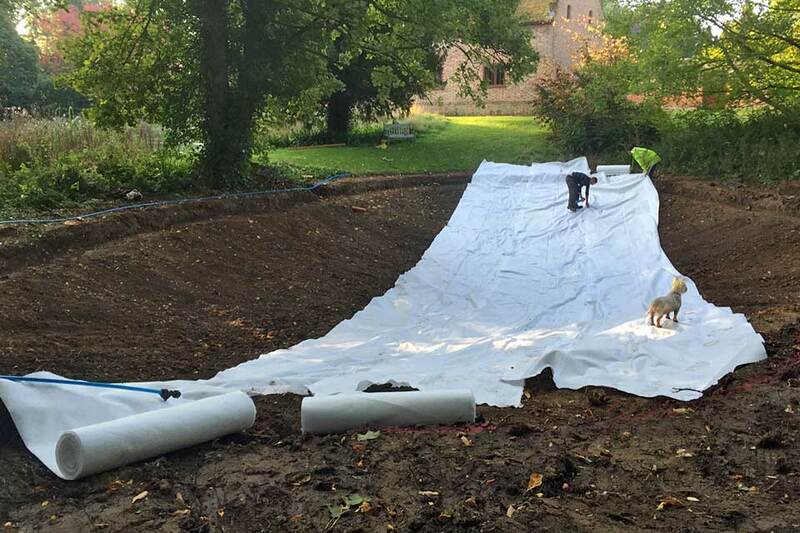 We used the chalk for the dig to build up the embankment and set the water level to be a “reveal” as you go up the drive. 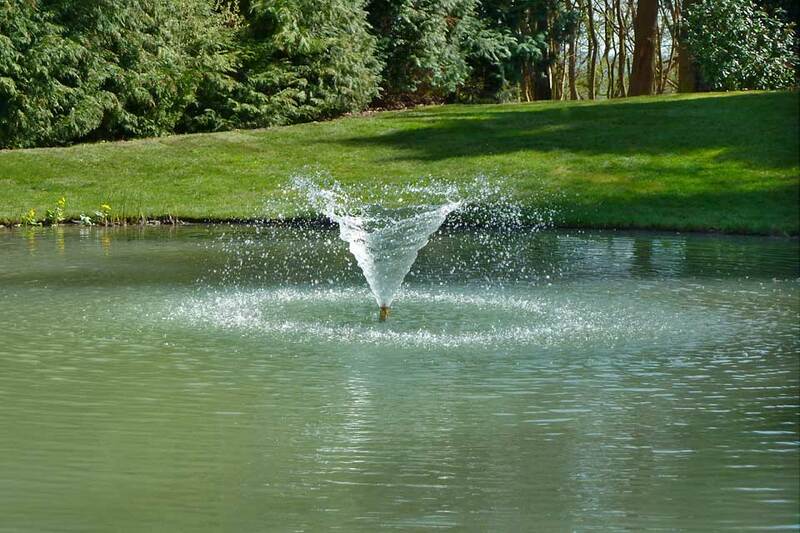 The water supply to the house was insufficient so we recommissioned a borehole pump to bring tasty water to fill the pond. 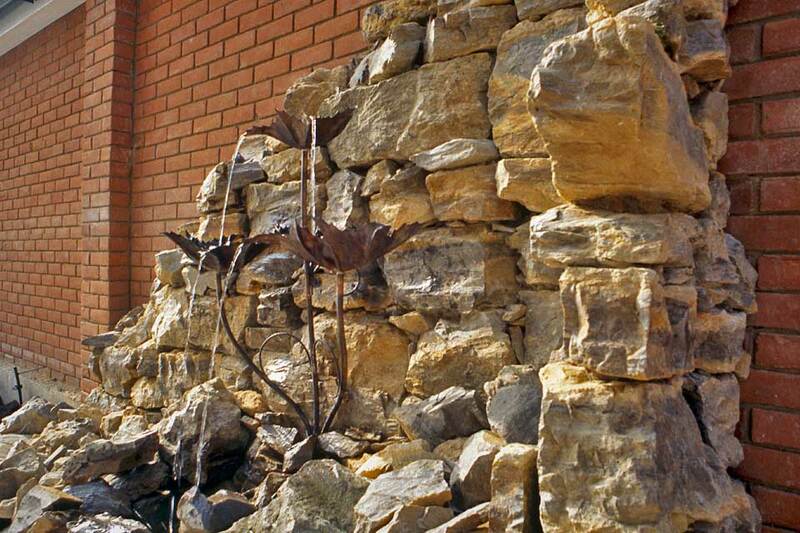 As an add-on we built various walls and steps around the area. 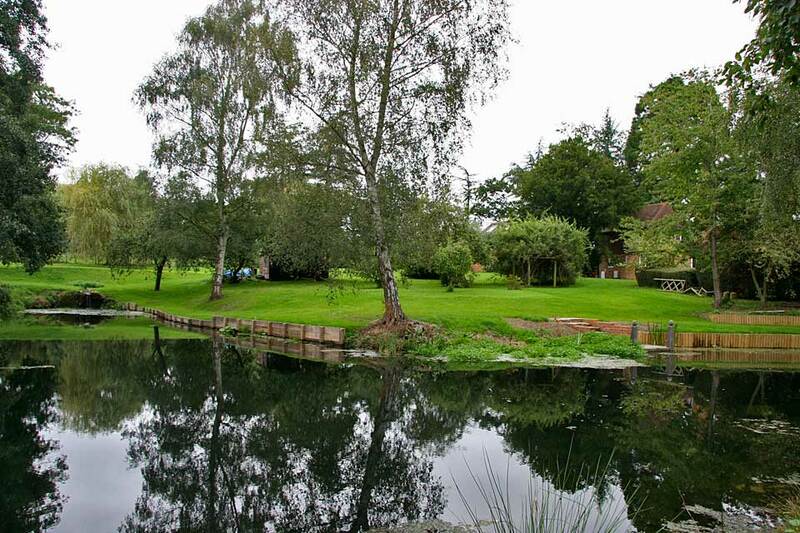 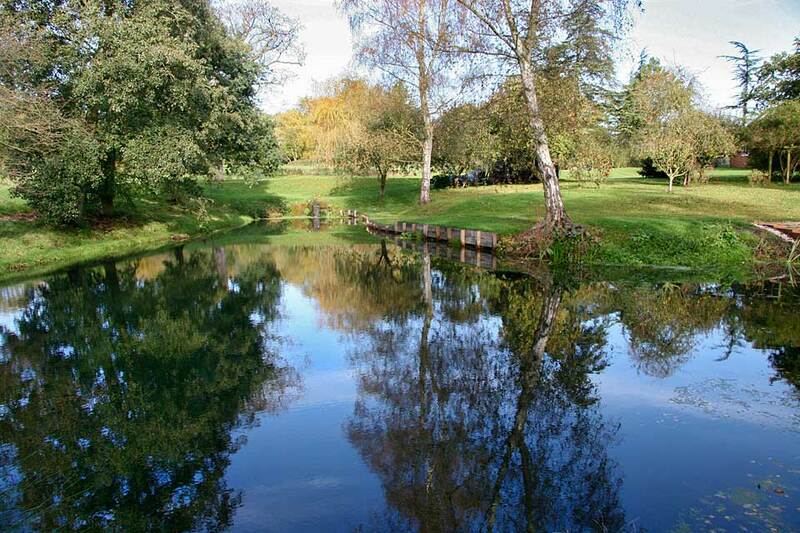 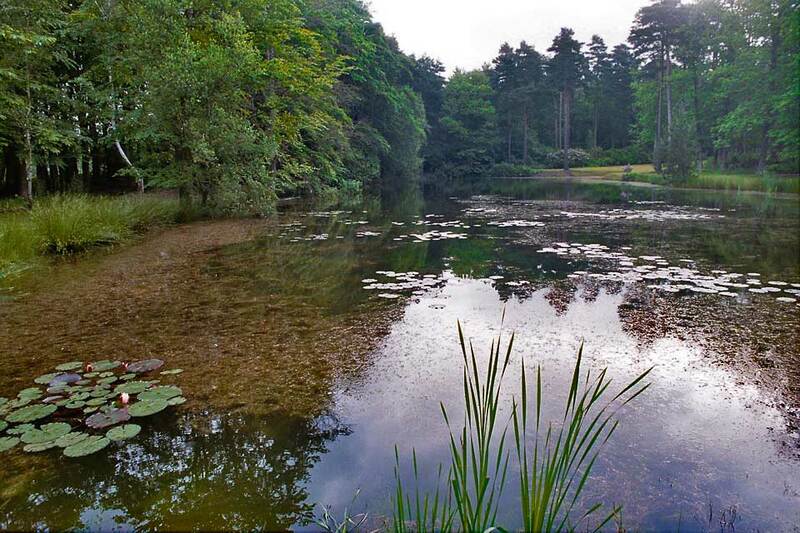 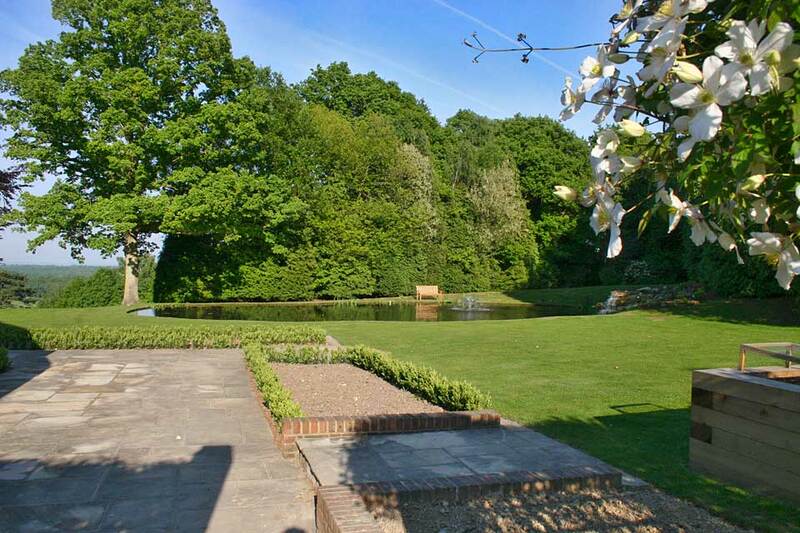 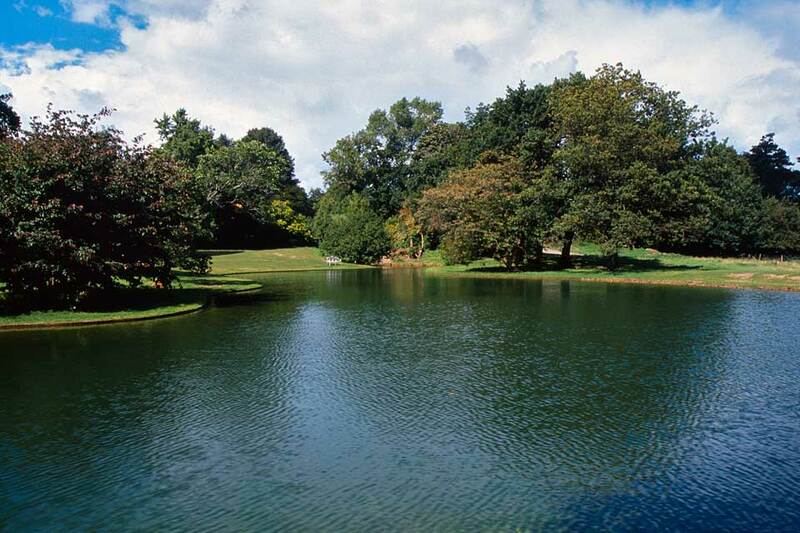 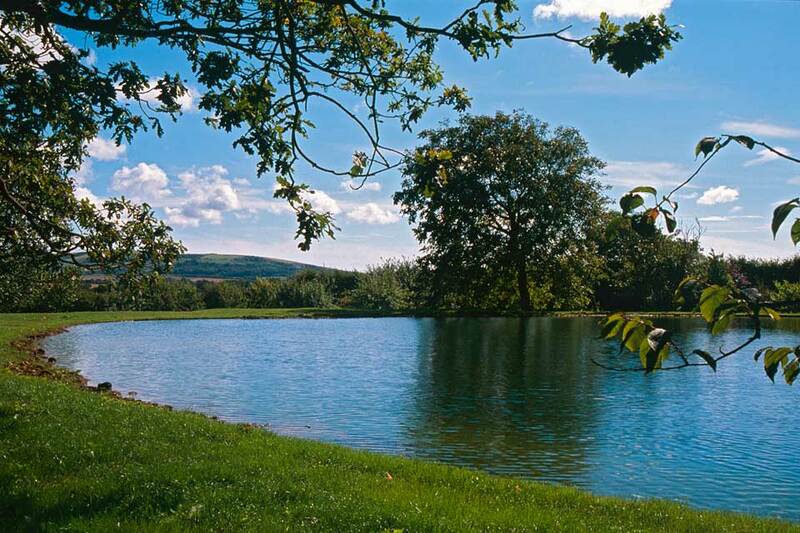 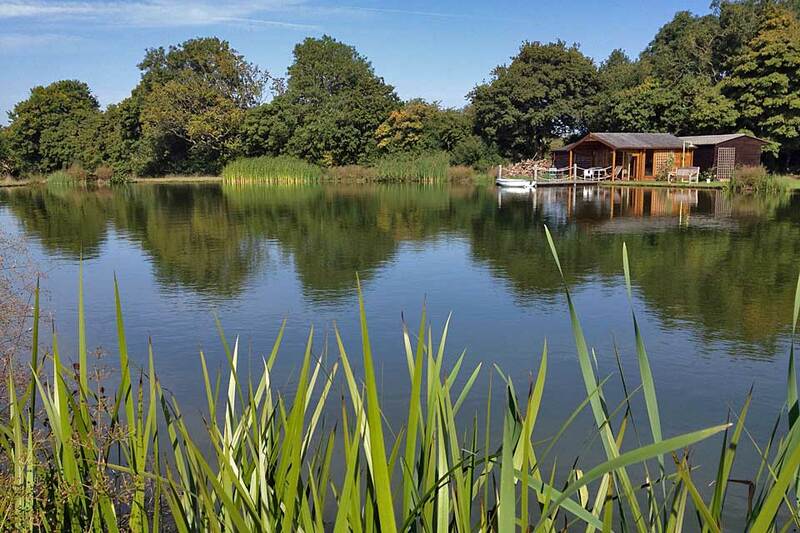 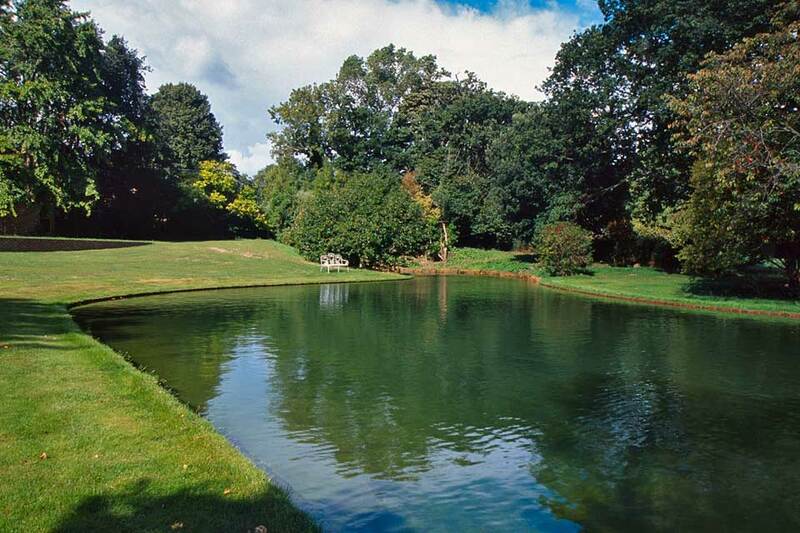 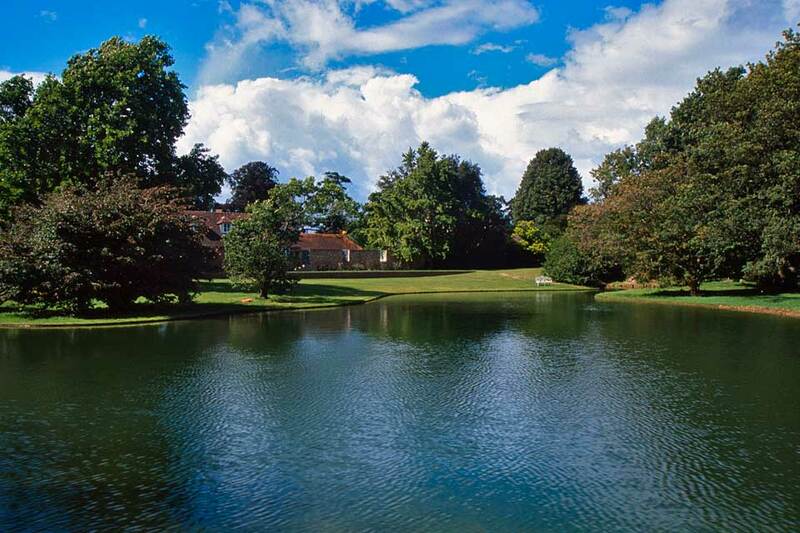 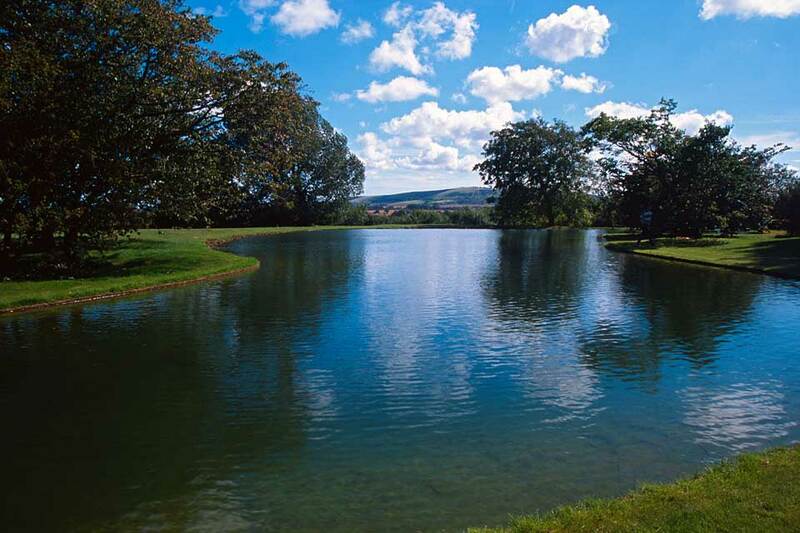 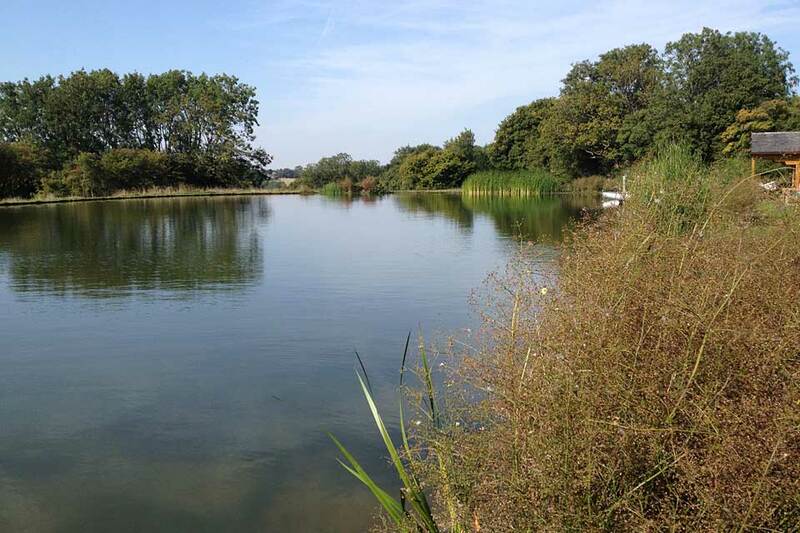 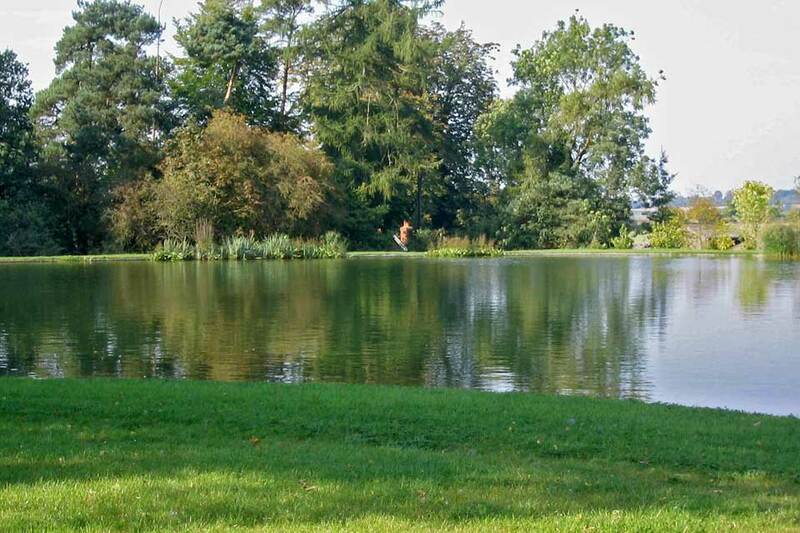 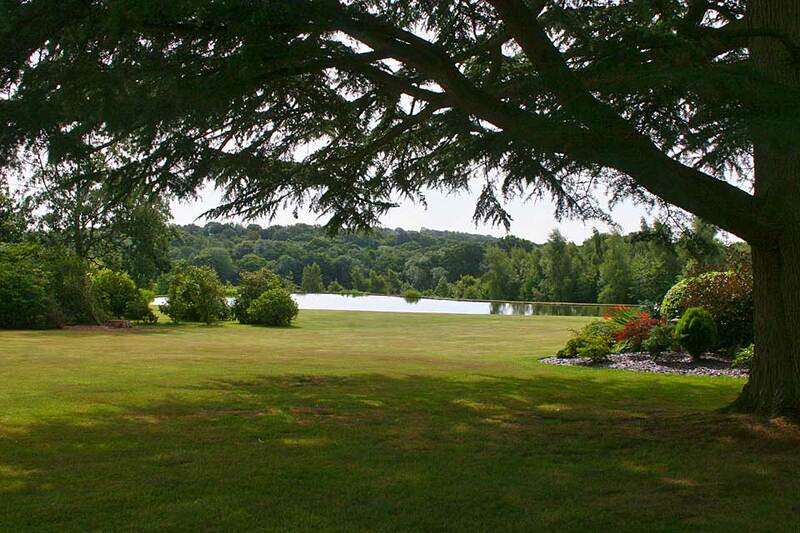 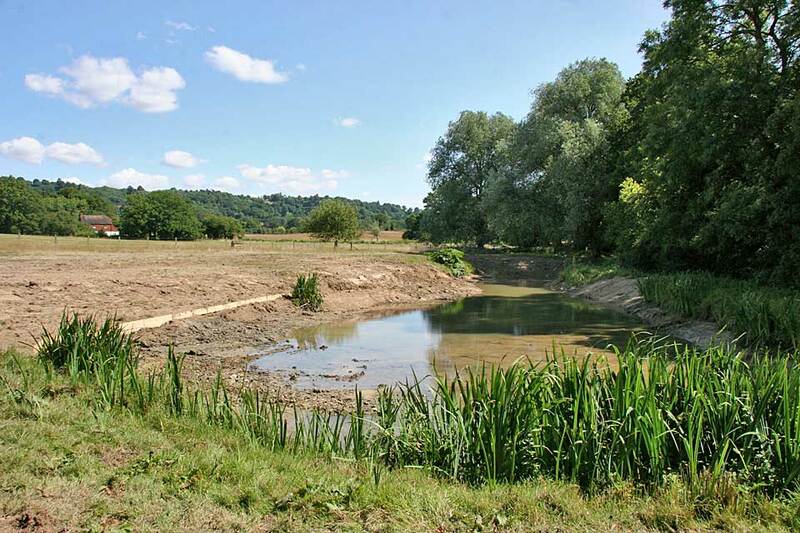 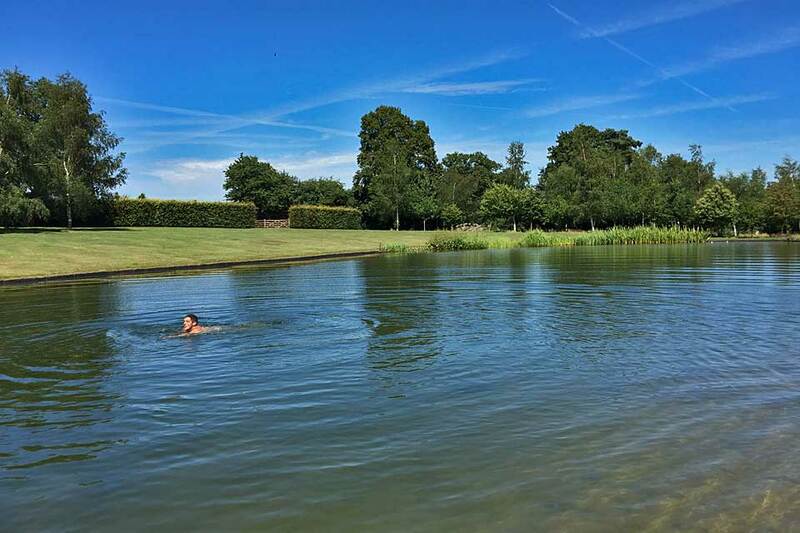 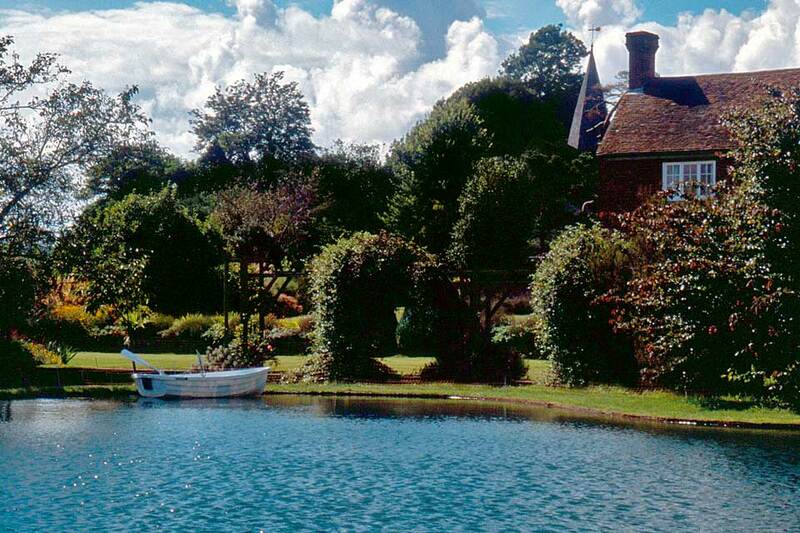 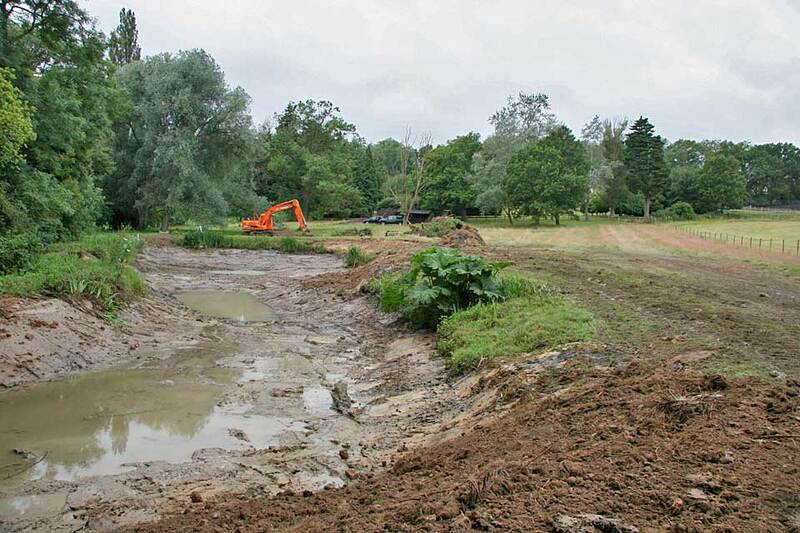 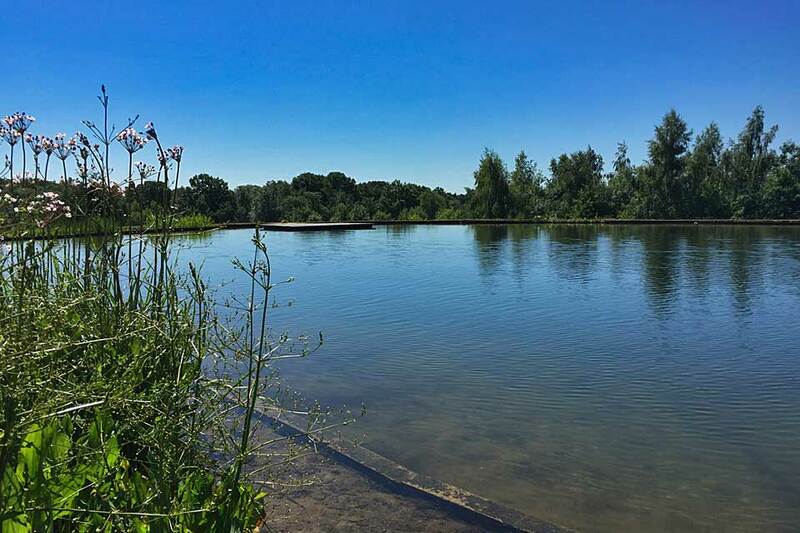 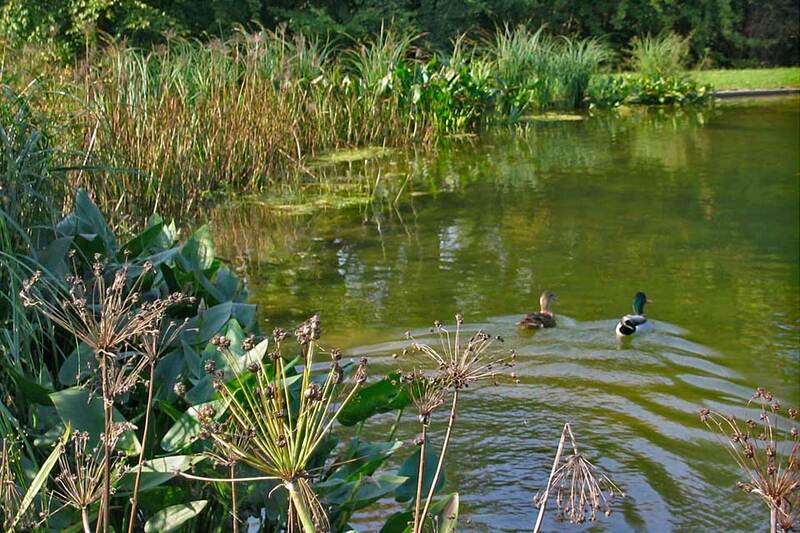 Christopher Claridge-Ware had recently bought a 35-acre estate near Chertsey in Surrey and wanted the lake improved. 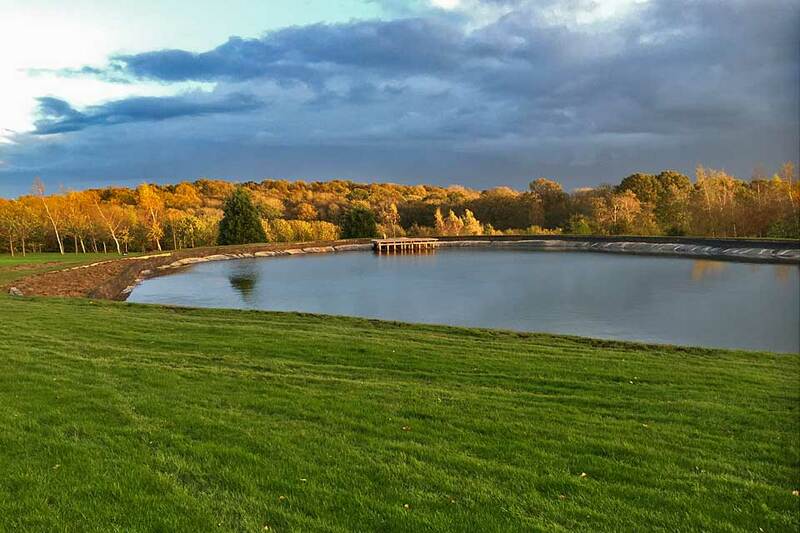 We looked at the lake and estimated for improvements: clearing out the debris, removing the island, reshaping the lake and remaking the dam. 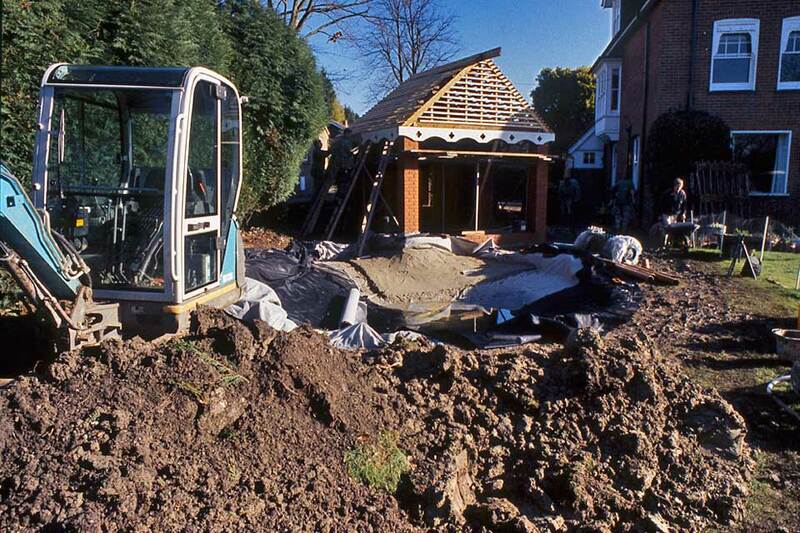 Mr and Mrs Claridge-Ware explained that the new house had not been landscaped in any way and talked of their ideas. 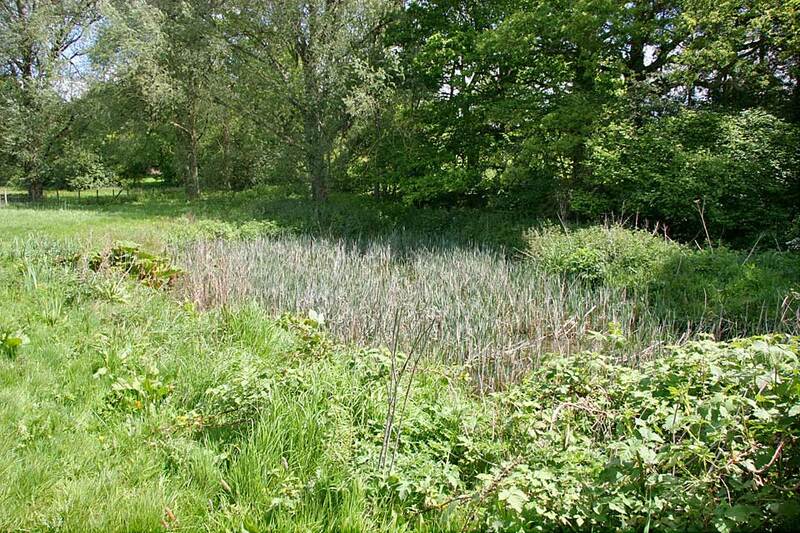 We suggested that the area be surveyed and for Anthony du Gard Pasley (FLI FSDG FSA Scot) to be commissioned to draw up a master plan. 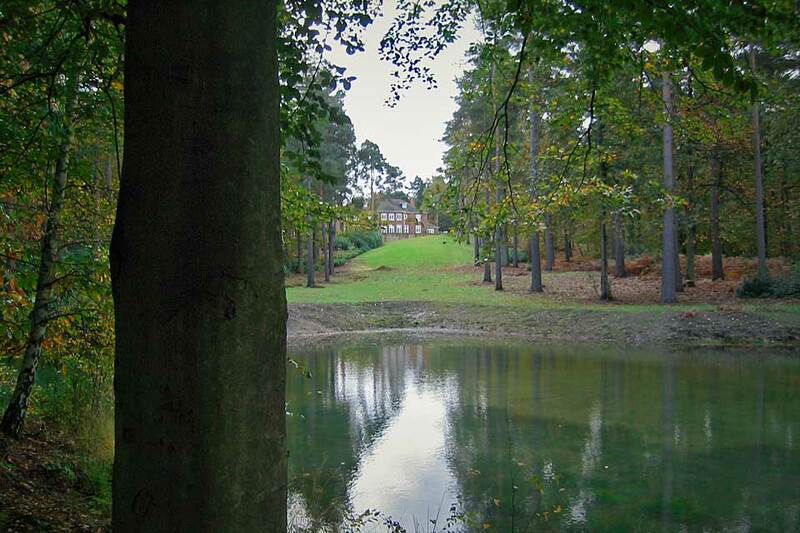 We also suggested that William Matthews (OBE F,Arbor.A.,F I Hort) be consulted to look over the woods. 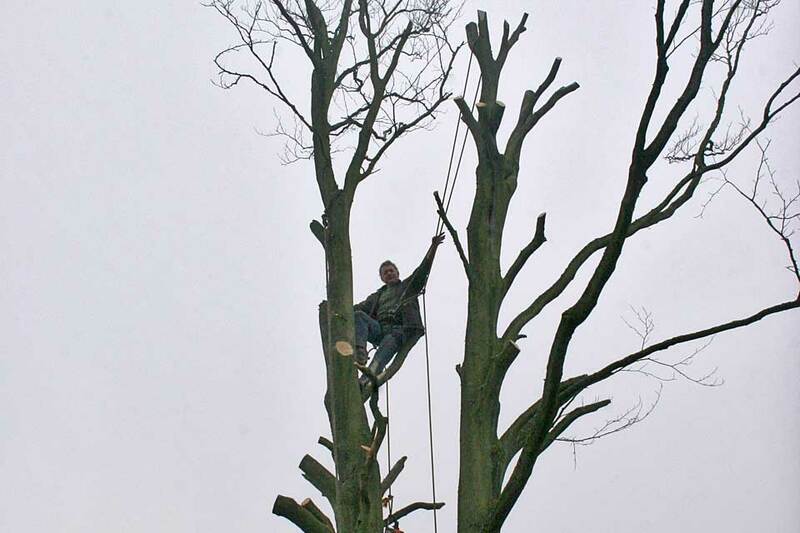 He undertook a tree survey. 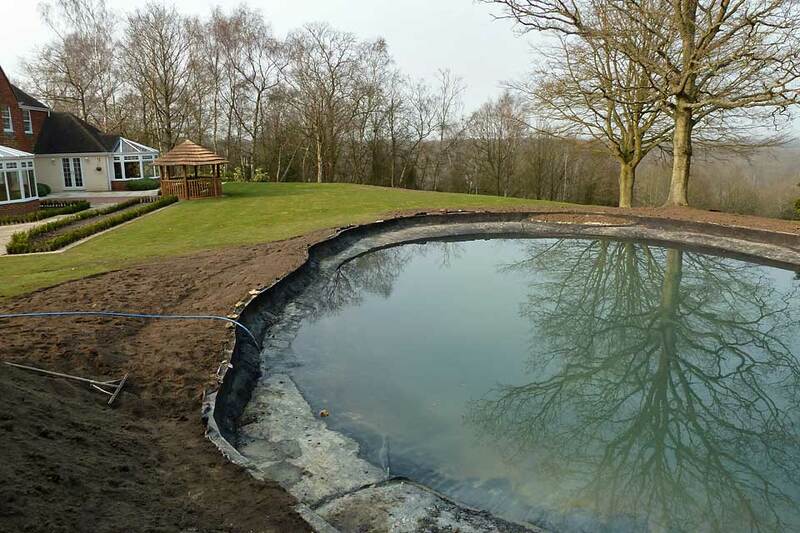 We brought in our associates and undertook the lake work, fencing, and built a new driveway through the woods, concluding the first phase just before Christmas. 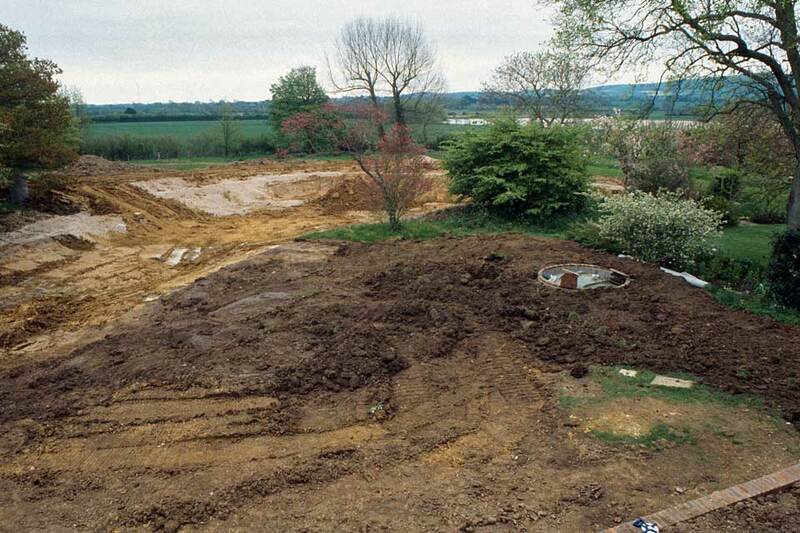 In the spring, we undertook the main groundworks about the house. 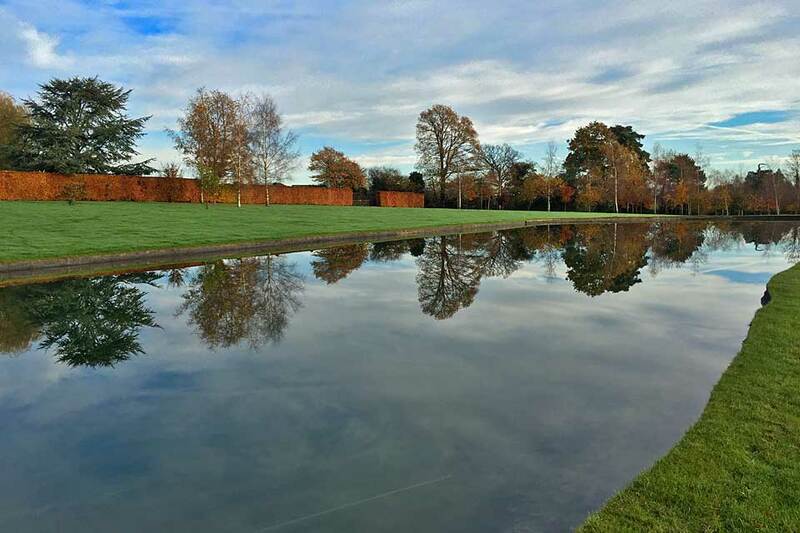 These works engaged two teams of brickworkers building the retaining walls, fountain pond, paving, lawns, planting beds, arbour, walkways and planting beds. 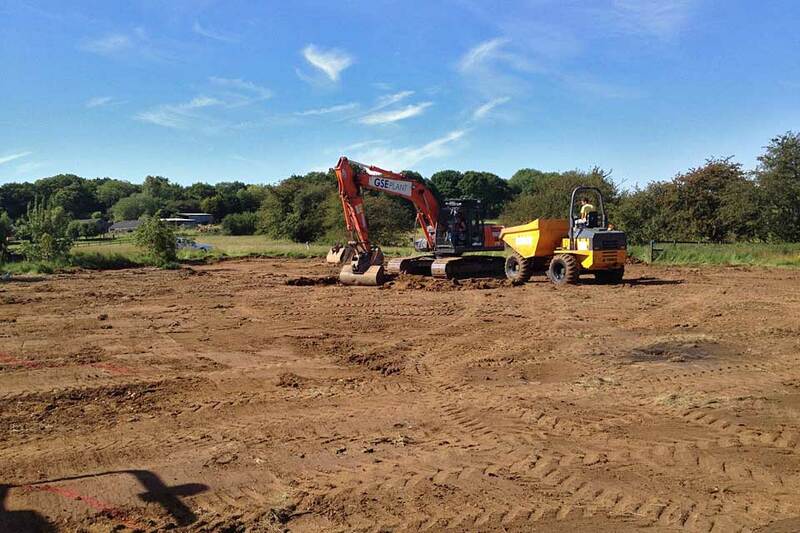 The hard landscaping and groundworks were concluded by early November. 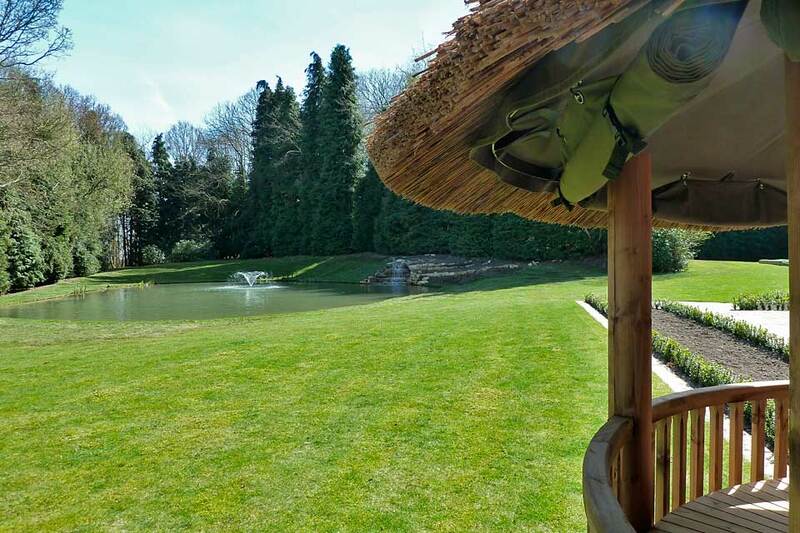 The project was a delight not least because of the in enthusiastic input of all the teams, led and inspired by the Claridge-Wares. 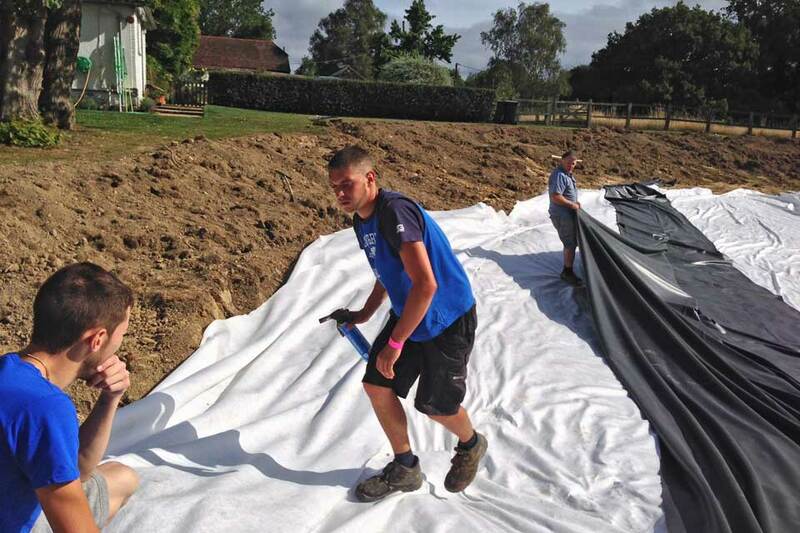 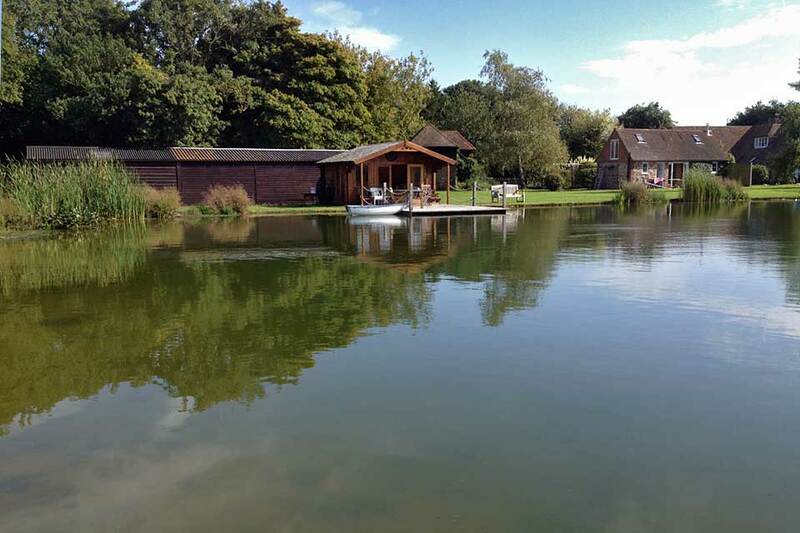 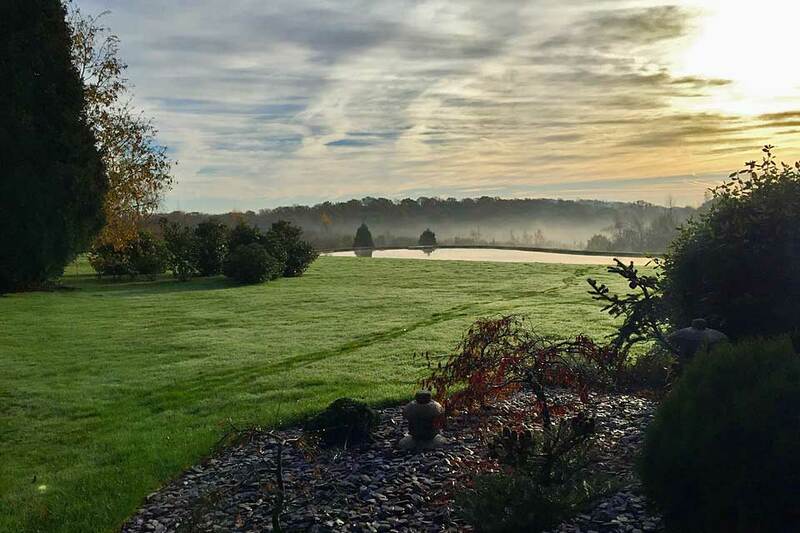 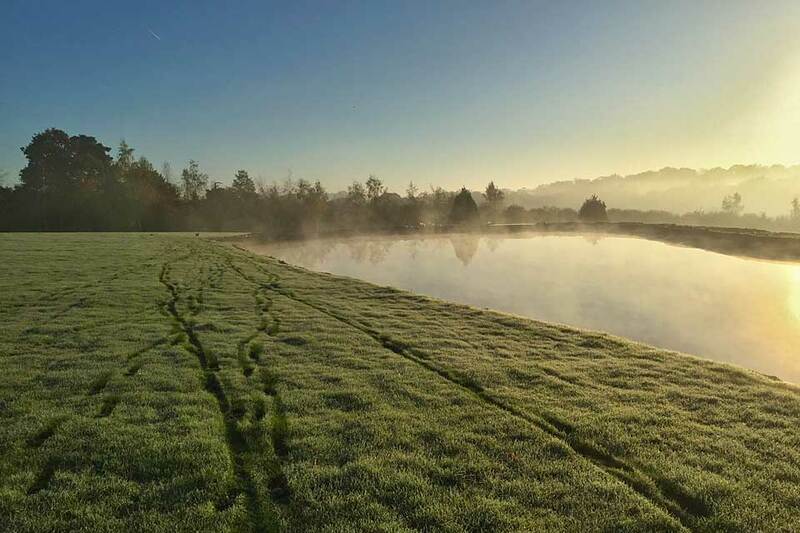 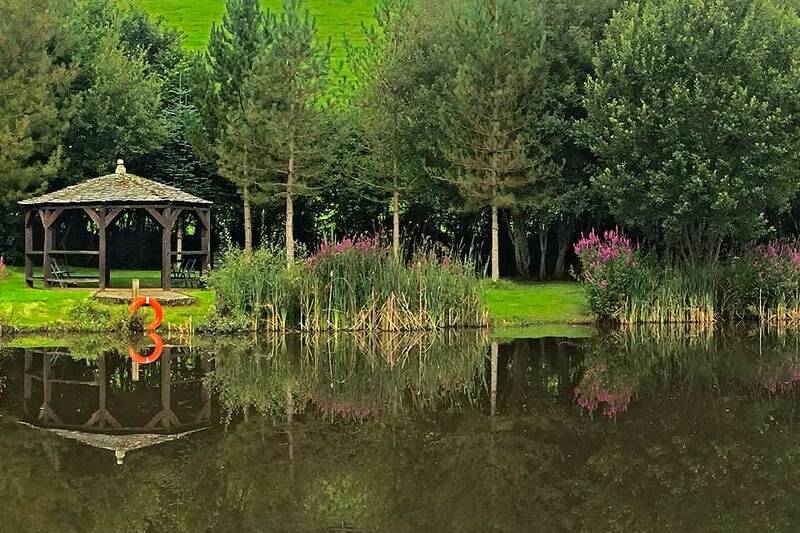 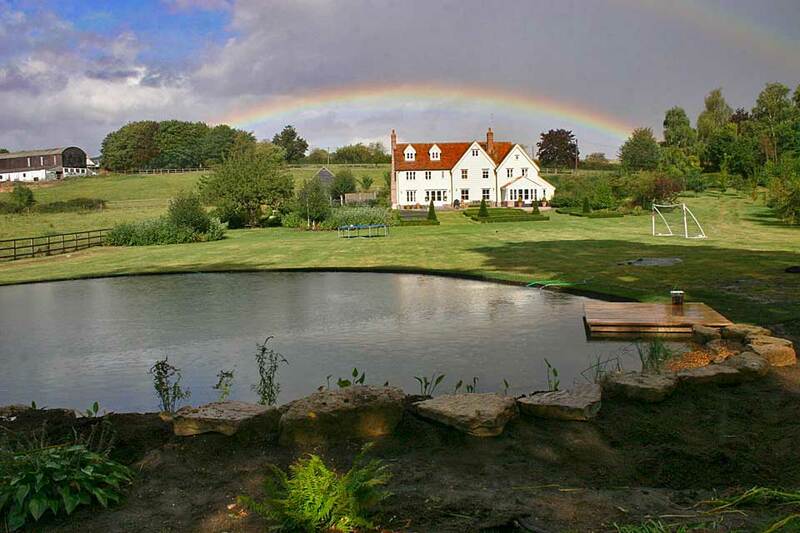 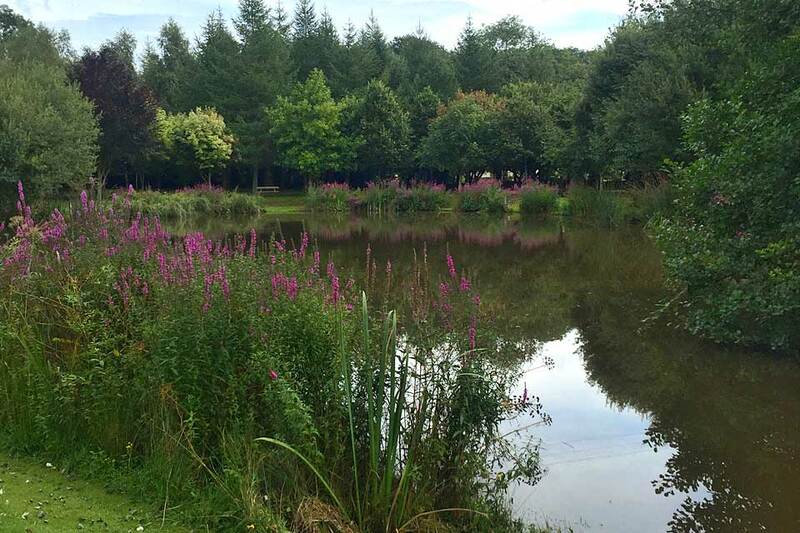 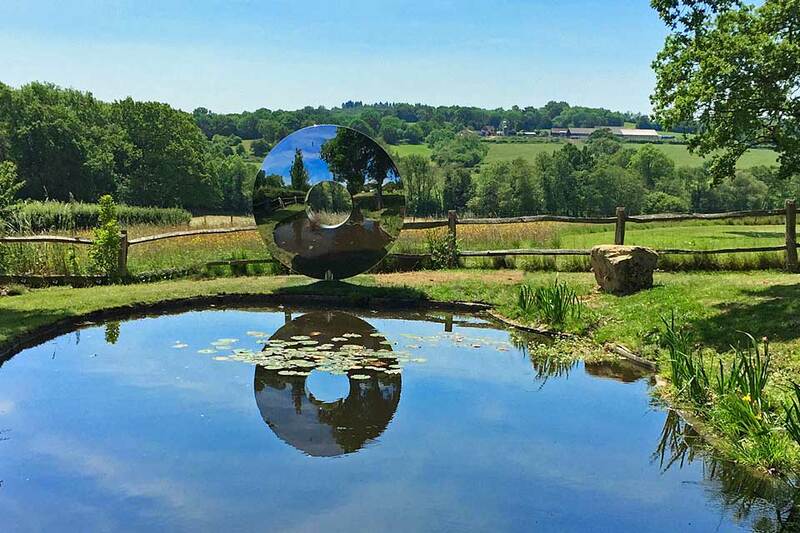 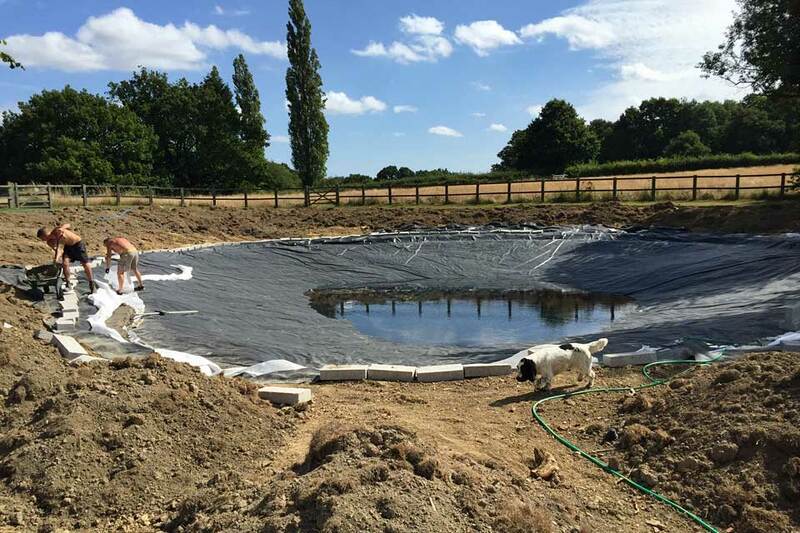 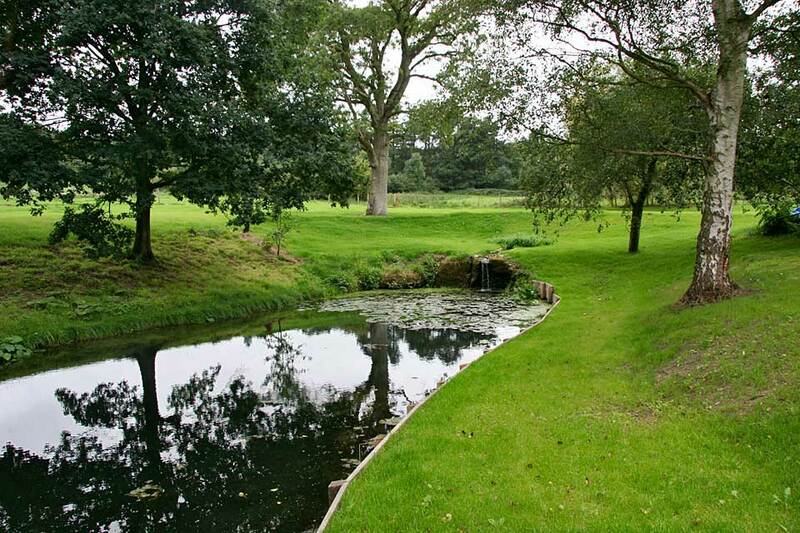 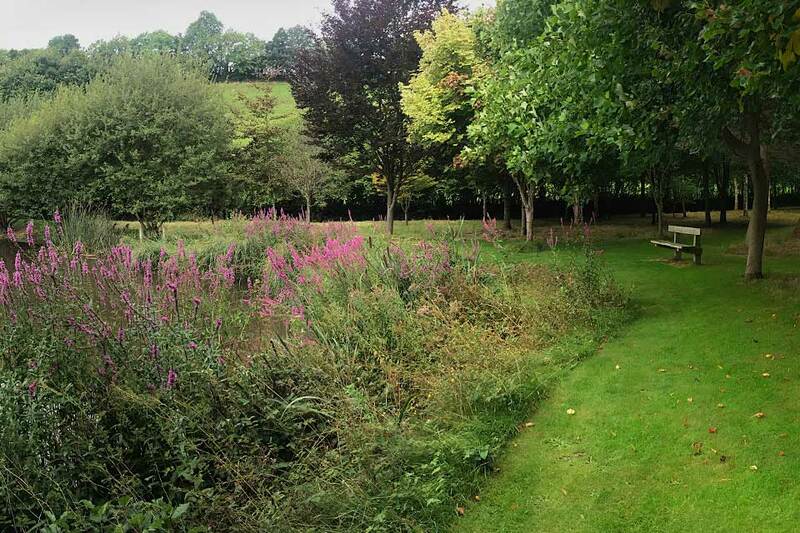 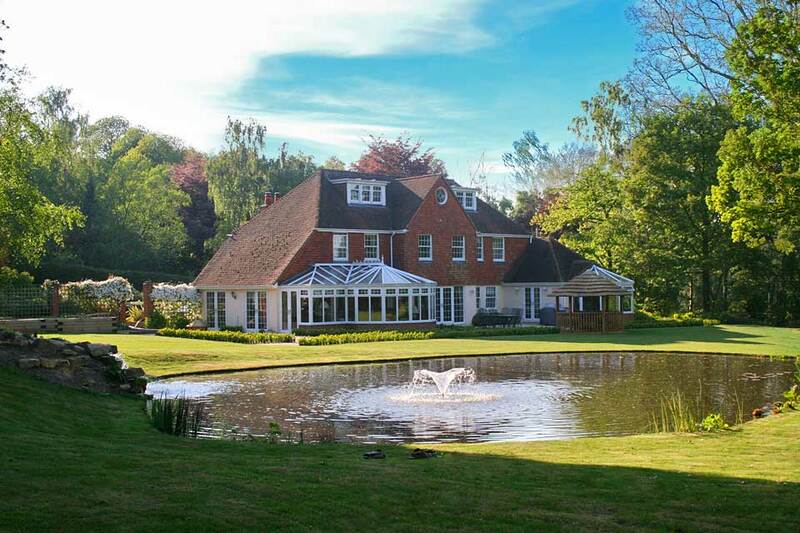 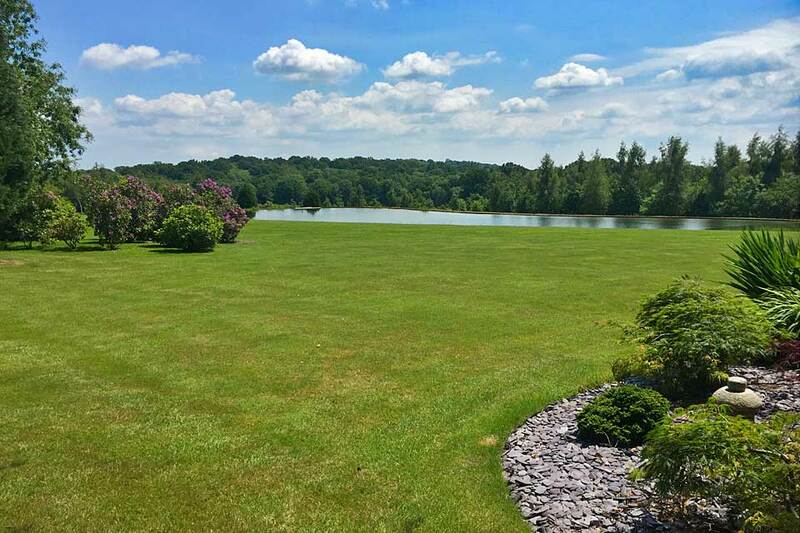 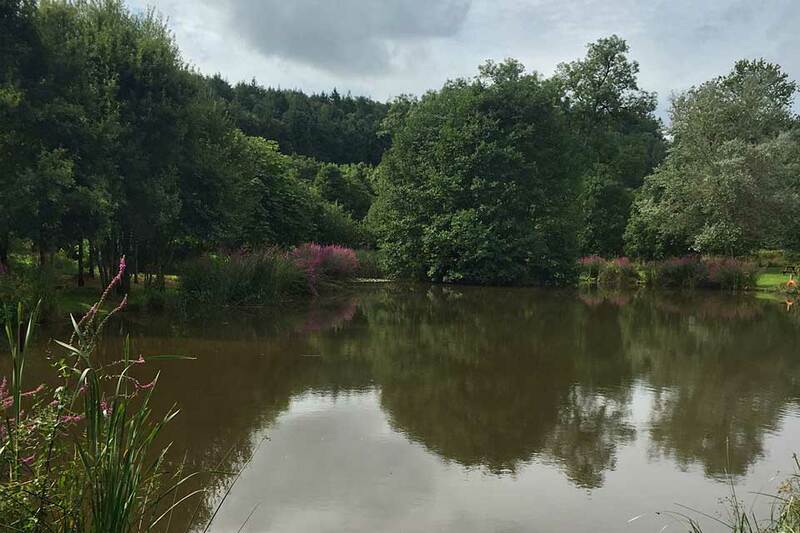 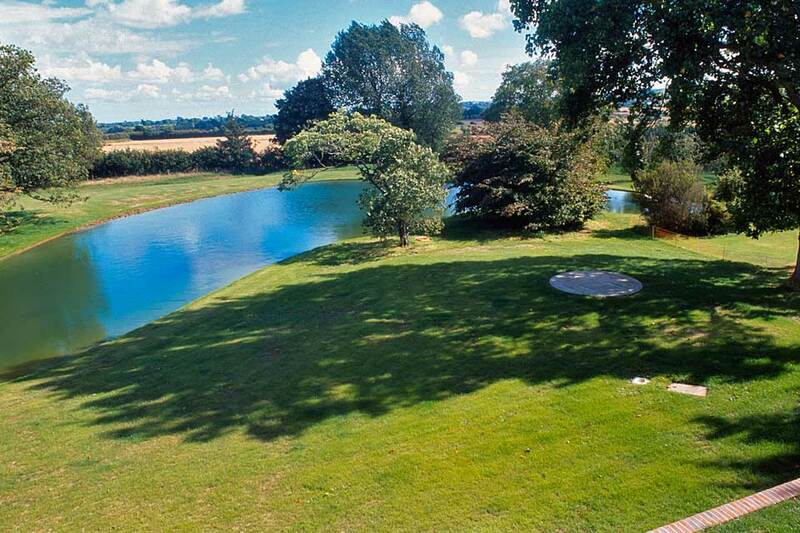 This gave flexibility to the teams by suggesting the most cost-effective and optimum realisation when the location revealed its secrets..
Mr and Mrs Vaughan wanted a new pond at their property near Tenterden. 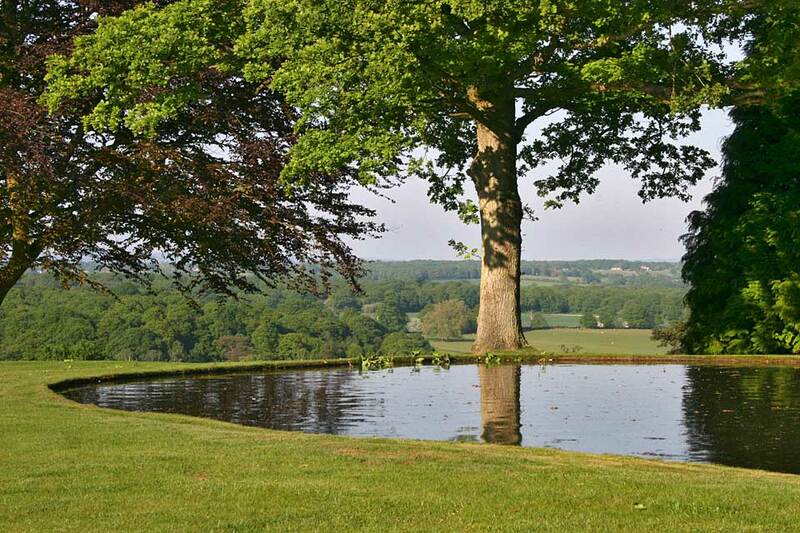 A stressed beech tree was spoiling the view over the Weald. 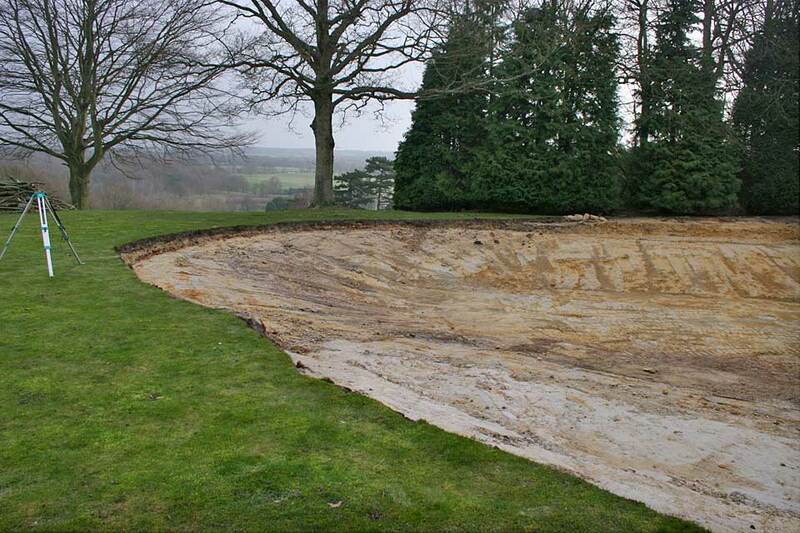 We removed it and took out the roots, profiling and turfing the damaged area. 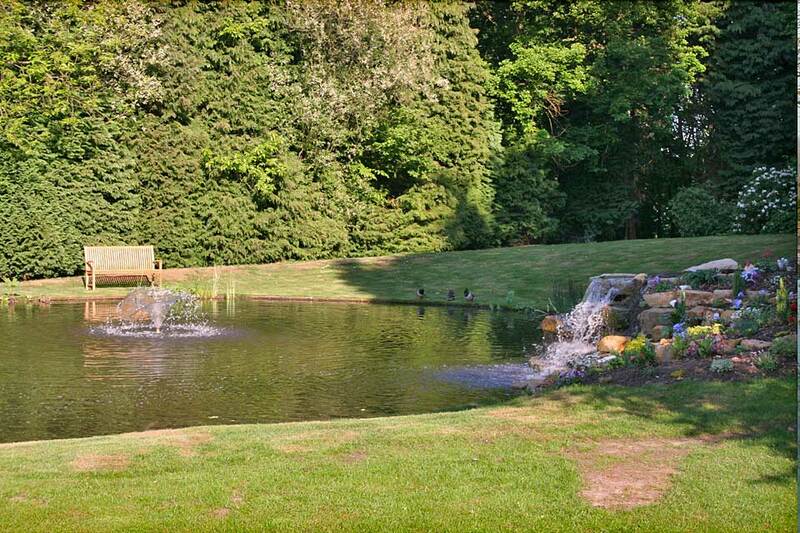 They also wanted a waterfall and fountain as well as footings for decking to be built at a later date. 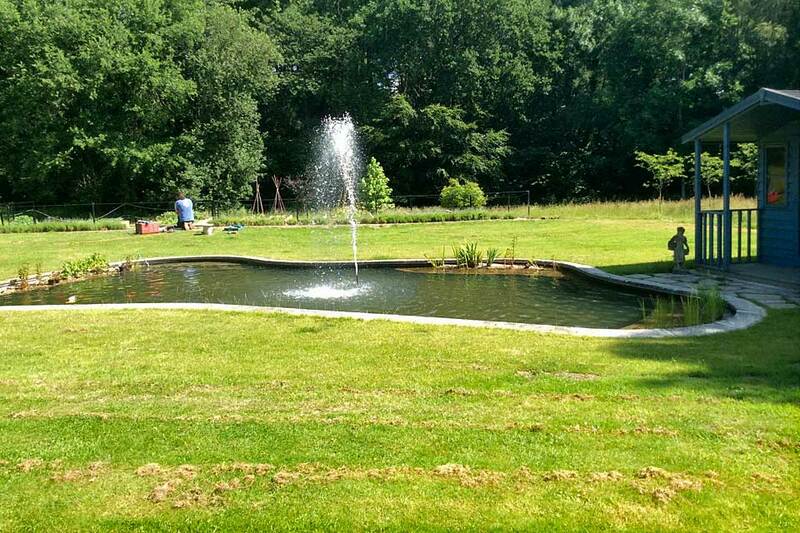 As the pond was so near the house, we gave particular care to the route for plant to the works, minimising the damage to the ornamental lawns. 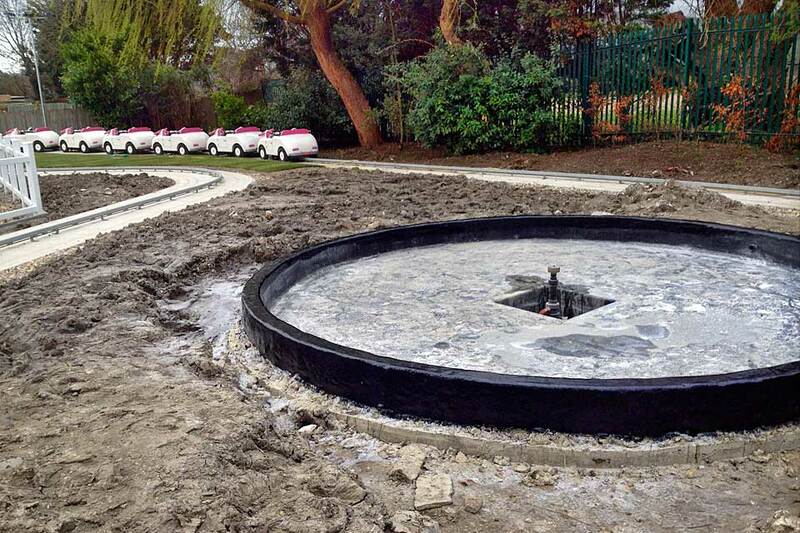 We fitted an automatic top up, time clocks for the features, and electrical circuits for lighting, again to be fitted at a later date. 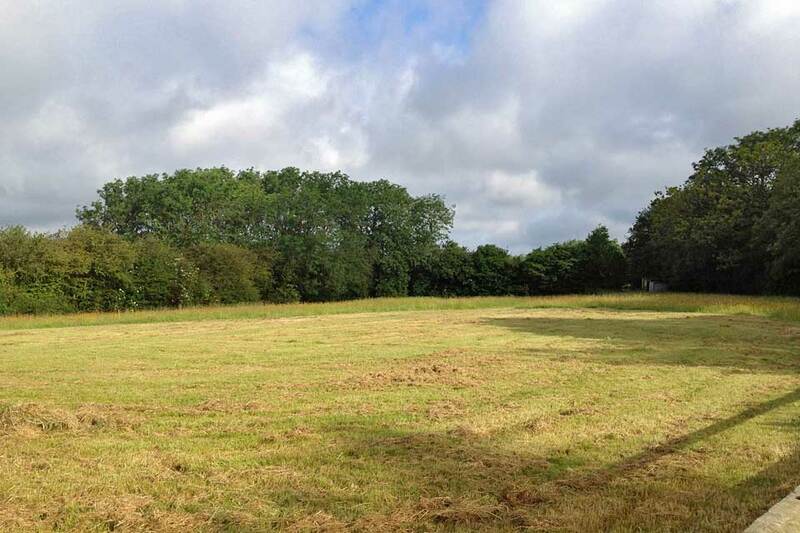 The detritus for the dig was placed on a nearby paddock, rotovated and seeded with a wildflower mix. 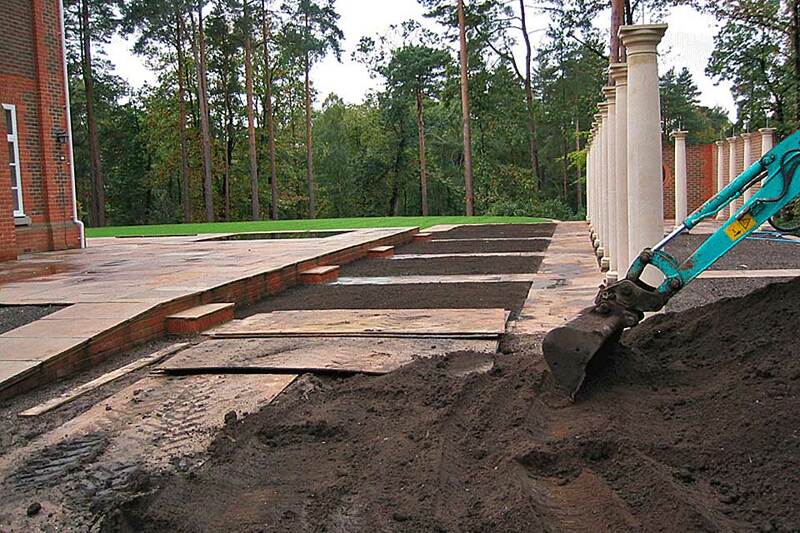 Because the weather was unusually kind, with little rain, we were able to complete the project in March, ahead of schedule. 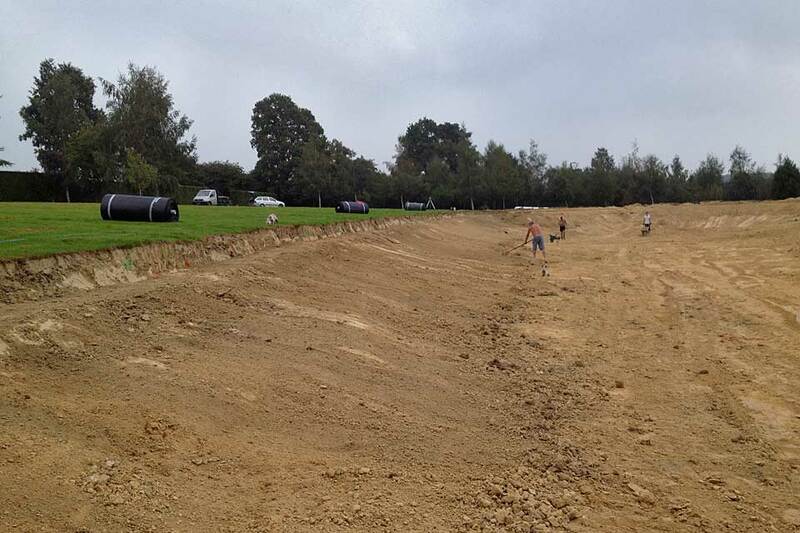 They are delighted with the result and we look forward to watching the edge planting develop over the years. 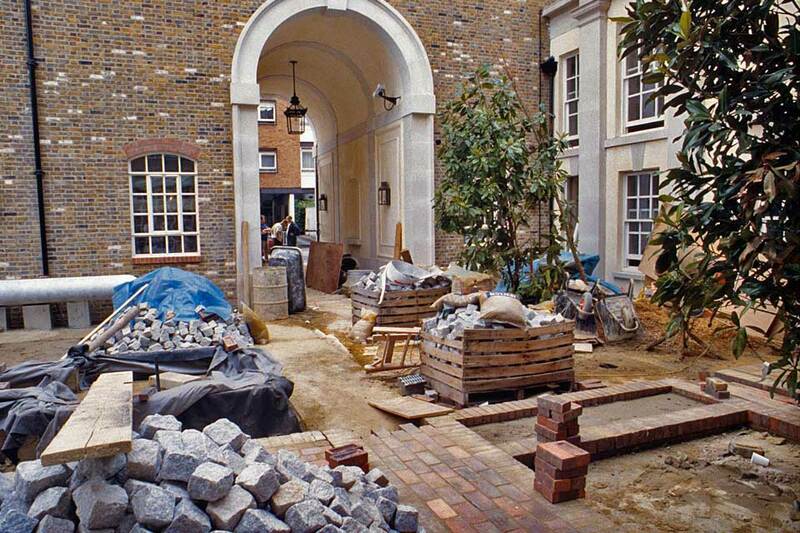 Late in the summer of 2012 we were approached by Mr Turner. 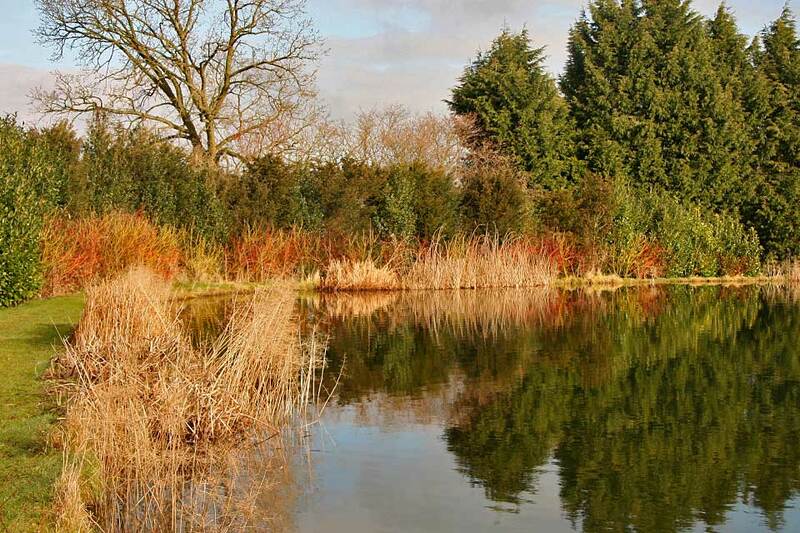 His butyl lined pond had been penetrated by a falling branch and as it was unsatisfactory in other ways he asked for suggestions for improving it. 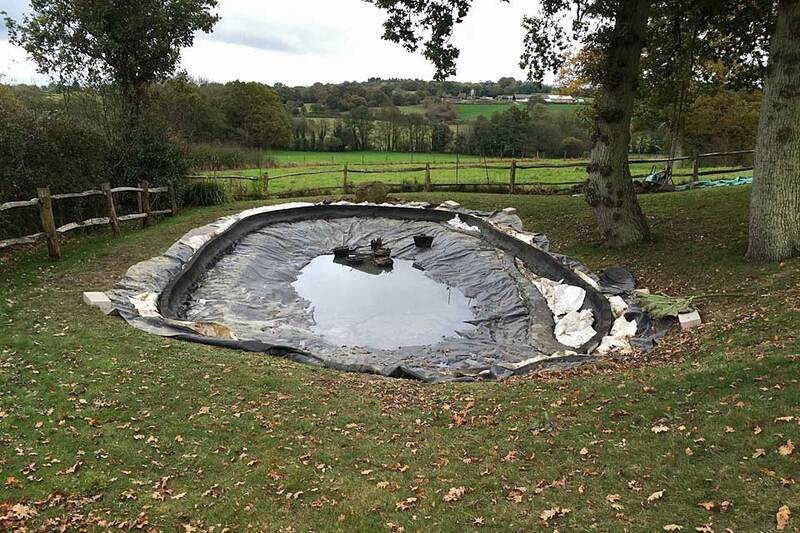 We suggested altering the depth profiles, the shape and the edge detail as well as fitting an automatic water top up system, also introducing rock on one face, this also required the fitting of a new EPDM liner as it was not possible to weld onto the existing liner. 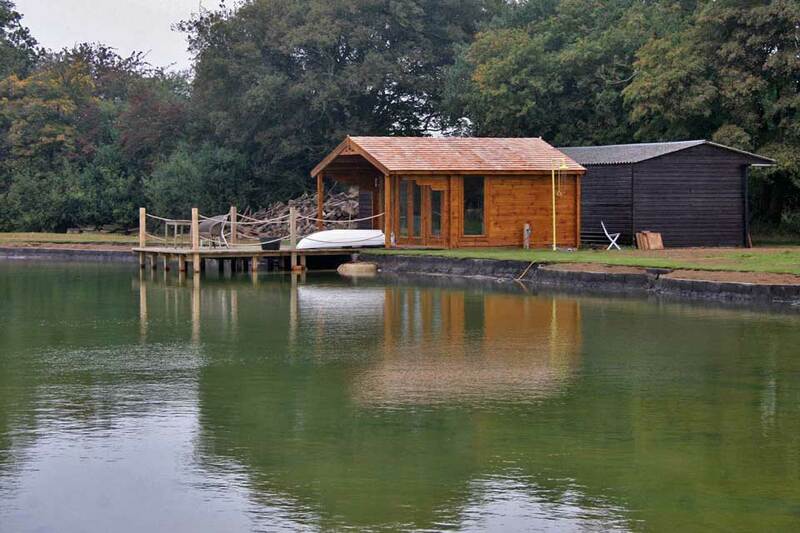 This we undertook over 3 weeks to the delight of Mr Turner and his family. 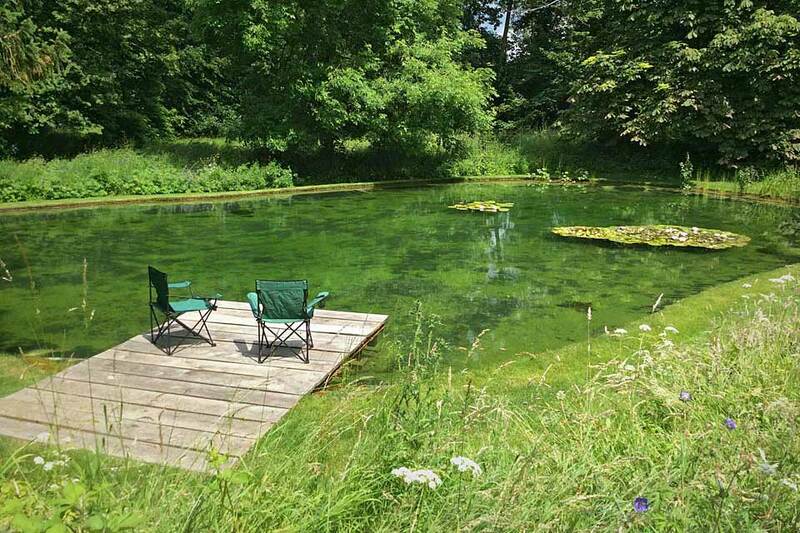 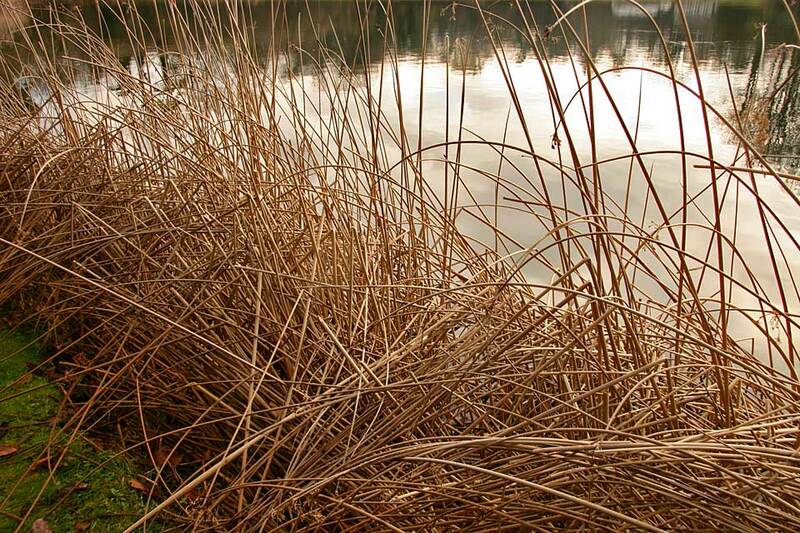 Mr and Mrs Cohen’s spring fed pond on their property was filled with what proved to be more than a metre of detritus. 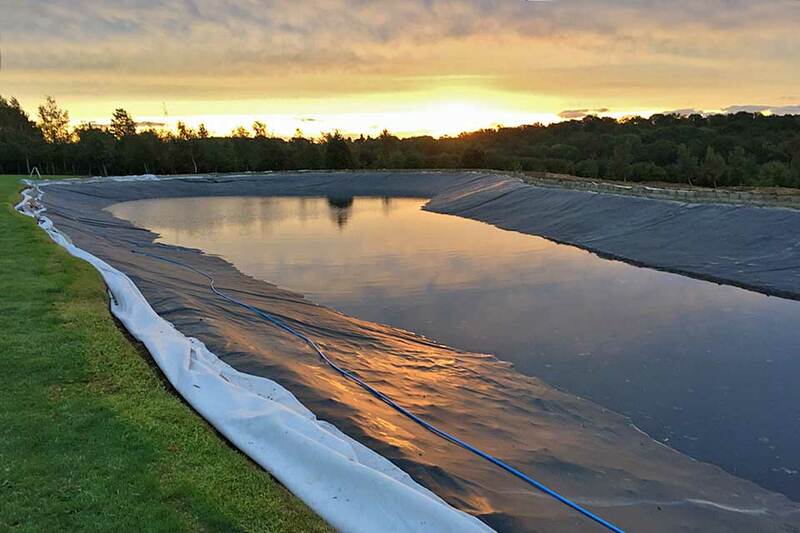 The dam leaked. 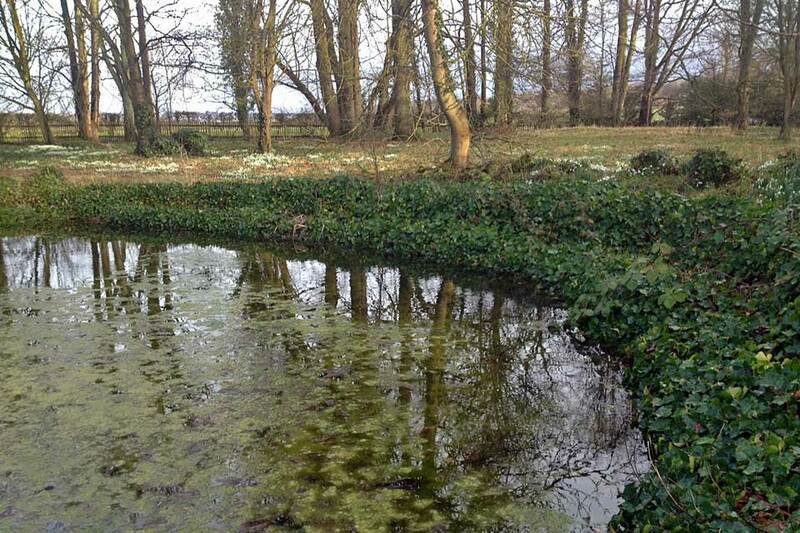 The water level was well below potential and the spring had eroded the soil on the input. 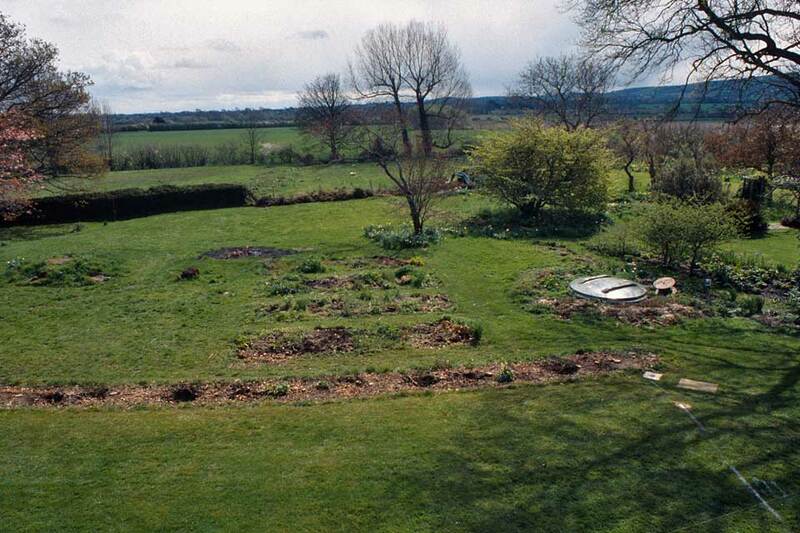 The area was surrounded by fallen and self-seeded trees. 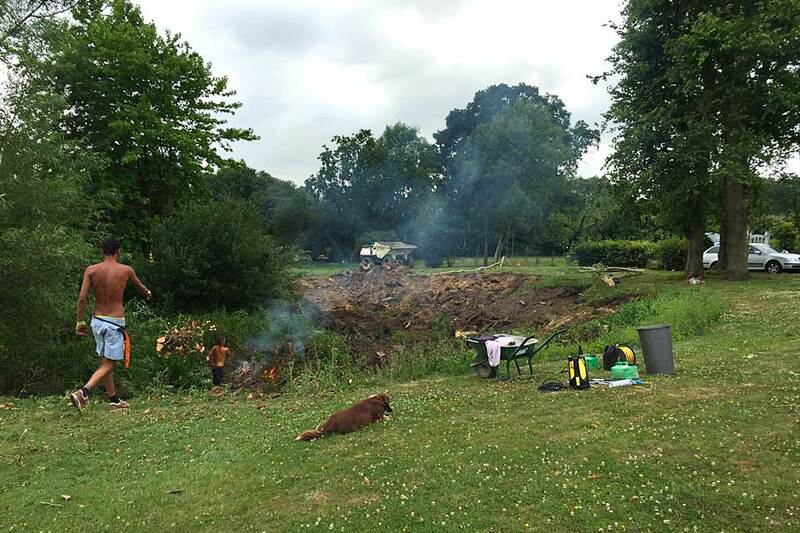 After discussion with the client, and after getting permission from the local council in the spring, we cut down and burnt the unwanted trees, keeping the good wood ( ash) for the wood burning stove. 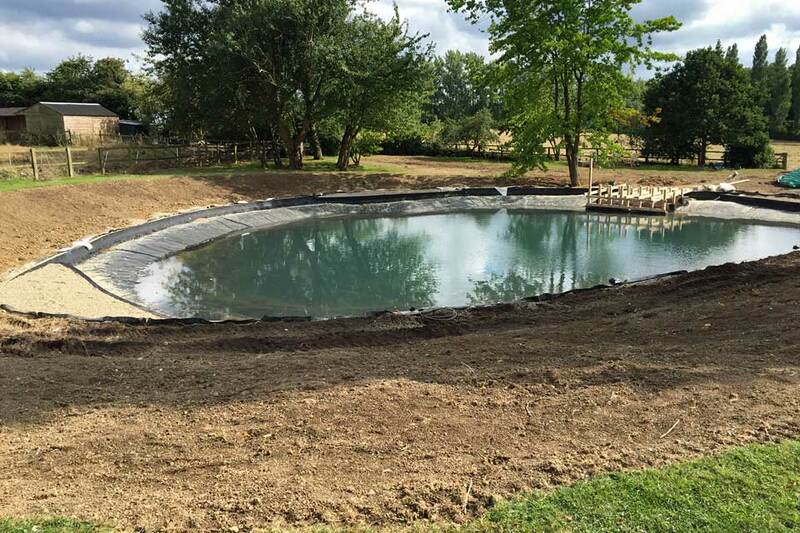 The pond was drained and a bypass pump was installed. 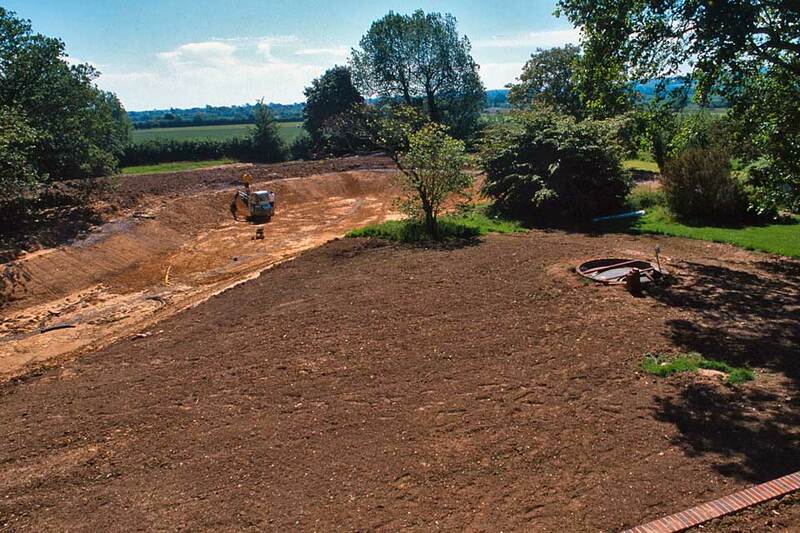 Land drains were installed to dry out the boggy and inaccessible areas. 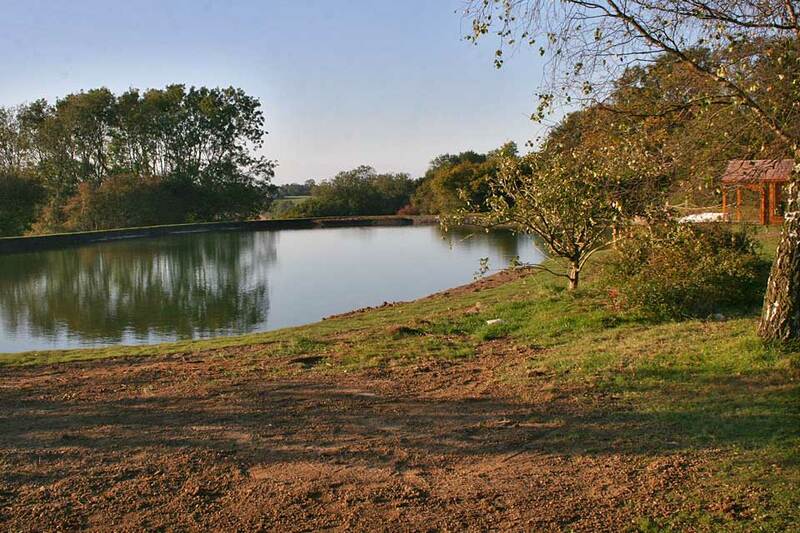 We built two dams near the pond for the detritus, both designed for level areas. 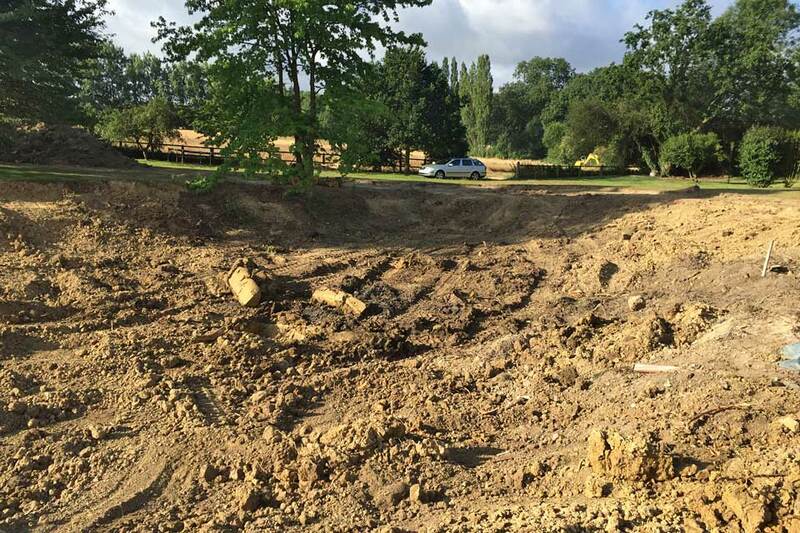 As it was impossible for a dumper truck to enter the pond the detritus was removed, moving it with two 360 degree excavators, hand over hand. 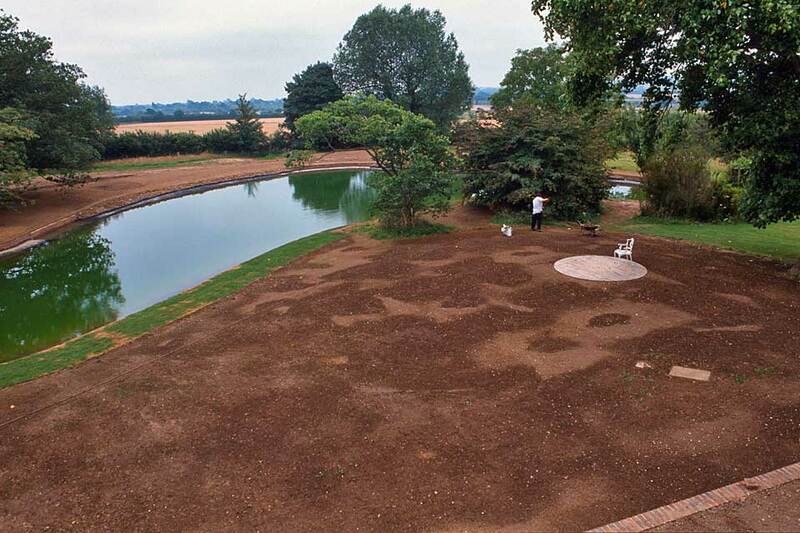 It remained for a year whilst it dried out after which the area was landscaped into level lawns. 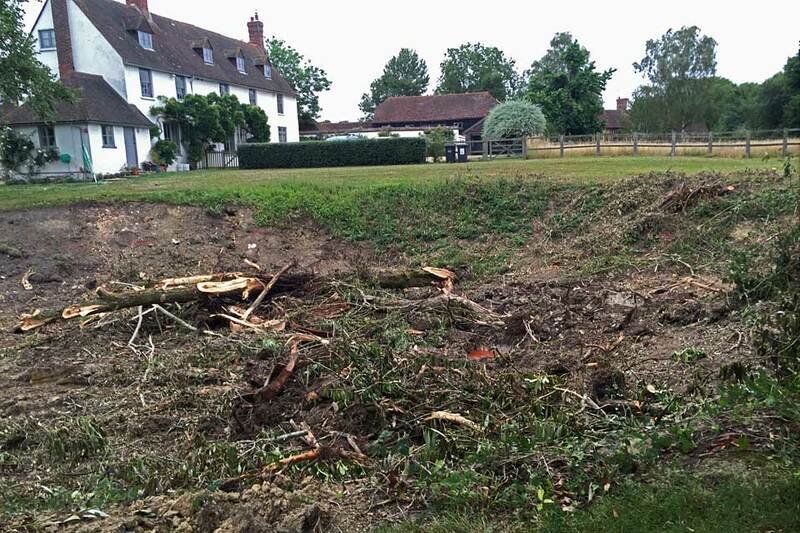 The tree stumps were removed and buried, with care being taken not to damage a 19th century ram pump housing. 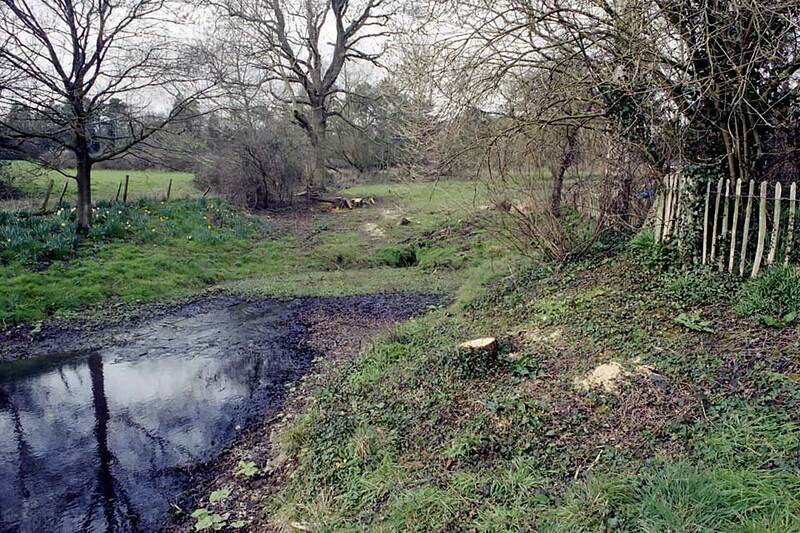 We found evidence of old water piping in the dam, this and the tree roots in the recent sluice boards were the reasons for the failure to hold water. 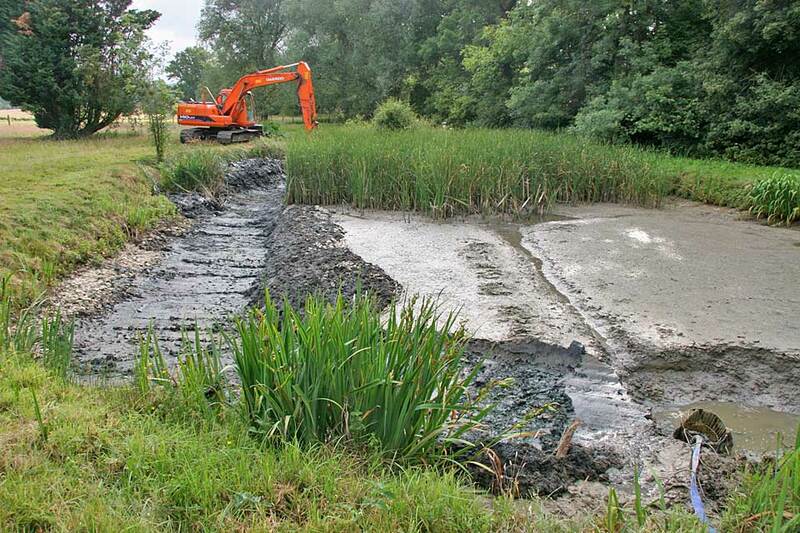 The old workings were photographed and blocked before re-claying the affected area. 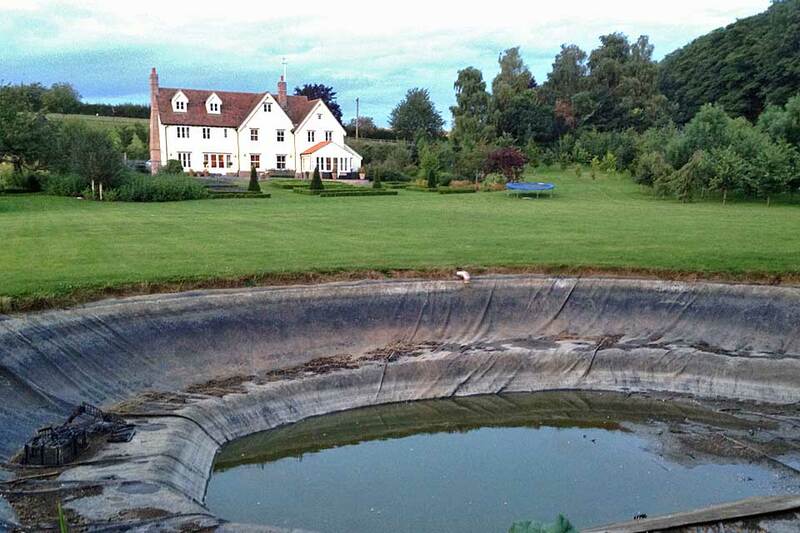 A new 500 mm ribbed double walled “monk” was installed in clay to set the water at at the highest practical level . 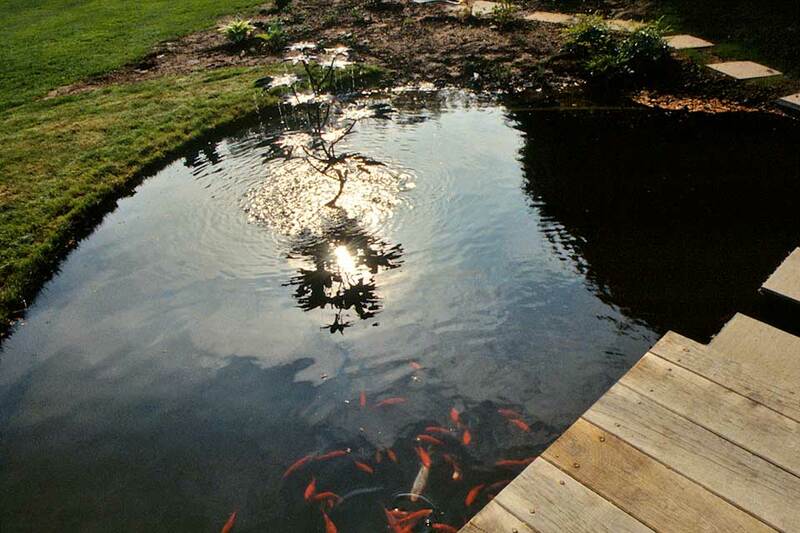 Two planting shelves were built below water level. 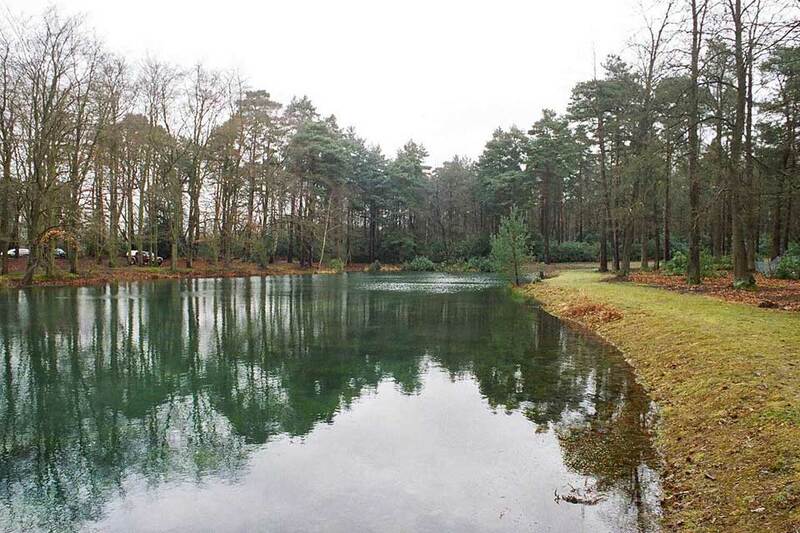 Fittleworth rock was imported to make a new waterfall into the pond and this was installed with butyl rubber and geotextile in order to take the spring water to the top of the rock to form a waterfall. 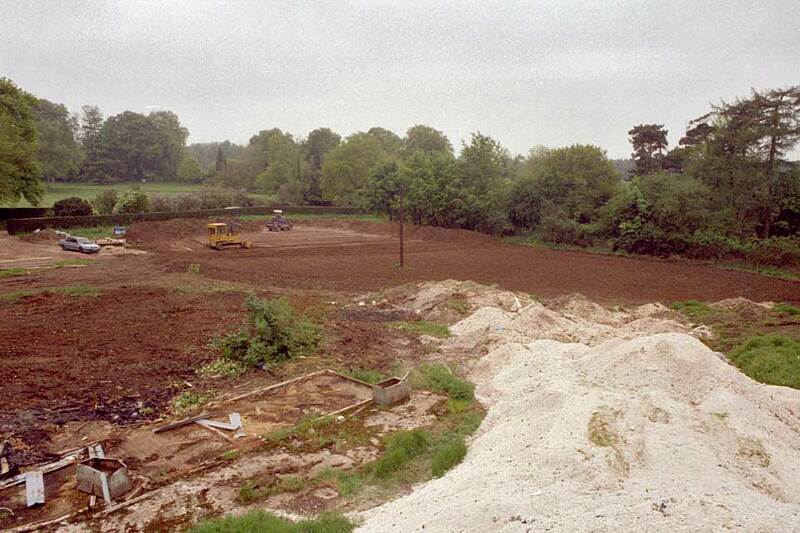 The working area was fenced off to keep out cattle from adjoining fields. 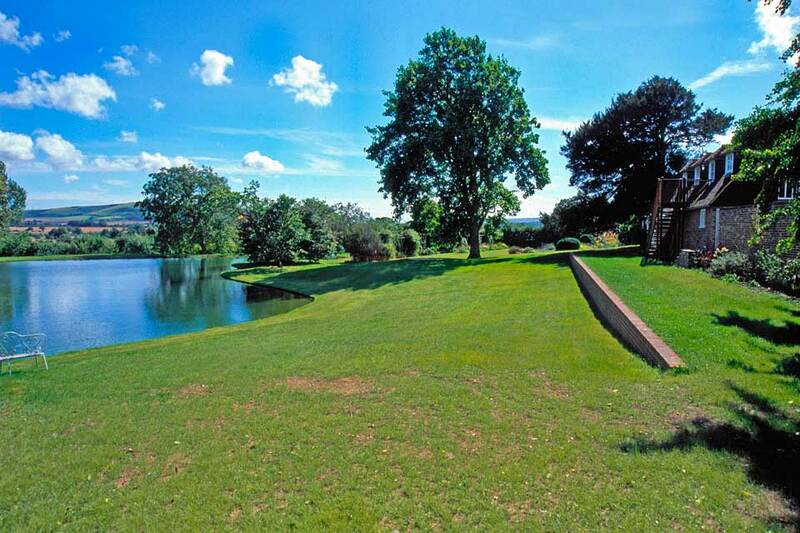 Post and rail fences are planned after final landscaping. 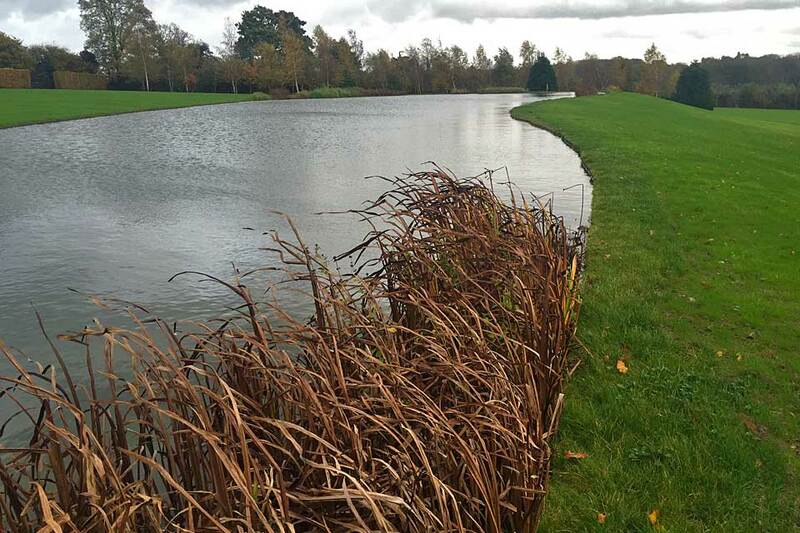 On one edge of the pond where the banking was steep edging board was installed using green oak posts and boards. 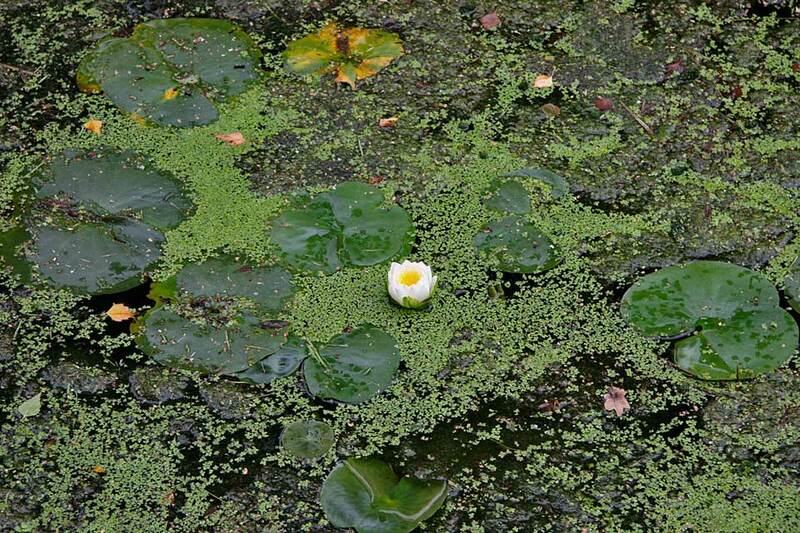 This was brought 600 mm out into the pond. 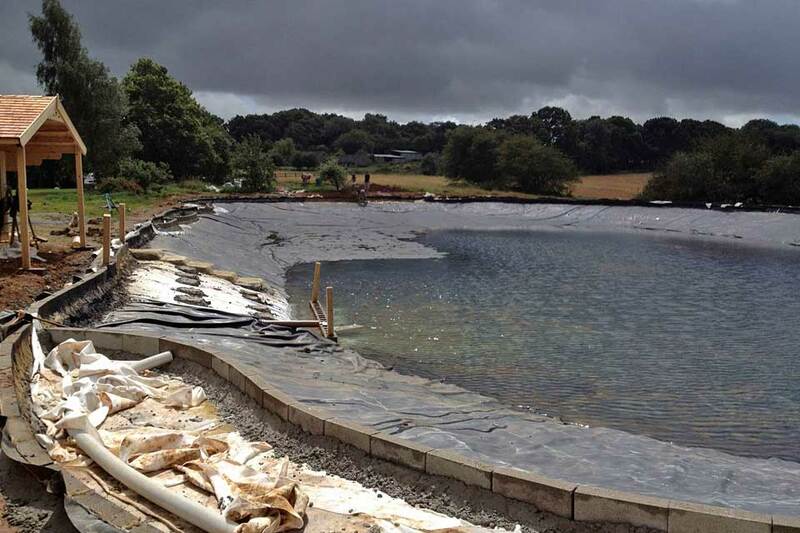 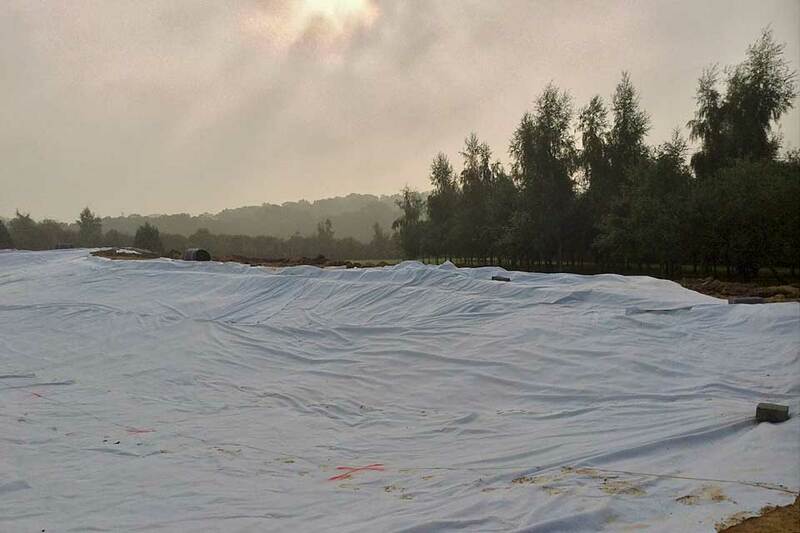 The area behind was covered with geotextile, then filled to above water level with 20 mm stones. 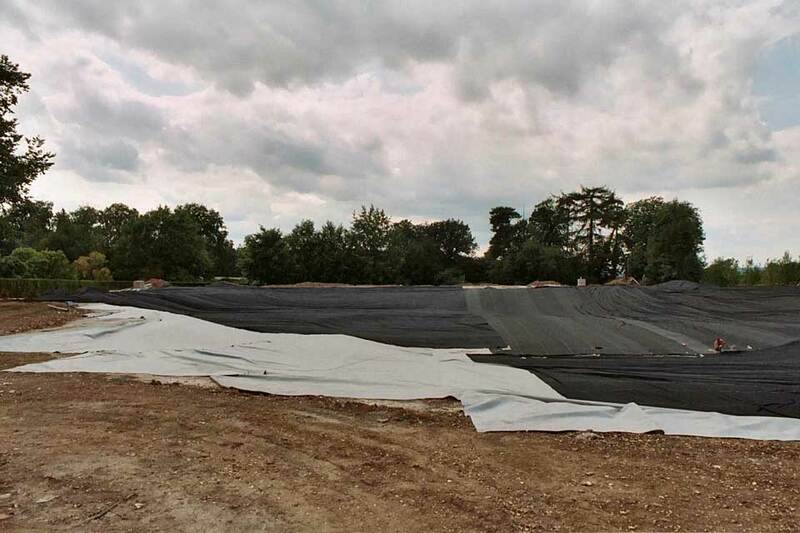 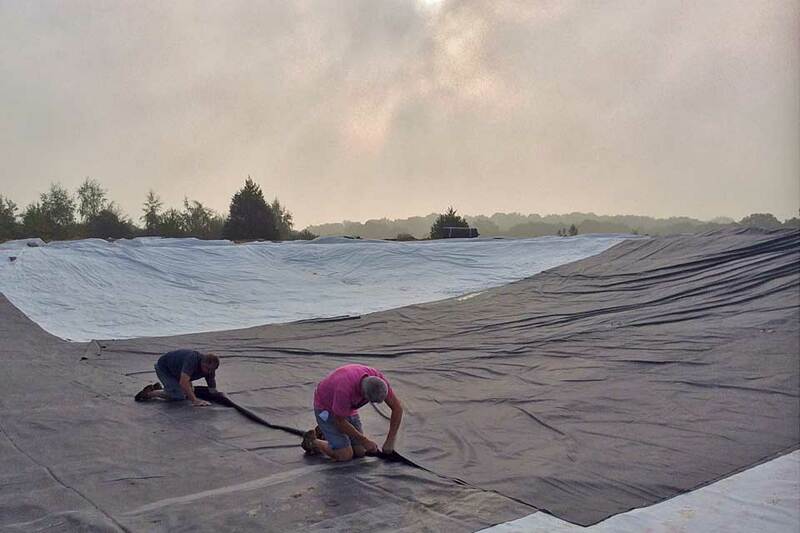 This was blinded with geotextile and top soil and then seeded. 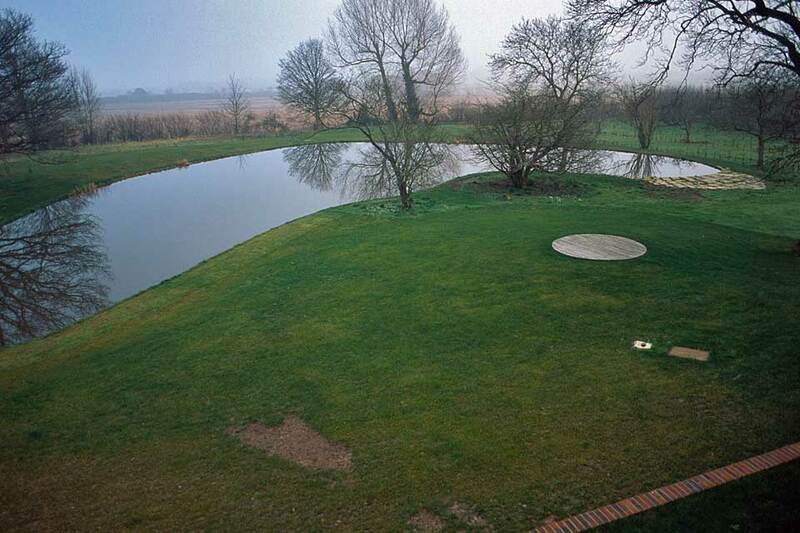 This allows for a firm dry 600 mm walkway at the side of the pond, only 70 mm above the finished water level. 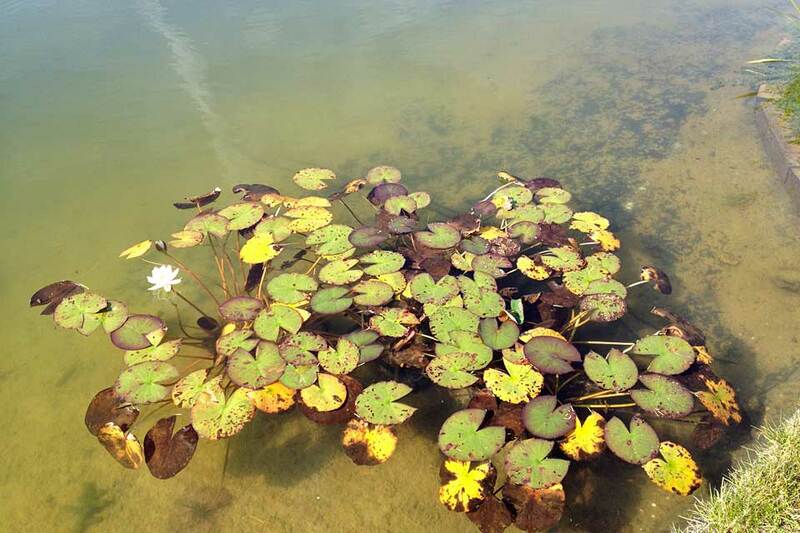 A first I think. 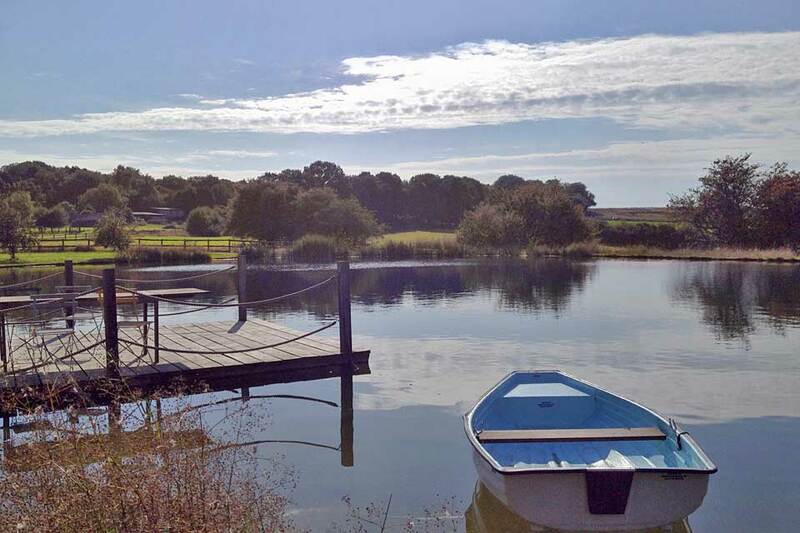 A landing stage was built using 8 inch square uprights and green oak boards. 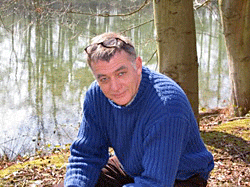 David Hall came in to carve 2 acorns on the top of the posts. 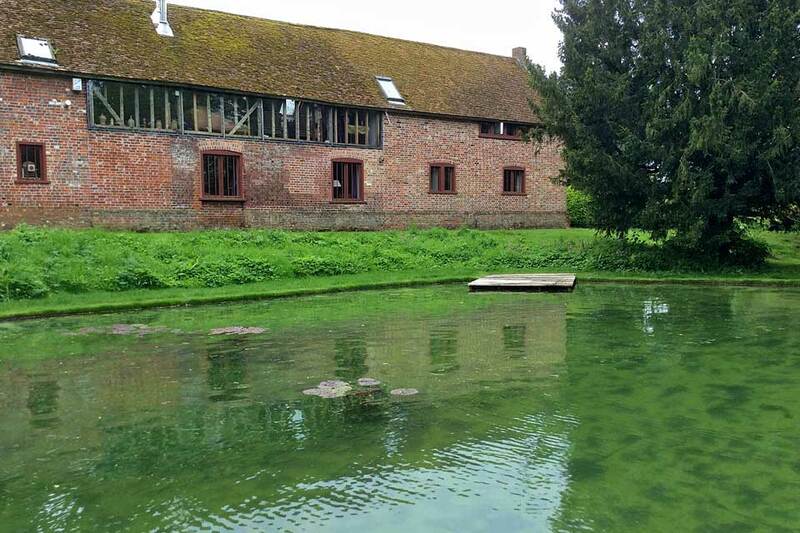 Now full, the water at time of writing is pea green and partially covered with an unattractive brown algae, which will go in time after planting with oxygenating and marginal plants. 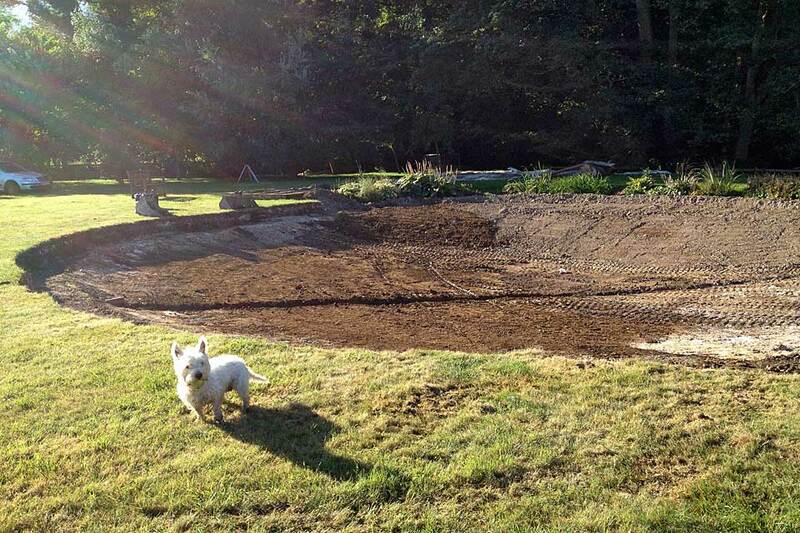 Phase one of the project project took under 6 weeks. 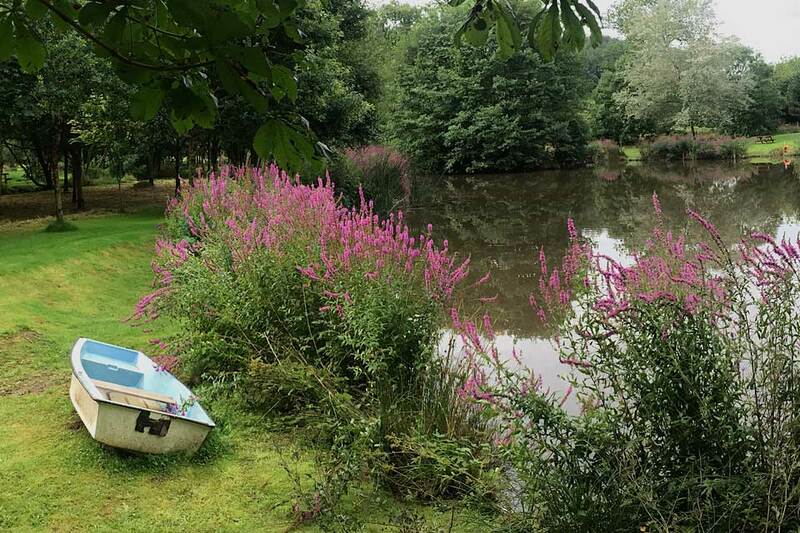 We returned in the summer. 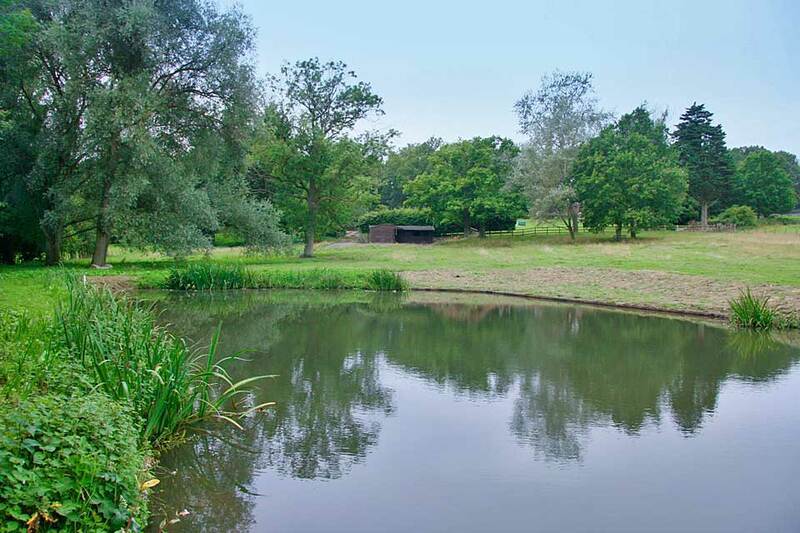 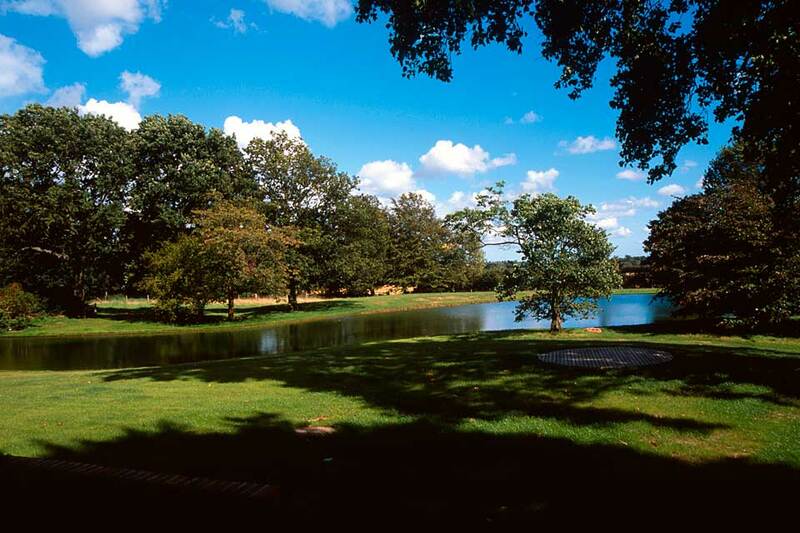 The client had bought an additional piece of land beside the lake. 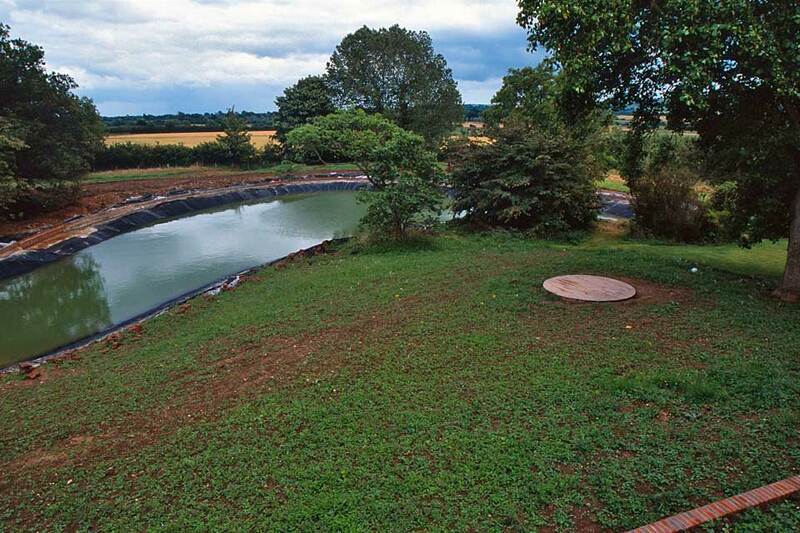 We installed additional land drains to pick up surplus water coming in from the field. 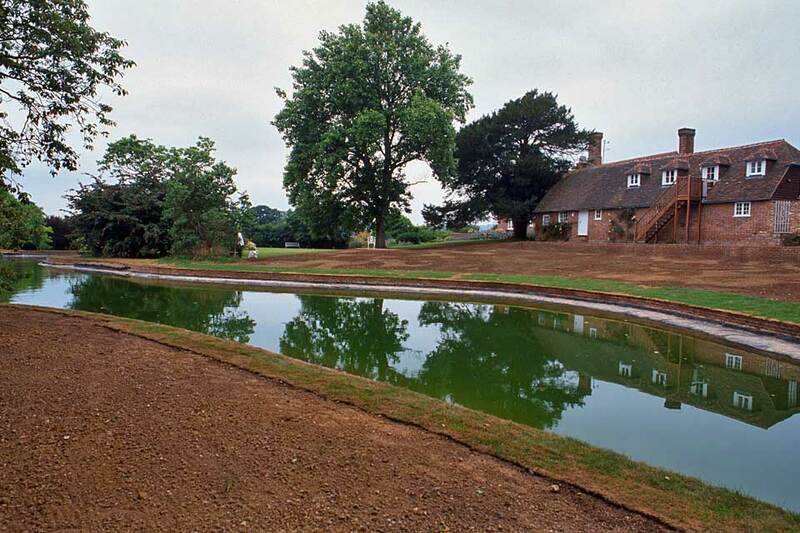 Using stored top soil, we made a level lawn on top of the detritus from the pond and landscaped the entire area. 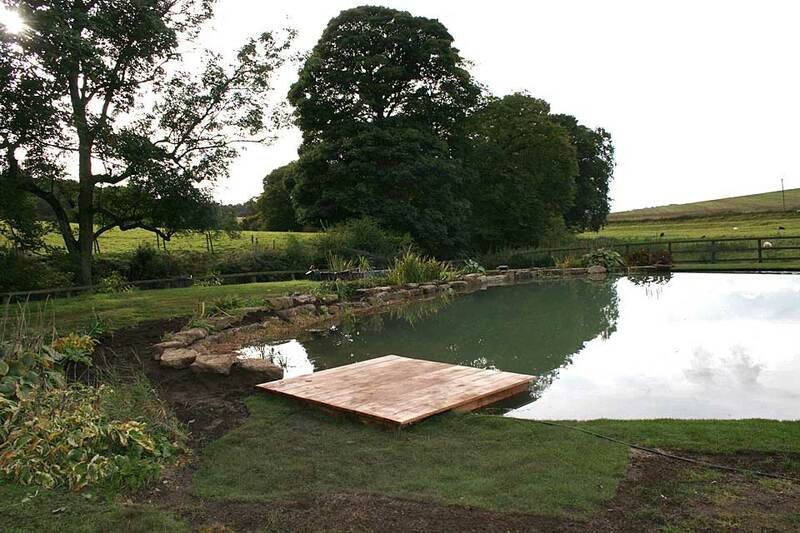 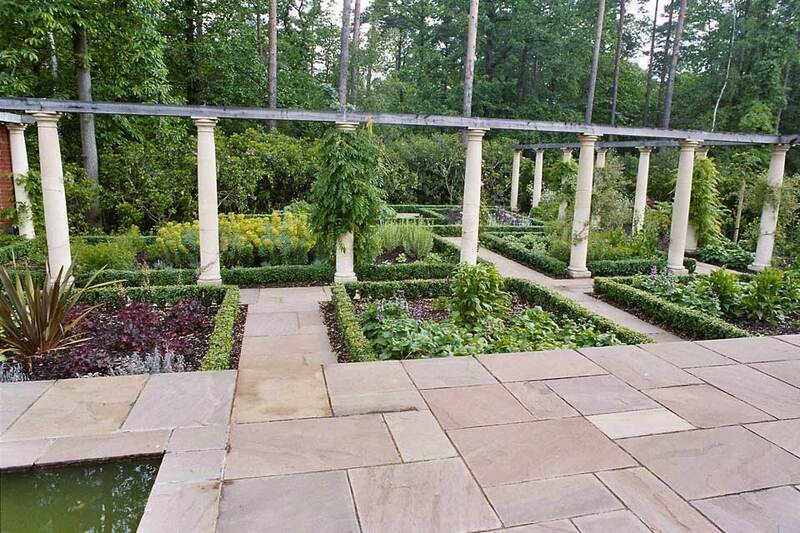 We also moved the kitchen garden and installed oak edging on large sections of the pond, creating pathways. 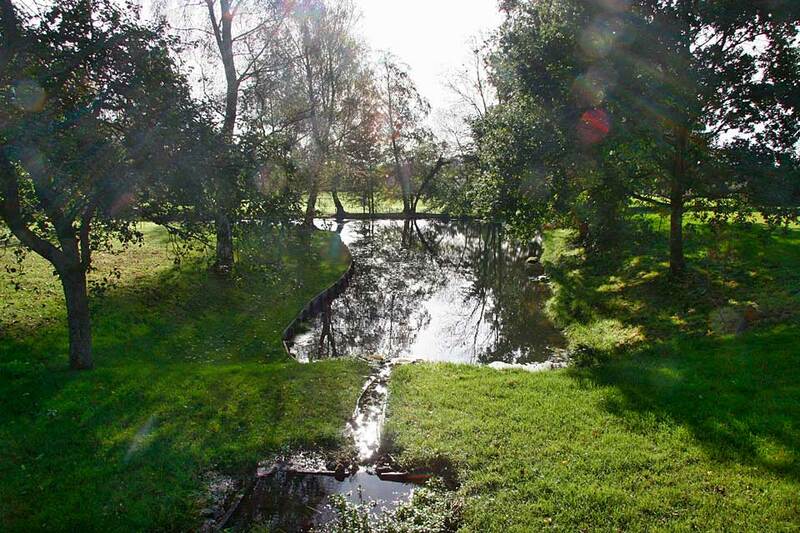 We built a small dam on the downside of the monk along a small pool which can be used as a nursery for aquatic and marginal plants. 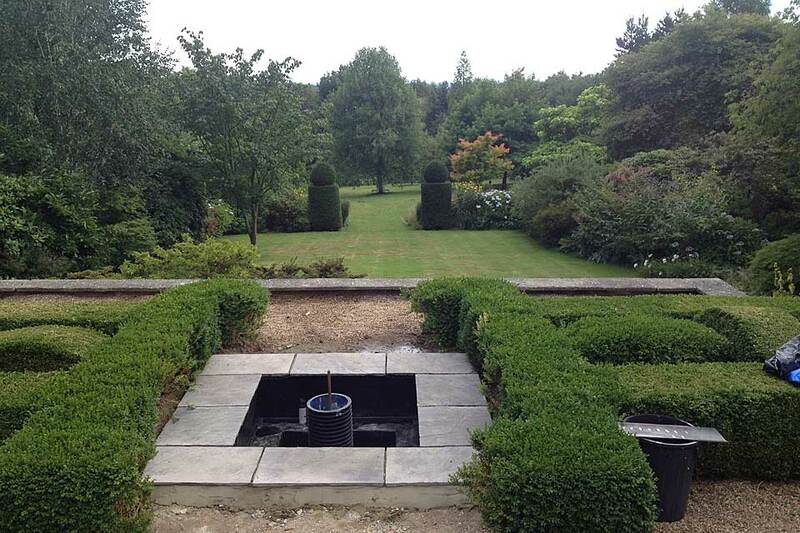 The client is delighted and hopefully the pictures speak for themselves. 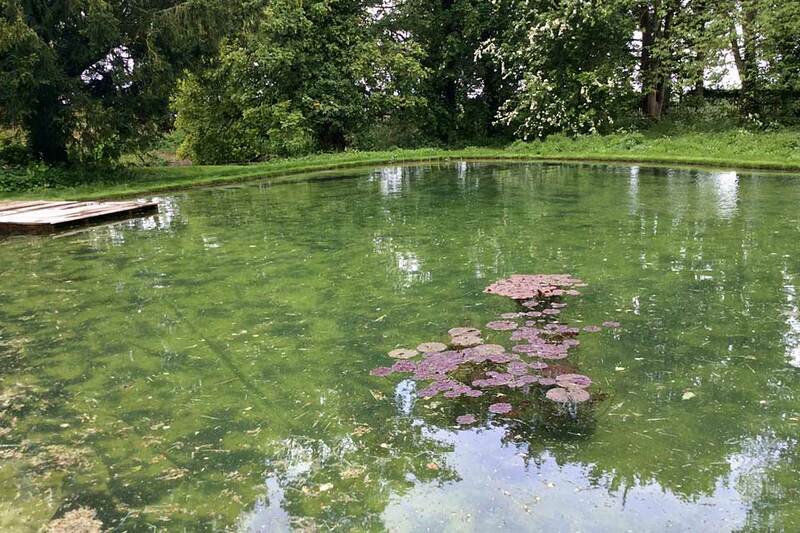 The algae which was virile in the first year is now much reduced as the aquatic planting takes hold. 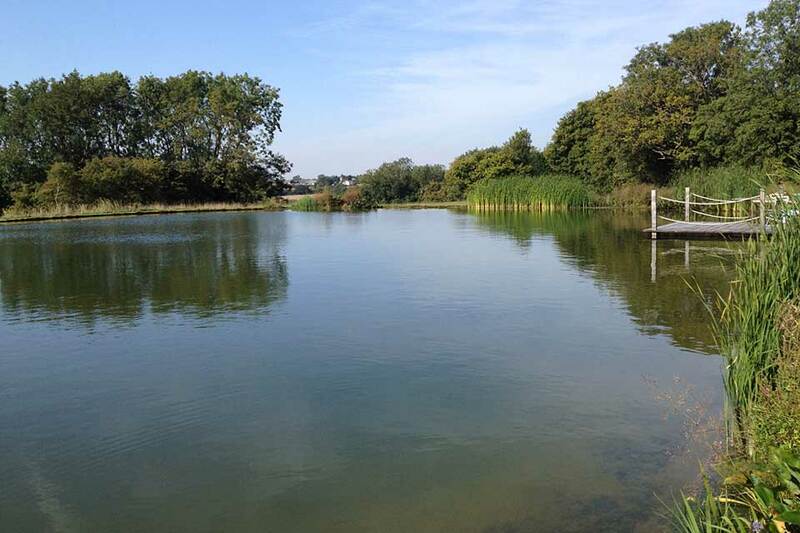 We were able to give the client a school of golden orf which now adds to the delight of the lake. 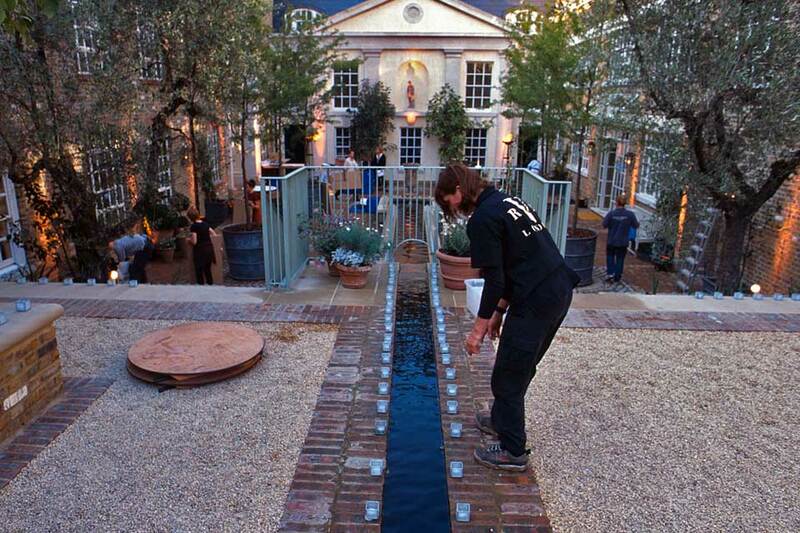 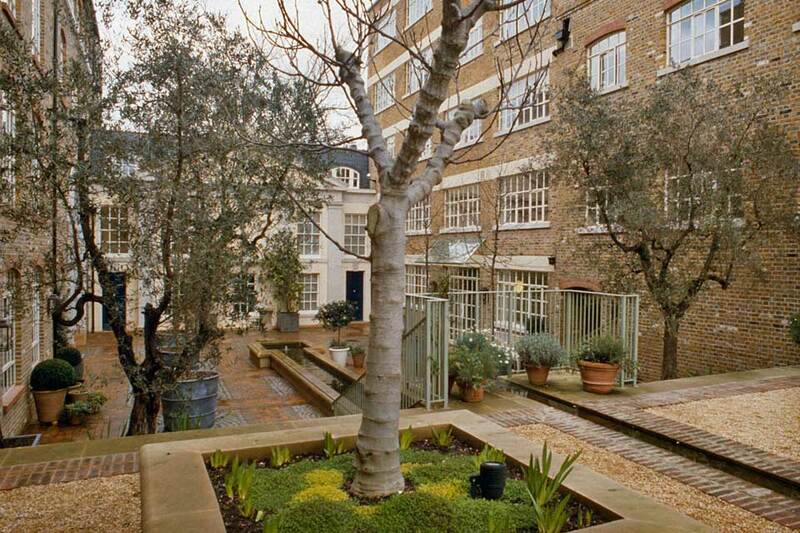 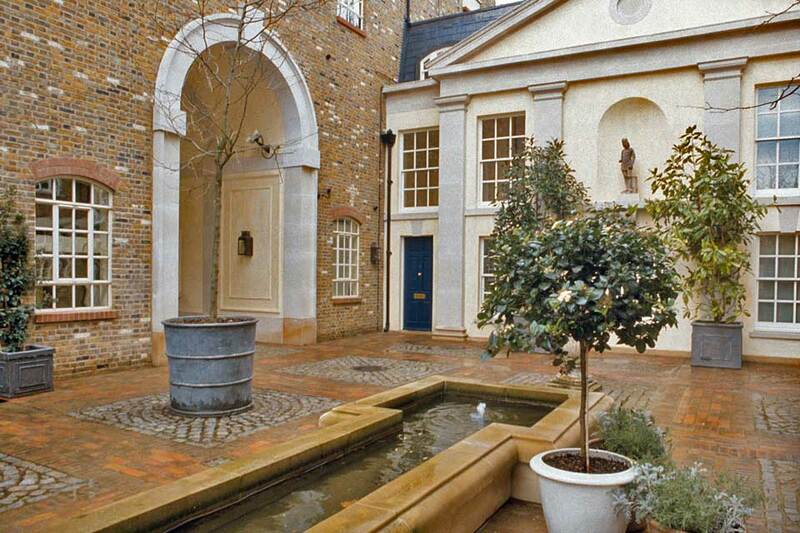 Anthony Archer-Wills was asked by the late Anthea Gibson to develop her plans and design the water features at Painter’s Yard in central London. 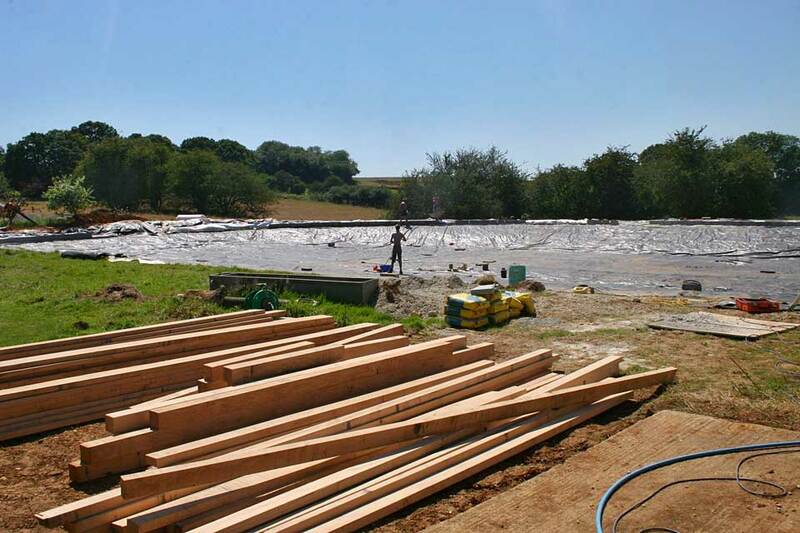 Waterlands Productions were appointed as contractors. 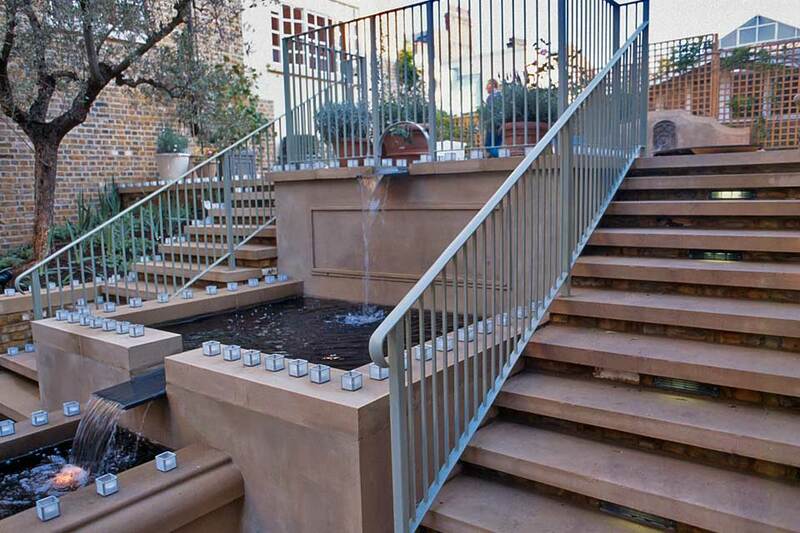 The project, in Church Road, Chelsea, was undertaken at the same time as the main contractors were refurbishing the enclosed development. 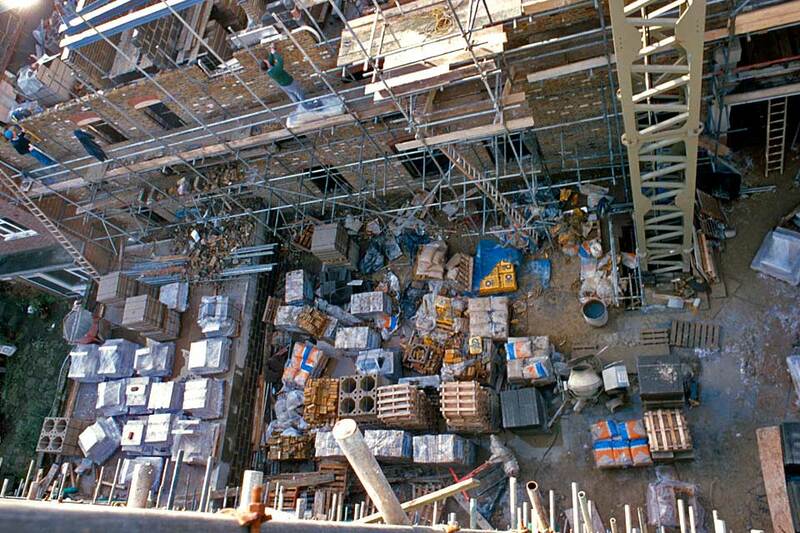 The principle challenges we had were in moving materials and building whilst allowing the main contractors access. 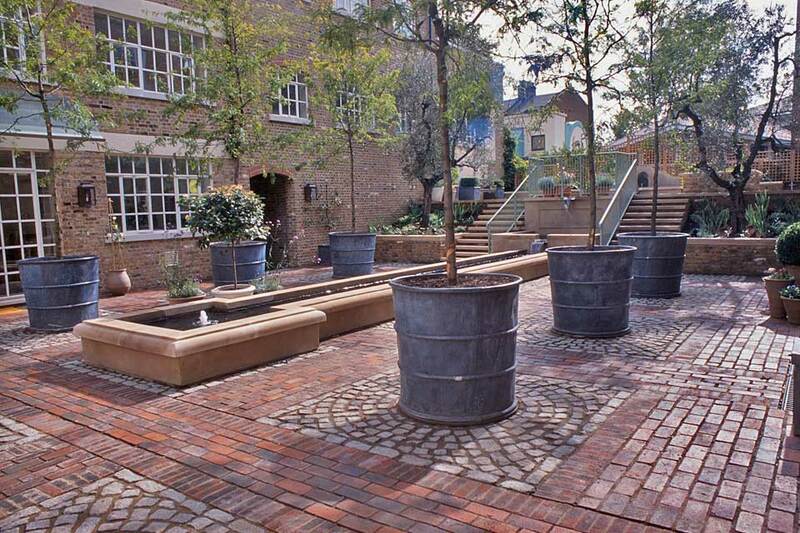 The main courtyard development was on top of a newly-constructed underground car park and the services for the fountains were in a small raised area near the approach ramp. 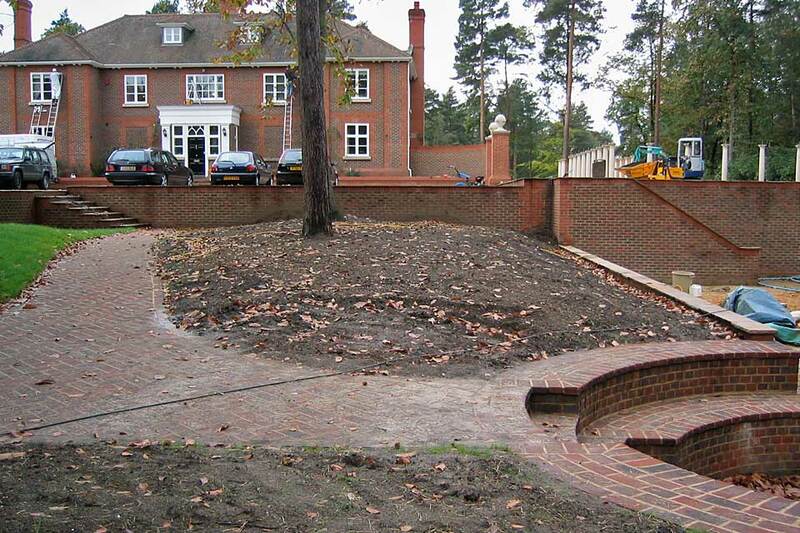 As can be seen, the project was a great success and after completion we maintained the features for a number of years. 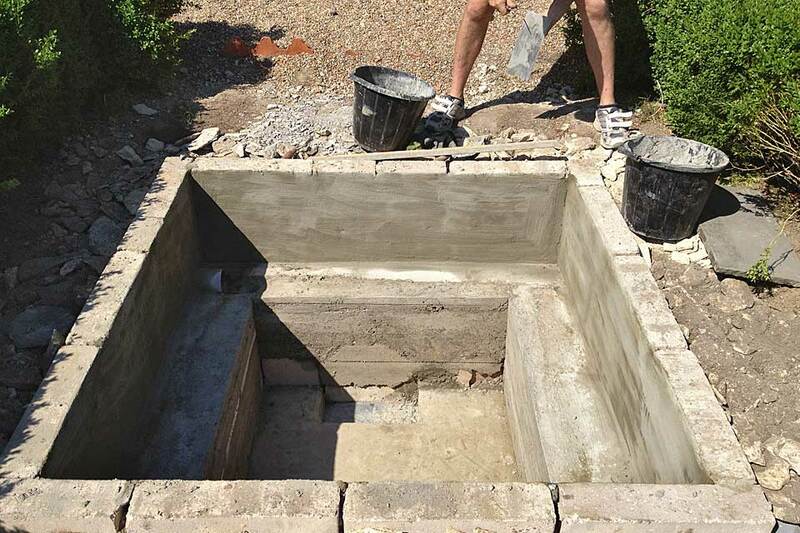 We were on site for about 4 months. 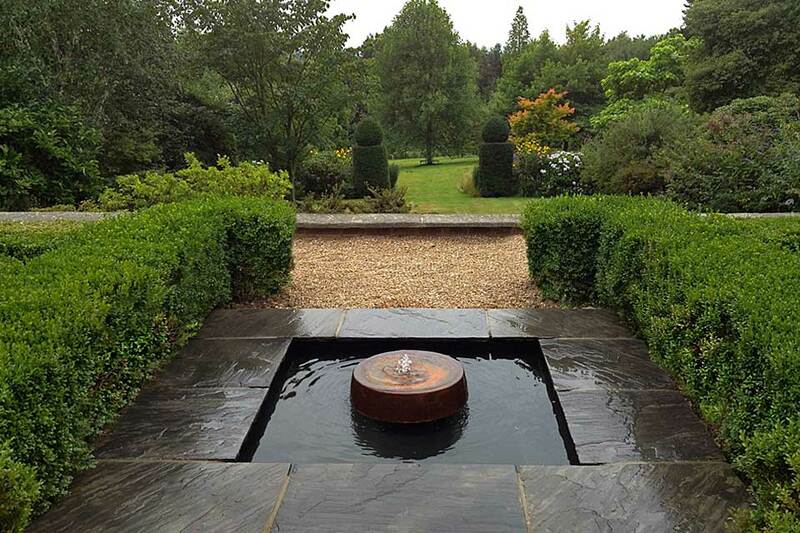 Working with with a local interior designer in Reigate, we built a small, lined pond which incorporated oak decking, a water filtration system, stepping stones and a power supply for a Humphrey Bowden Fountain. 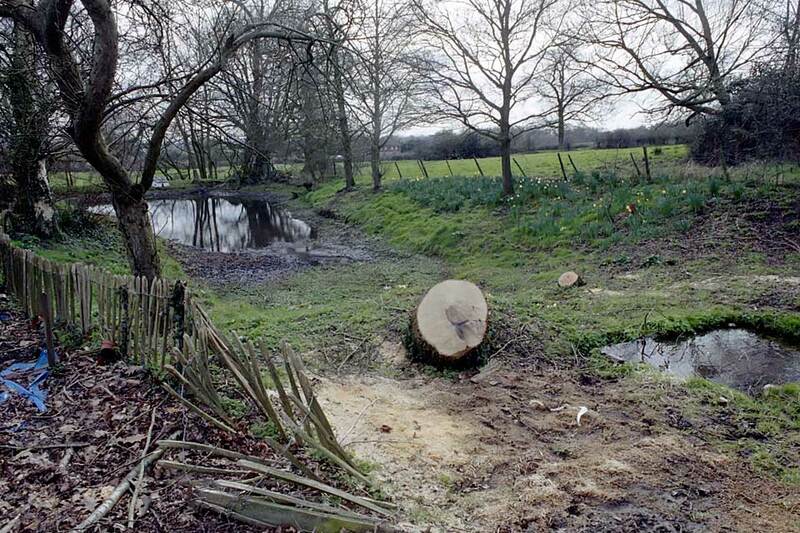 In the last picture, 10 years later, you can see the results. 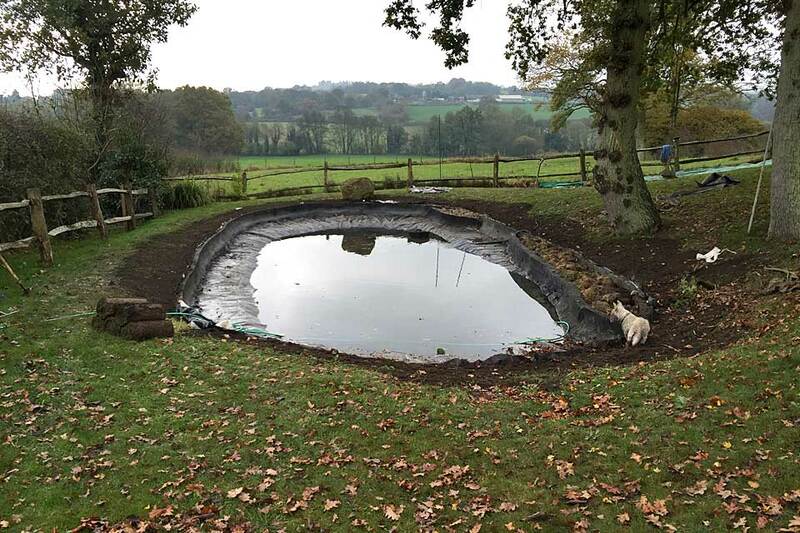 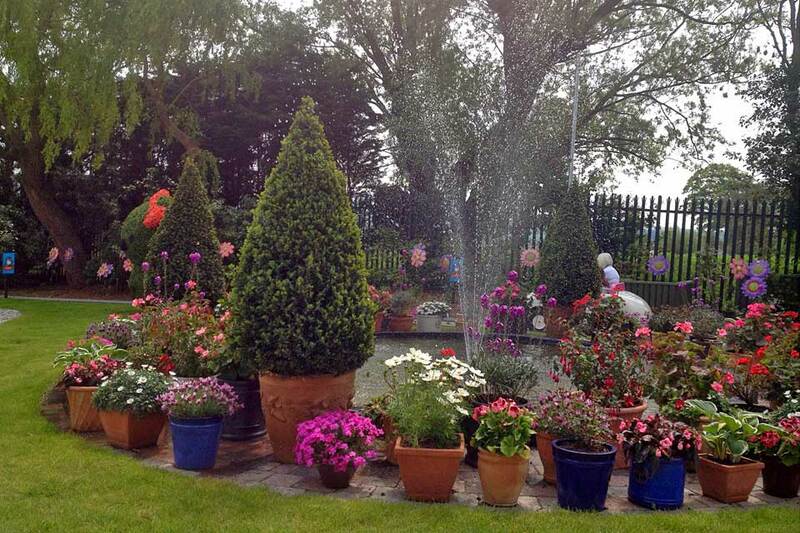 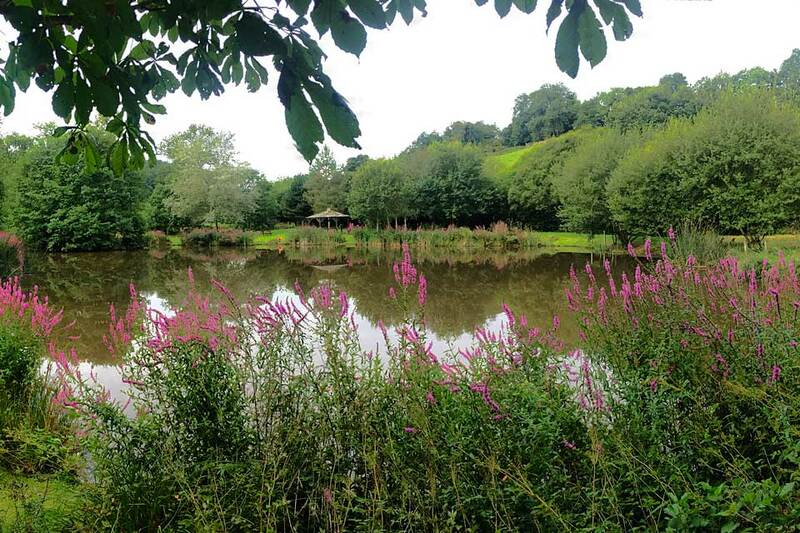 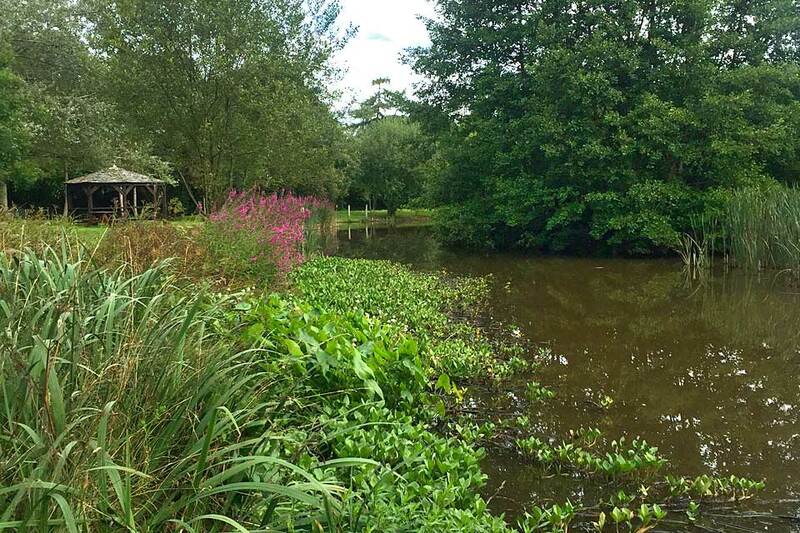 The new owners of Tinley lodge asked us to improve a shallow silted up pond area. 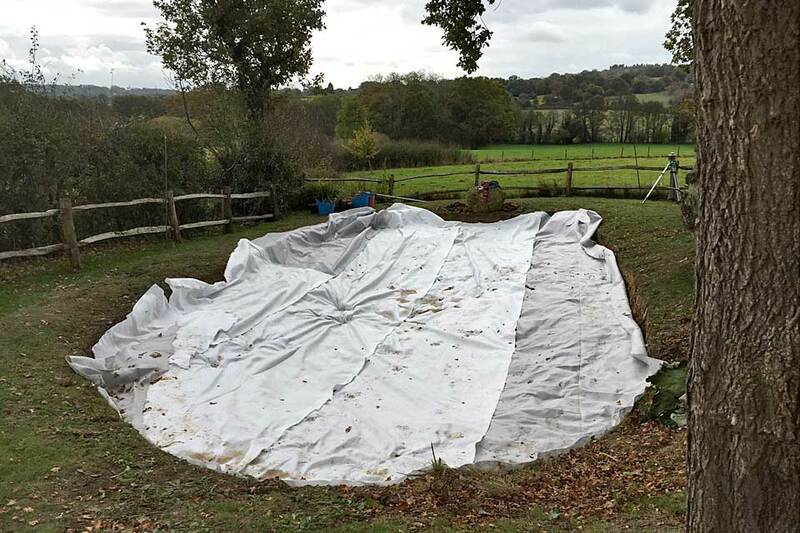 We removed the detritus to a dip in a nearby field, covering it with topsoil and seeding it. 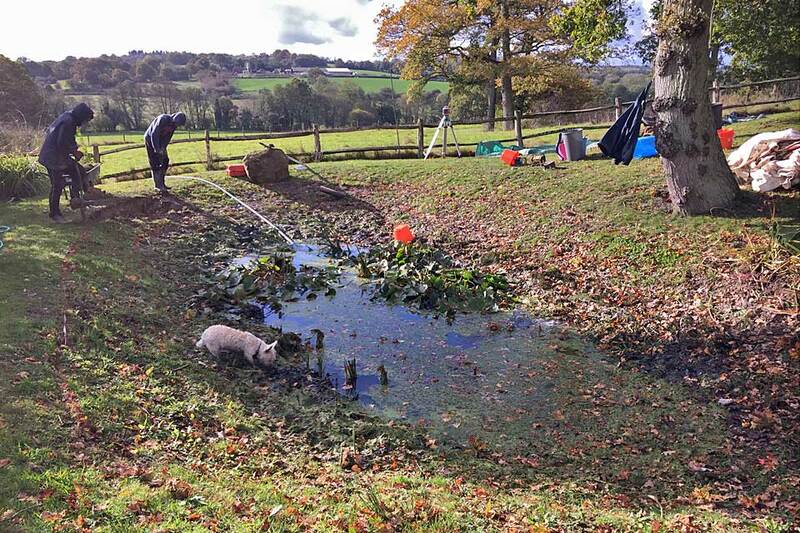 We dug and reshaped the pond, moving the embankments and thus the pond, raising the water level as high as practical. 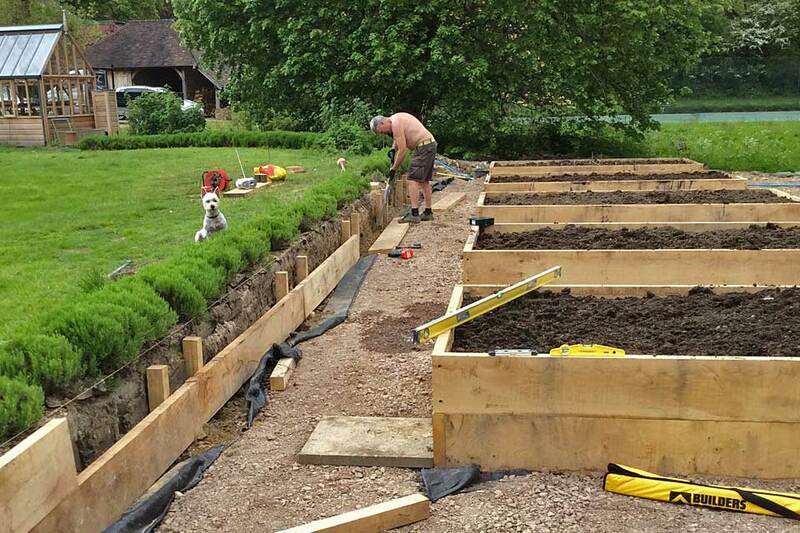 Using saved topsoil, we finished and seeded the perimeter, which had a protective hard edge and built a green oak decking large enough for the family to gather. 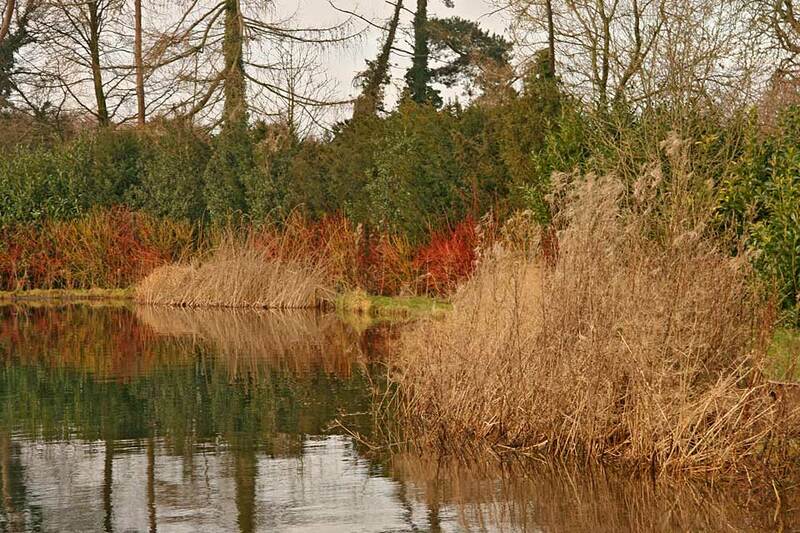 Planted in the autumn, we do not expect it will be at its best until the spring. 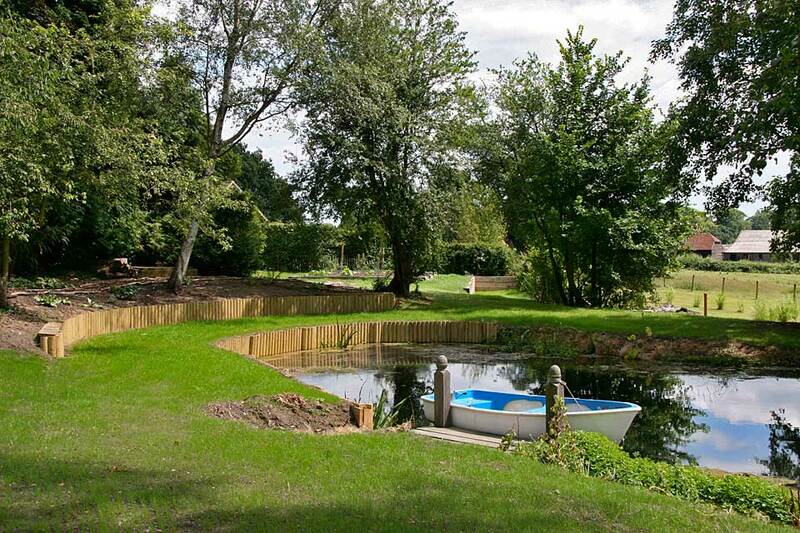 Tim, a theatre set designer designed a small pool to go in his magnificent garden. 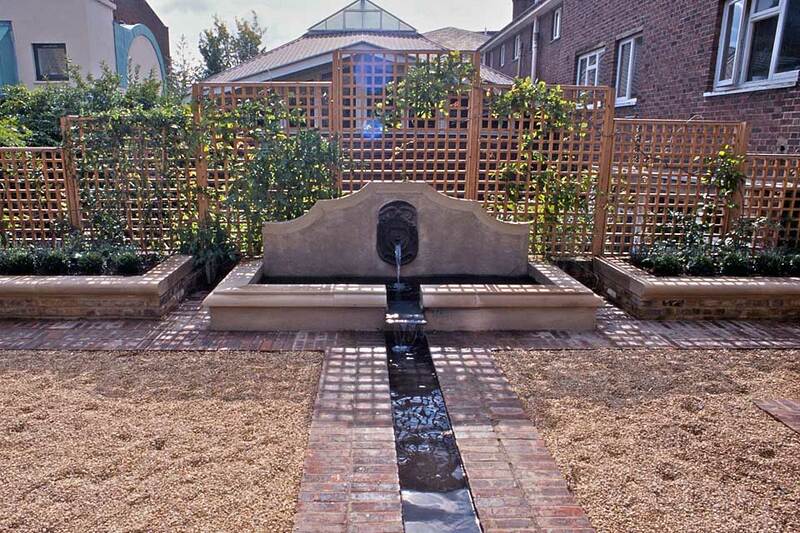 This we achieved using concrete blocks, bricks and fibreglass. 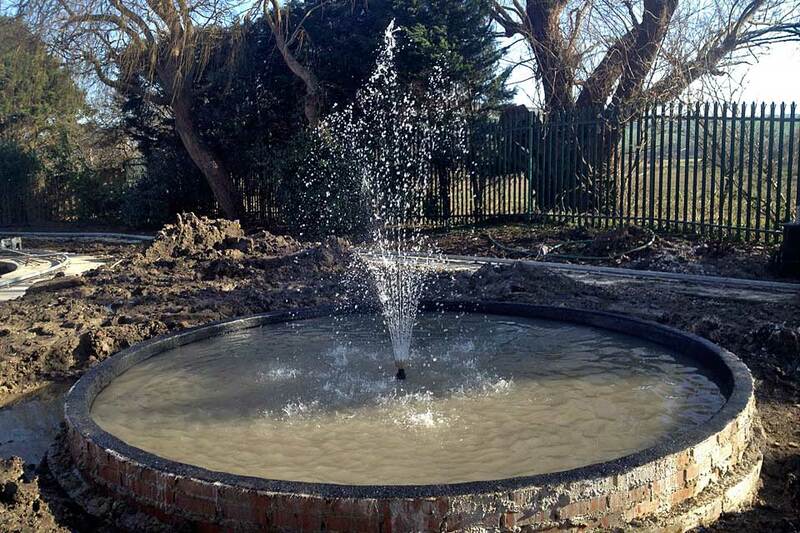 We built in an automatic top up system which also provided power for the fountain he later brought in.